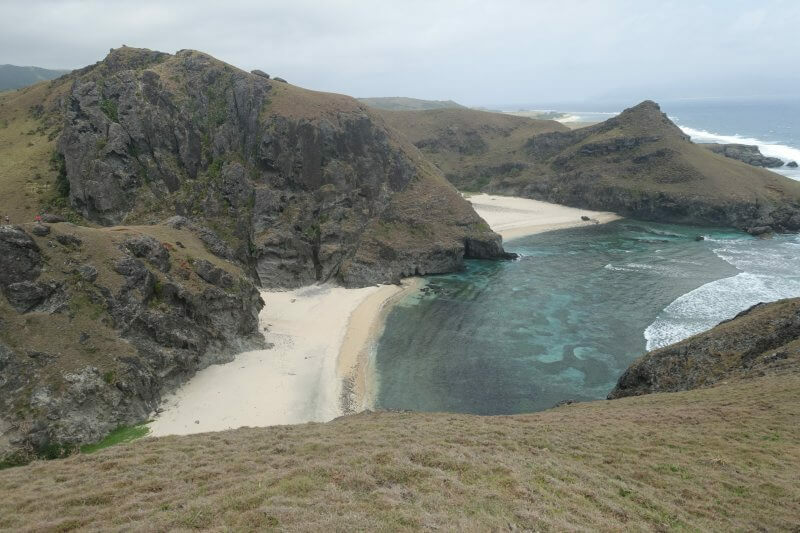 In a nation that never seem to run out of breathtaking destinations such as Palawan and Boracay, Batanes, a paradise of its own, has managed to remain relatively unvisited. 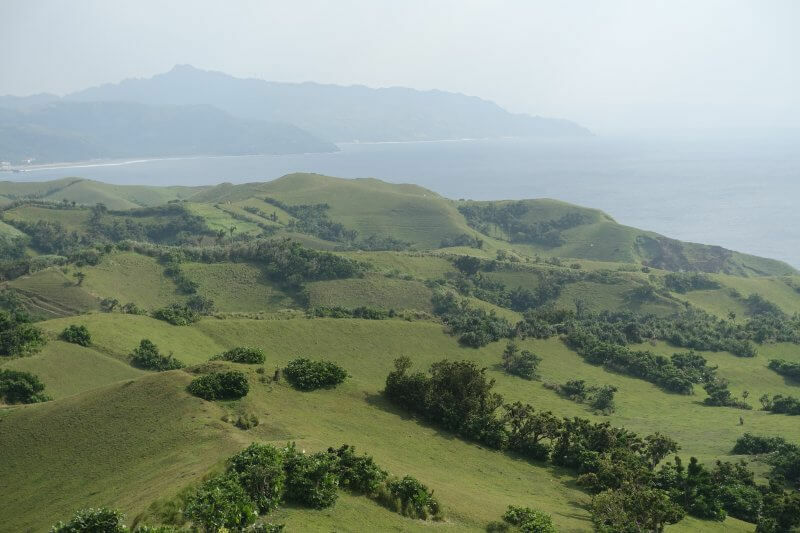 Just an hour flight out of the busy capital of Manila, Batanes, in the Philippines, is perfect balance of accessibility, sufficient infrastructure, and stunning natural sights. 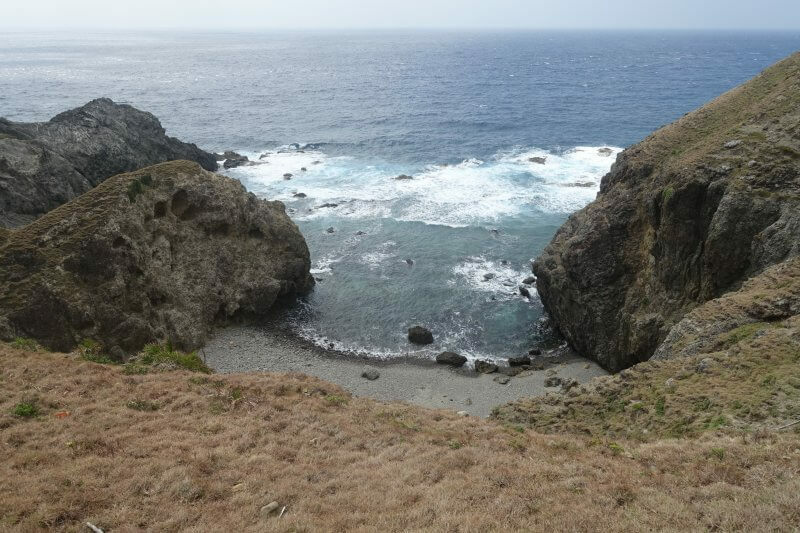 As a frequent host of strong typhoons, Batanes proudly exhibits the heavy brush strokes left by incredible forces of nature, like a huge open air art gallery. After our first group trip to Rinjani in Indonesia last year, my friends and I had been looking for our next stop. 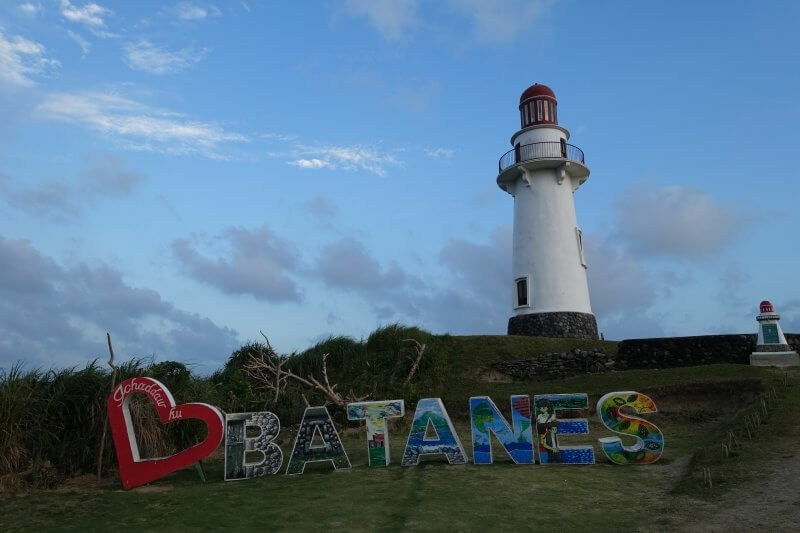 Someone, somehow, along the way, brought up Batanes. 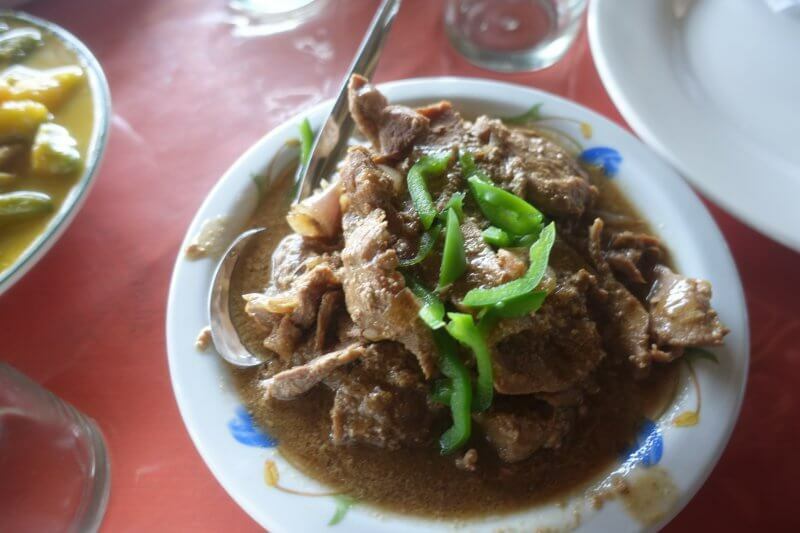 We’ve never heard of this place, but our Filipino friends were raving about it. Searches of this magical place brought up endless superlatives by both those who had visited, and those who dreamt of visiting. 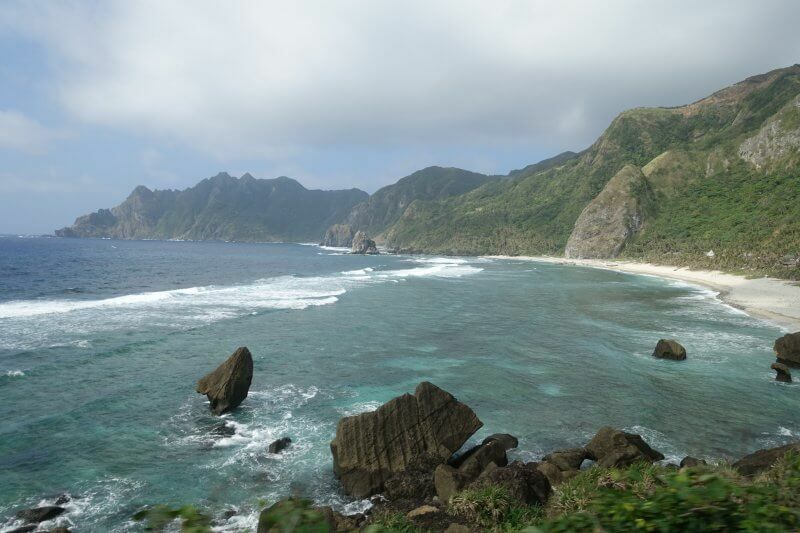 A month later, we were again up in the air (unfortunately just 4 this time), on our way to the fabled land of Batanes, Philippines. 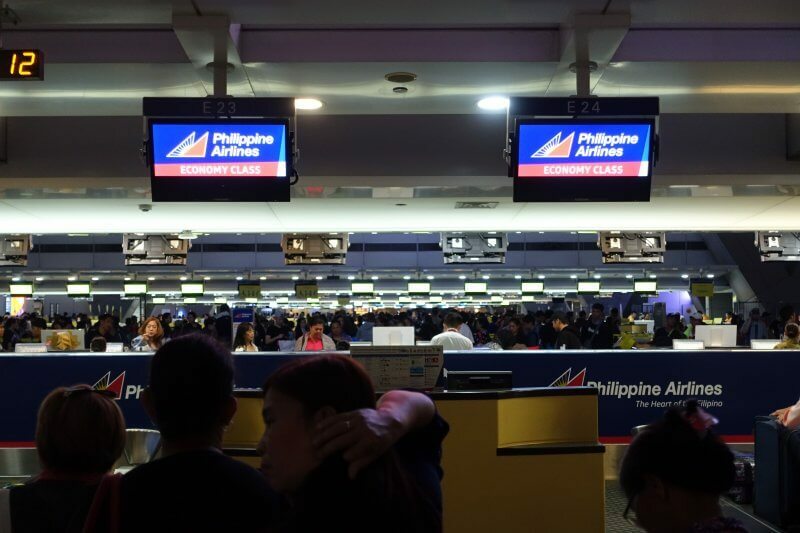 The flight to Batanes leaves early in the morning from Manila, so we took the night flight from Singapore and spent a few hours at Terminal 2 of Ninoy Aquino International Airport. Not the most comfortable of places to spend the night, but a fun experience nonetheless. Shops on the higher floors were opened through the night and there were areas around where one can catch some winks. Queuing for our flight to Basco at Ninoy Aquino Internation Airport. 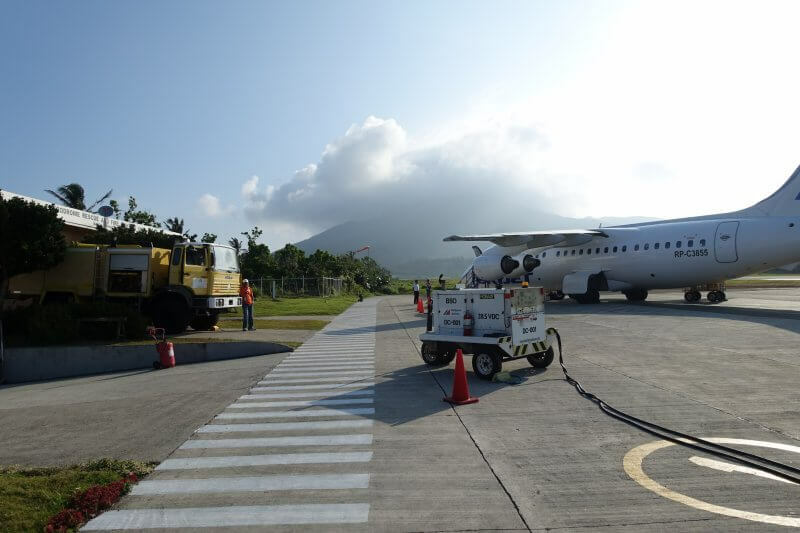 Basco Airport, its short runway ending at the foot of Mount Iraya, an active volcano. 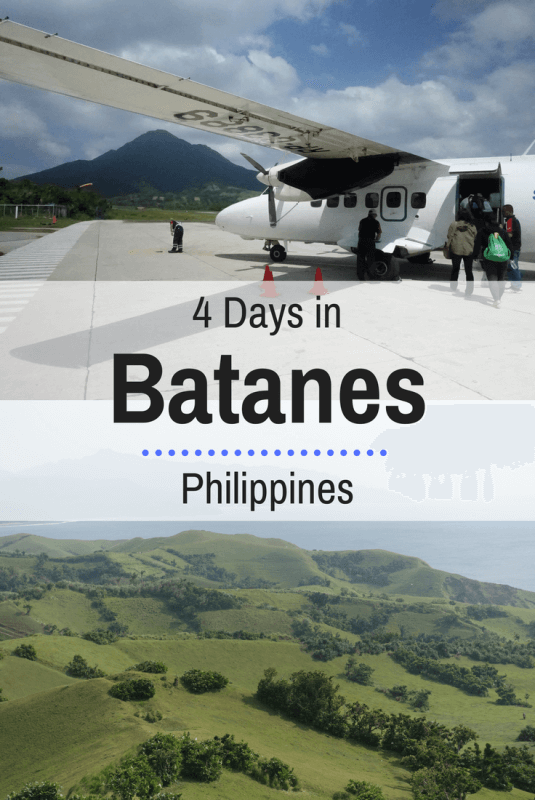 There are 2 daily flights to Batanes from Manila, both leaving at almost the same time early in the morning. During peak travel season there are additional schedules. 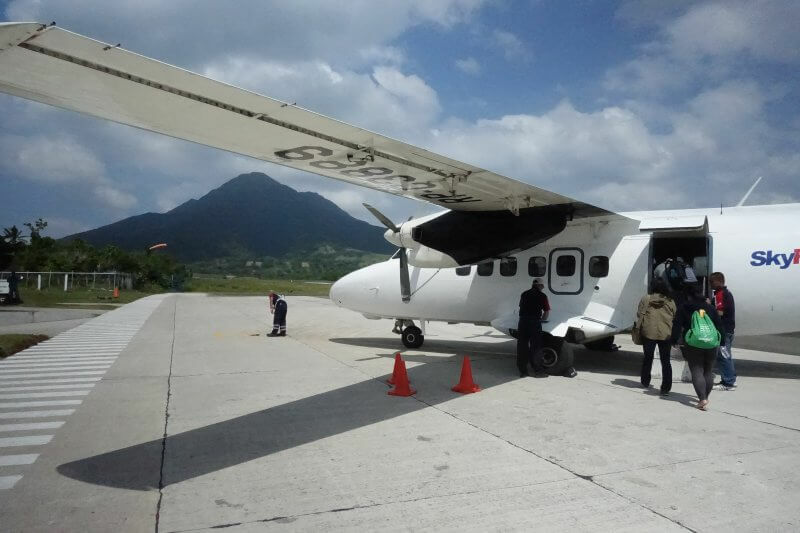 We took the one by Philippines airlines and arrived on a clear sunny morning in Basco, on Batan Island, the main entry point to Batanes, a group of island in the northernmost part of the Philippines, not far (geographically) from Taiwan. 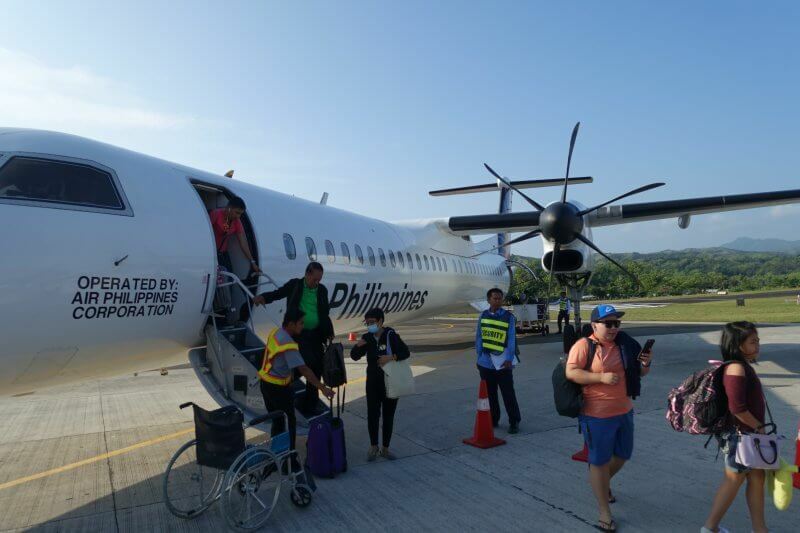 The propeller plane which got us to Batanes. As this trip was planned a little late and we had been busy with work, we decided to go with a tour with BISUMI tours. 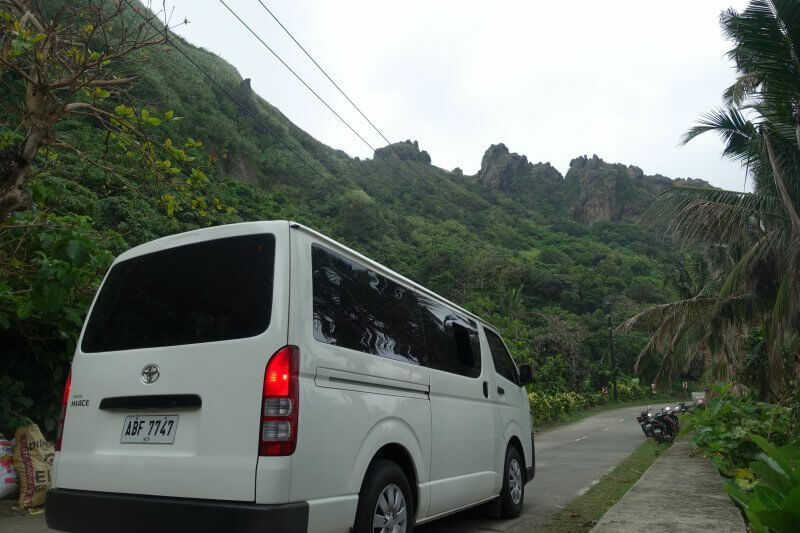 They handled our airport transfers, itineraries, and lunches during the tours so that was a load off our minds – one of the few trips with a greater resemblance to a holiday. 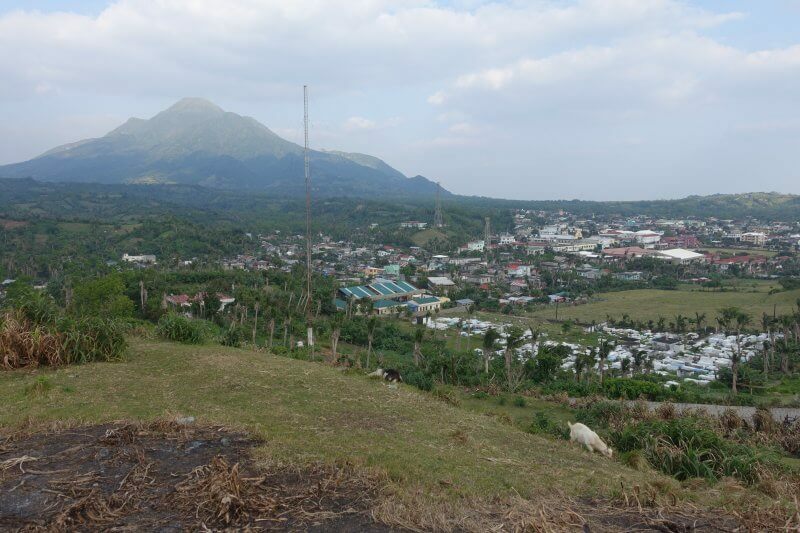 Basco is a small town, relatively easy to get around without maps or a guide. 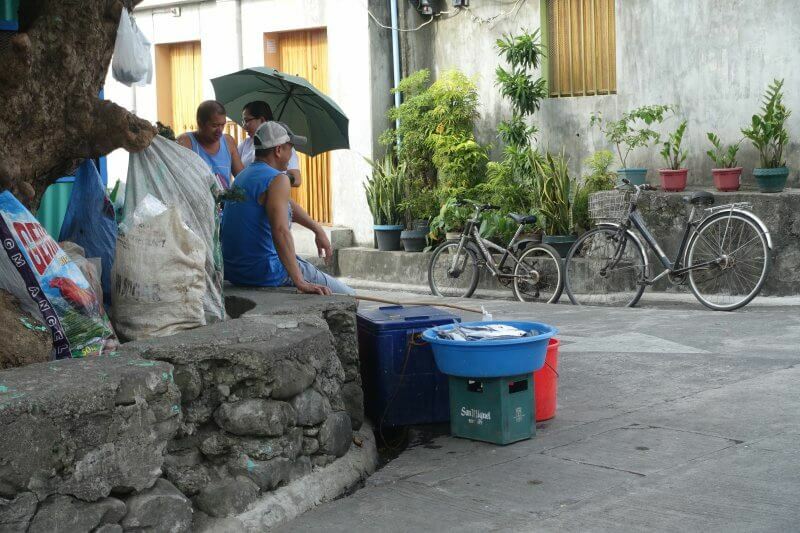 Pleasant for a late morning/ early afternoon walk, meeting friendly locals and soaking in the relaxed atmosphere. 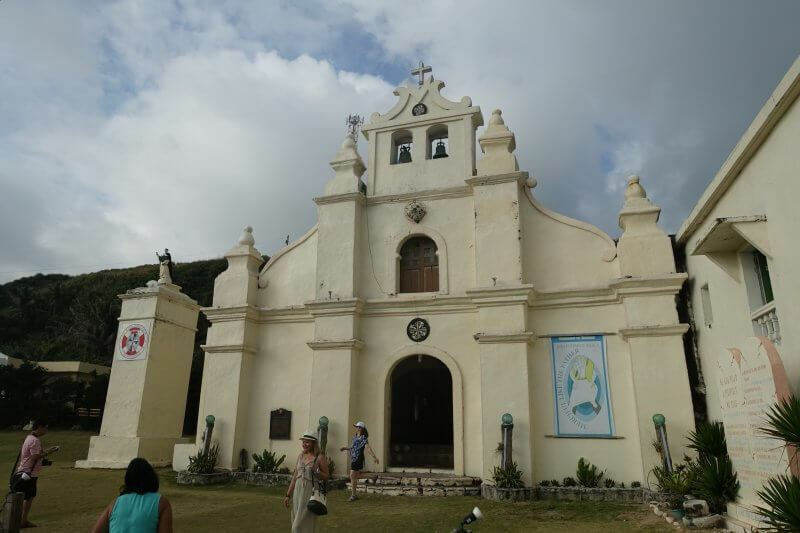 First impressions of Batanes, in Basco. Quaint, quiet, and a little quirky. Quite an experience getting stuff from such stores, as they are dimly lit and can extend some way in. The range of products can barely be seen from where you’re allowed to stand – outside the window. Fortunately, we had a good camera with us which allowed us to zoom in, take a photo, then zoom in again to have a better view. 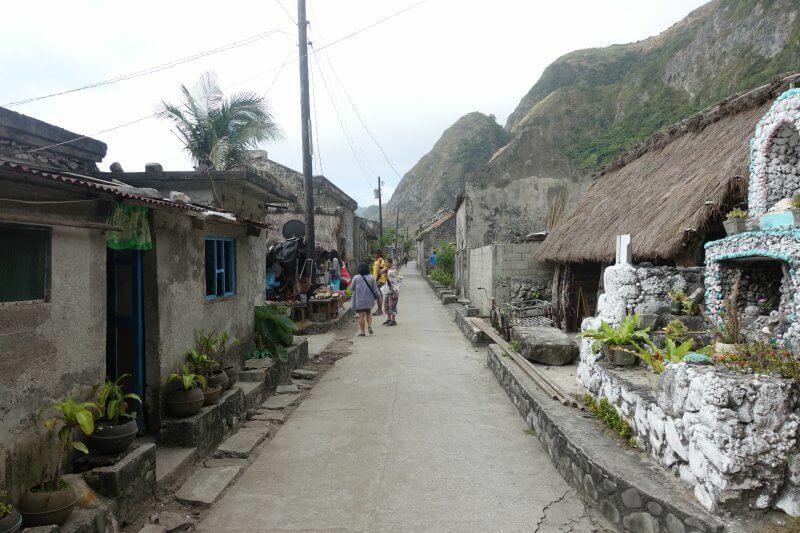 The streets of Basco in Batanes were incredibly clean, but there was a post apocalyptic feel about this place. This place seemed to have been left behind in time. Or perhaps the battering by typhoons had taken its toll. 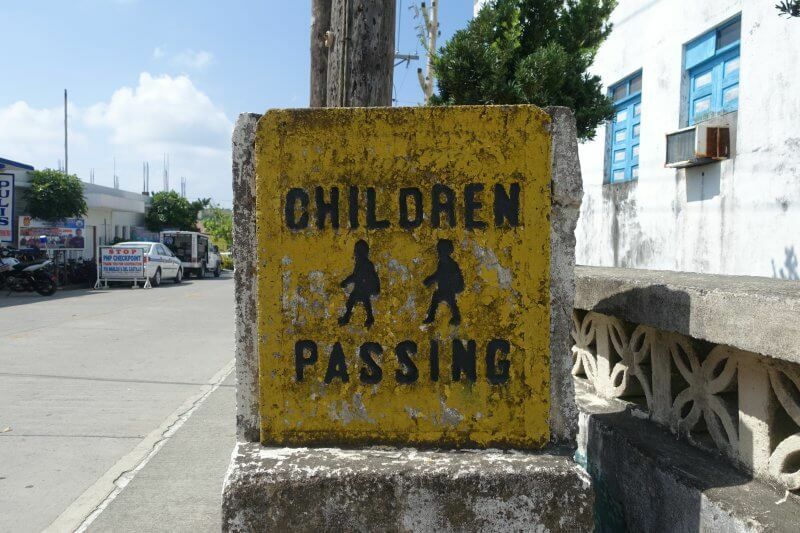 Instagram friendly street signs like these were plenty. 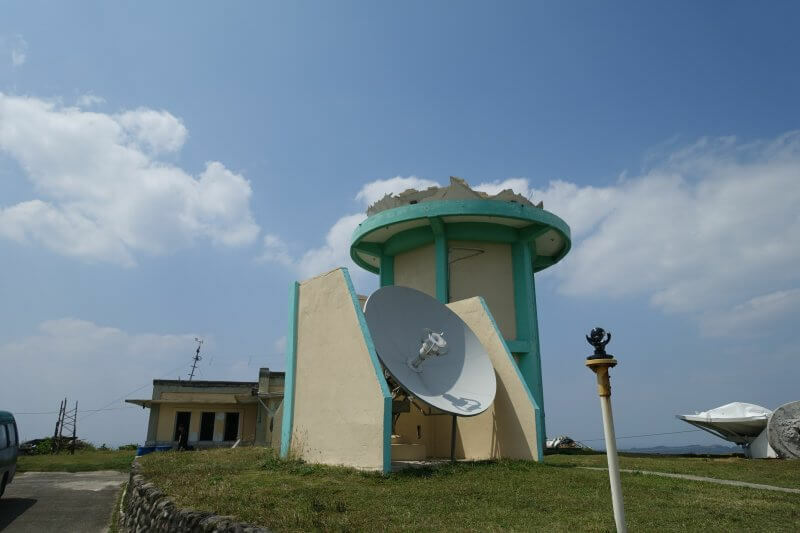 When we were there in April 2017, 3G signal had not yet been restored after Typhoon Ferdie ripped through 7 months earlier. 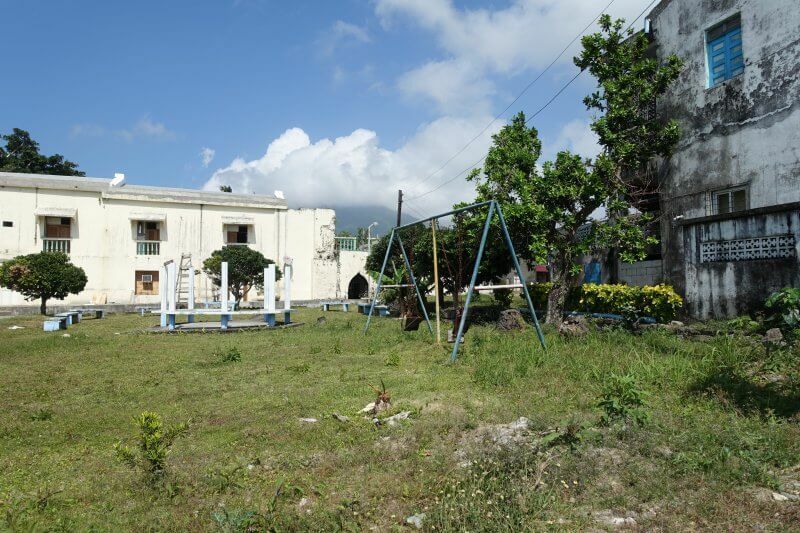 Like this of a deserted, slowly decaying playground. 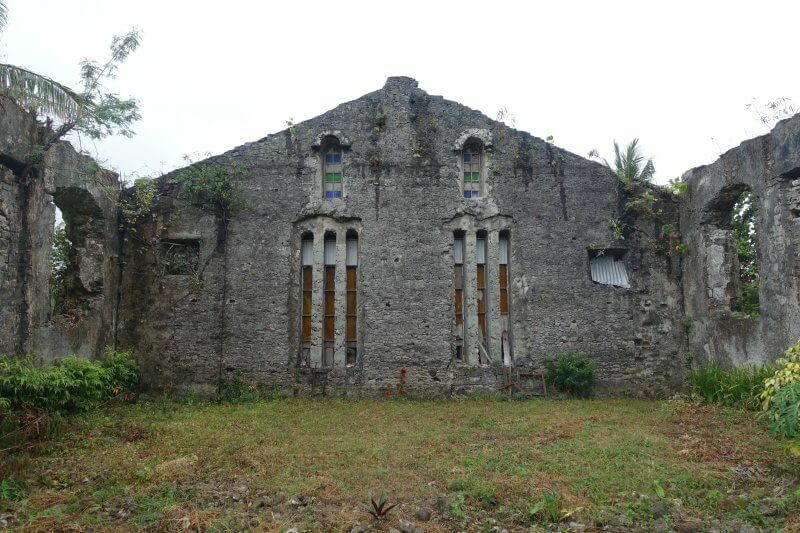 Or this of old crumbling stuff, probably having been battered by typhoons for decades. 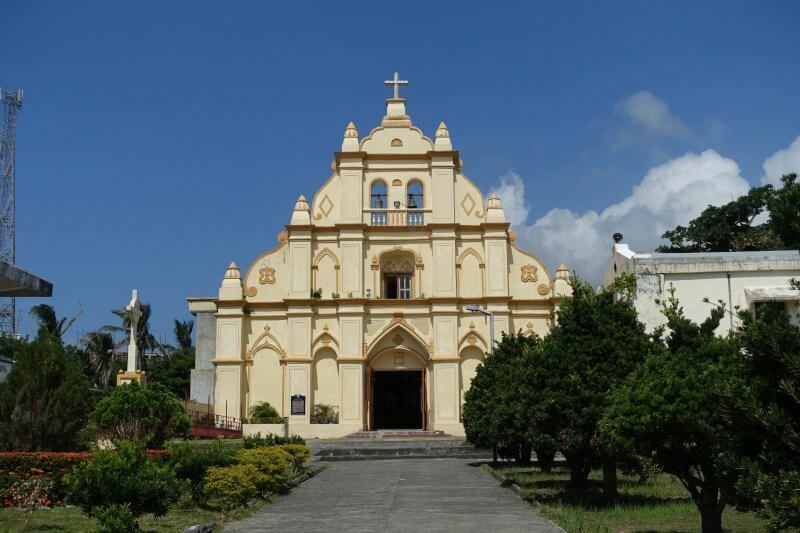 Our Lady of Immaculate Conception, or Santo Domingo Cathedral, the first church in Batanes. Local life was interesting to observe too, though we might just have been just as interesting to observe, given the low number of tourists and even rarer foreign tourist. Kids bringing their pigs out for a walk, taking a break in the shade. I swear this was a painting. 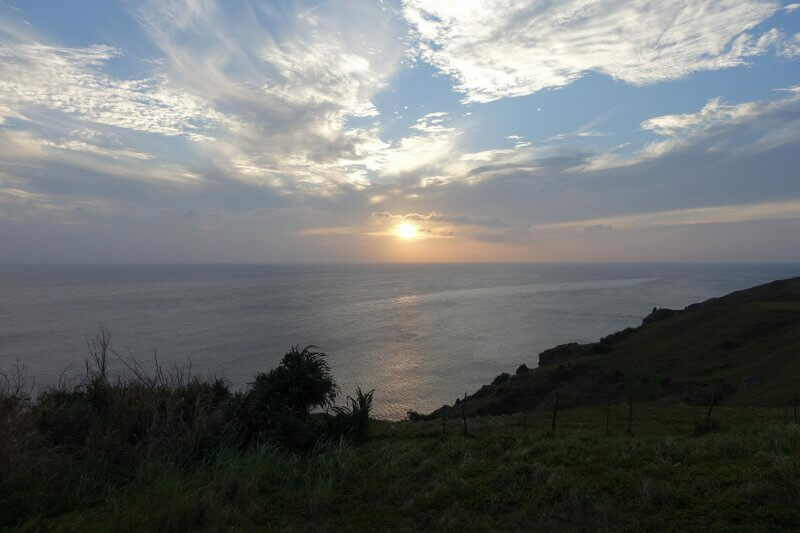 Later in the afternoon, as part of our tour package, our guide took us to Basco Lighthouse to catch sunset. Nice lighthouse with pretty views all around. 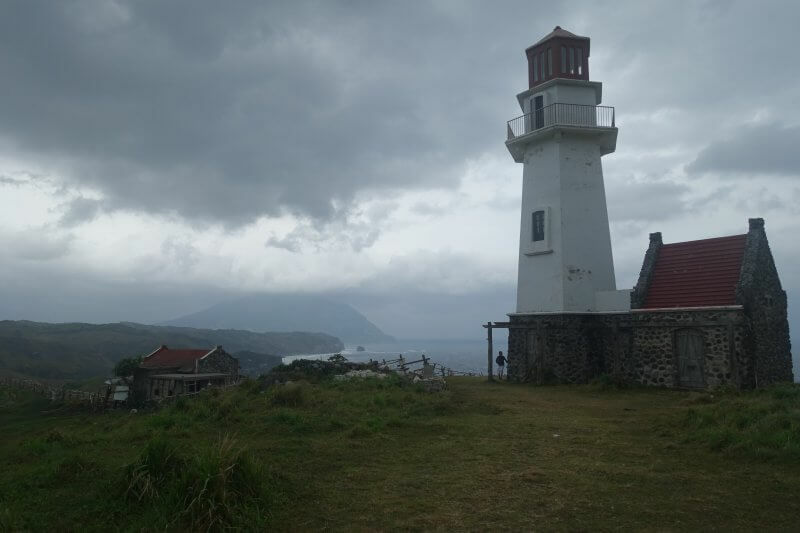 Basco Lighthouse is situated on a hill, which offered great open views across Batan Island. The lighthouse, open to public, offers a slightly better view. And stronger winds. The sun setting across the endless ocean. 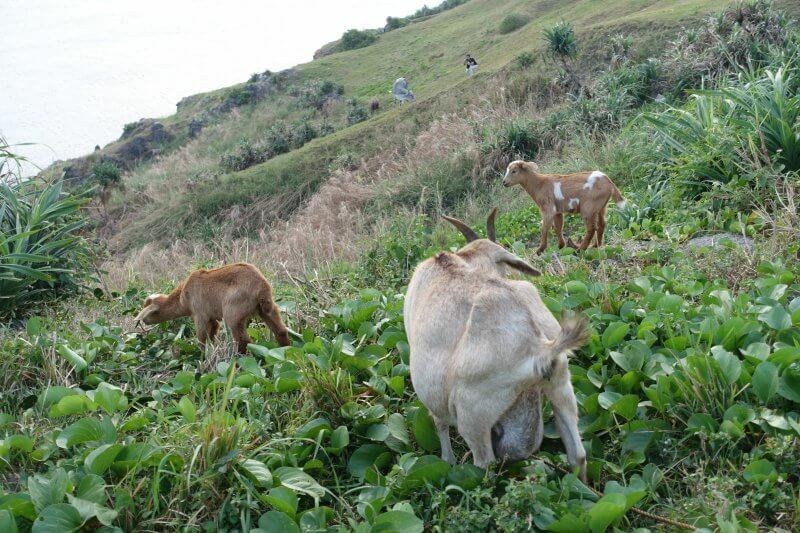 Pregnant goat and her kids. Near the lighthouse are old American bunkers from before the last world war. As the sun slipped away, we made our way to Octagon, a restaurant along the coast further down from the port, for dinner on their open deck. The view from our dinner table at Octagon. Gets windy, the chills with the feels. 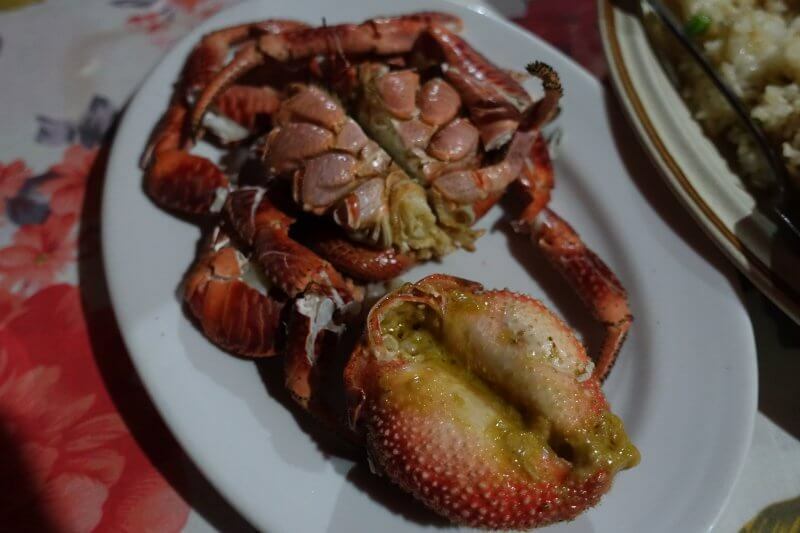 Coconut crab! The strawberry looking thing was filled with the vilest smelling thing ever. Never again. The meat on the legs had a hint of coconut, which was refreshing. 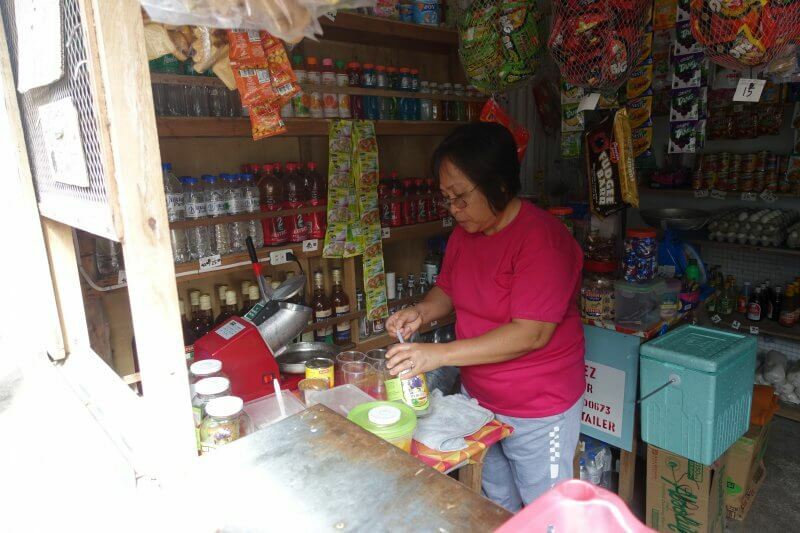 Food was okay, and there weren’t many options in Basco, so I guess we couldn’t complain. Had our fill and turned in early in anticipation of the early start the next day. We had to start early as there was only a morning boat trip a day to the nearby island of Sabtang. 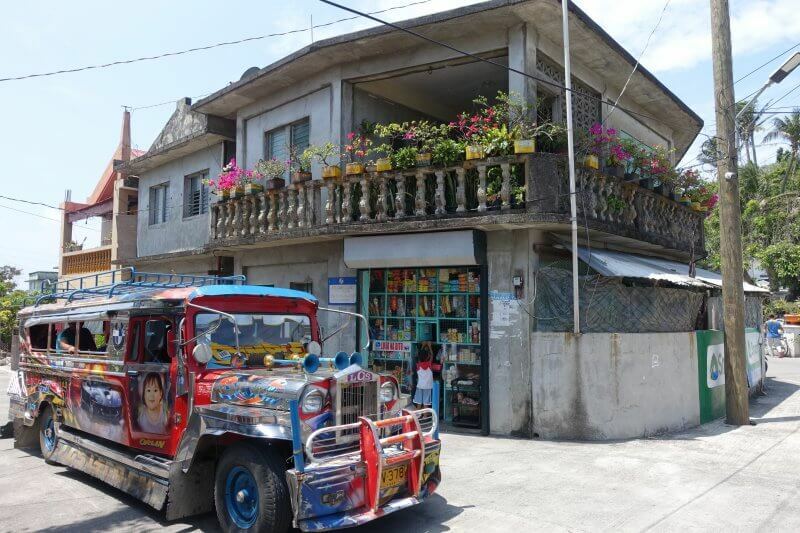 Had a simple breakfast of bread and other snacks we assembled from the many minimarts around Basco and found our van already waiting for us below our guesthouse. 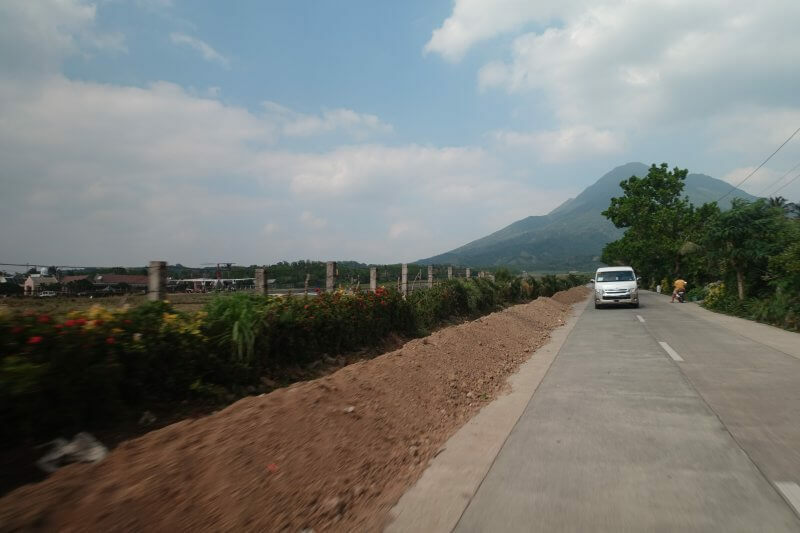 First, a drive along National Road halfway round the island to the Port of Ivana. 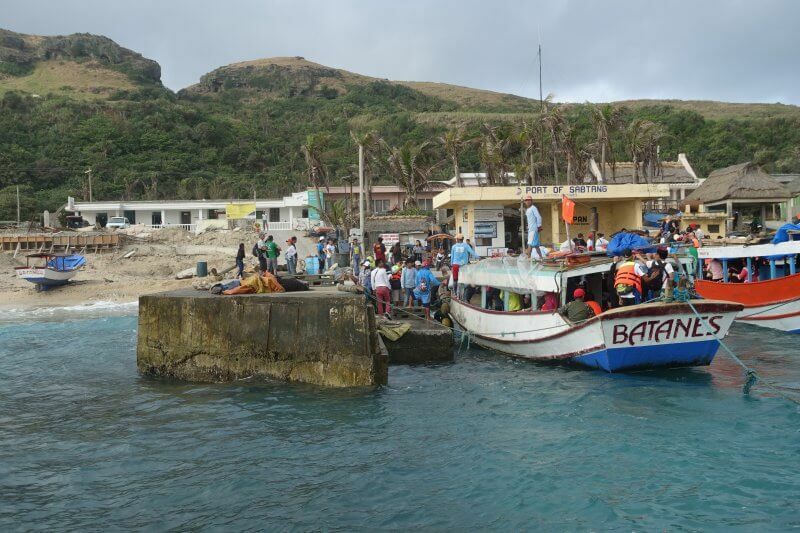 On the way to Port of Ivana, passing the Mahatao Boat Shelter, which protects boats during the typhoons. 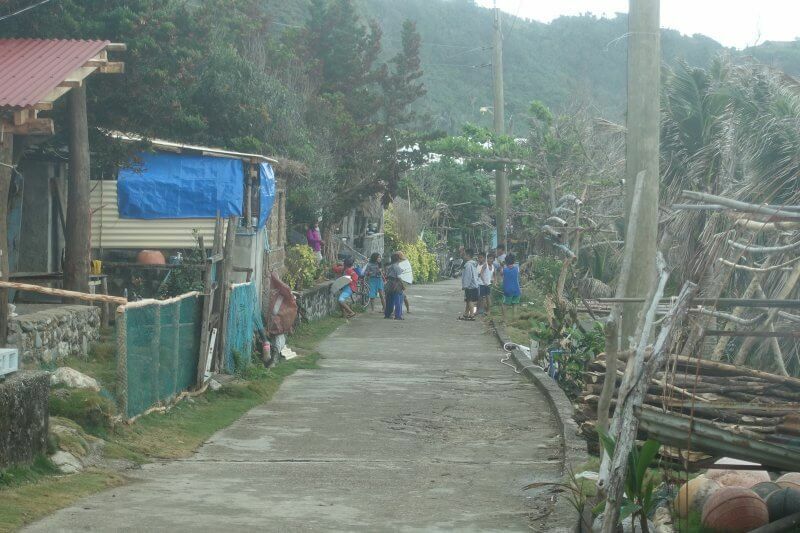 The last one, Typhoon Ferdie, was so strong that the shelter was damaged. The ride was a bit bumpy, but probably among the better days in a year. As we crossed where the South China Sea/ West Philippines Sea crashes into the Pacific Ocean, some splashes made their way on to the boat. Not enough to cause more excitement than seeing flying fishes skim the water every now and then. Blink and they’re gone. Approaching Skull Island aka Sabtang. Another boat unloading before we can enter the port. The waves gently nudged the boat as we enjoy views of the clear blue waters. Not easy to spot fishes here, but closer to shore small schools of fish can be seen. 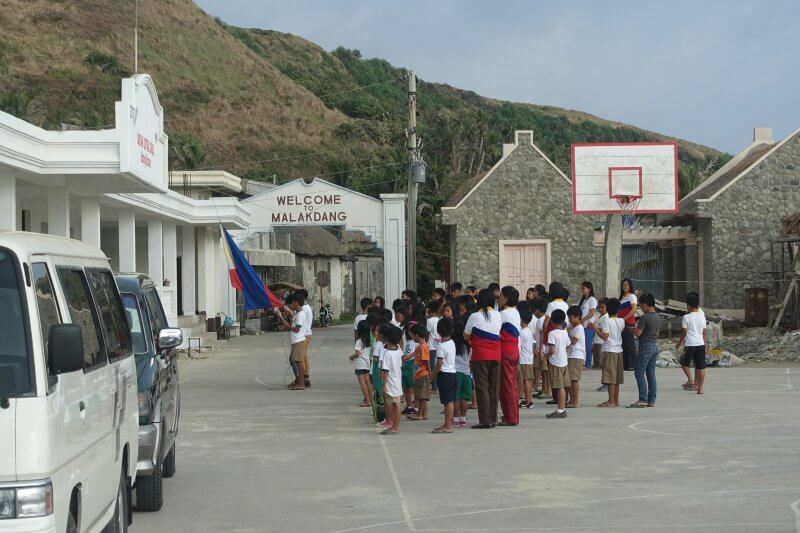 Flag raising ceremony at the school in front of the port. Wandered nearby while we waited for our guide to complete registrations at the tourist office. 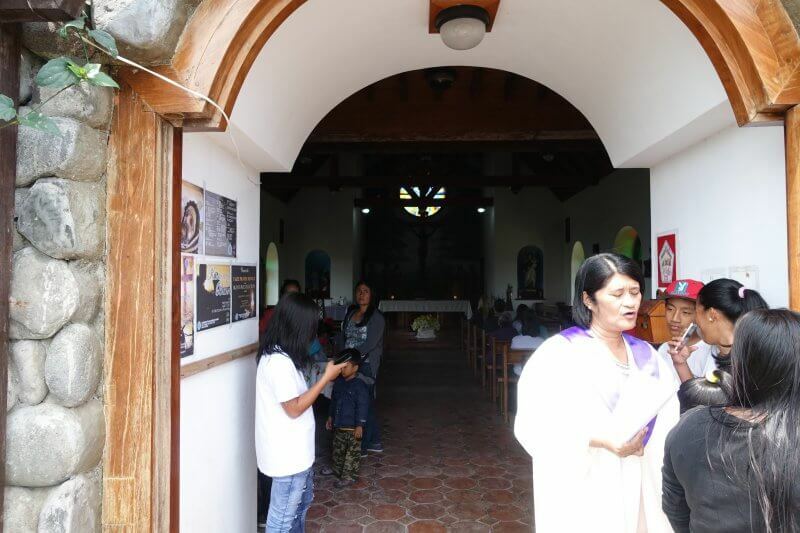 Sabtang Church (San Vicente Ferrer Church). After a short ride from the port by jeepney, the favourite form of transport here, we arrived at the white sandy beaches of Morong Beach. 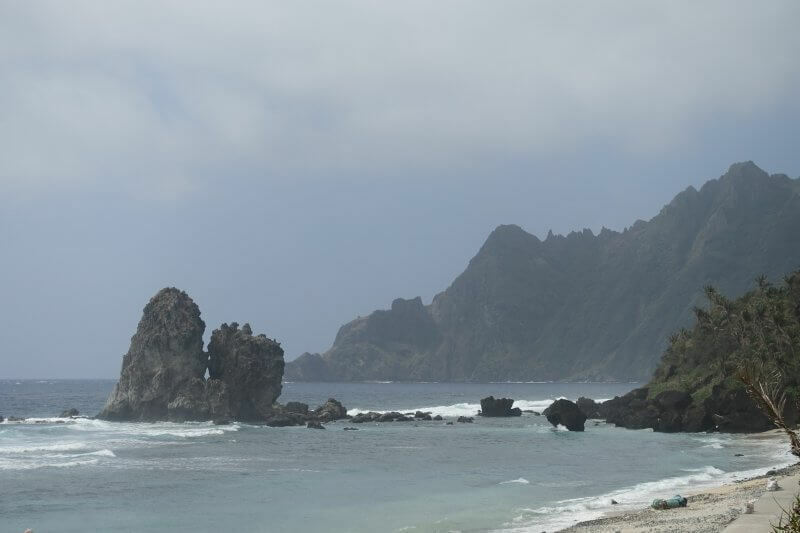 Everyone comes here to check out the Nakabuang Arch, a natural rock formation carved out by the elements. The skies had cleared by then, looks like a beautiful day ahead! 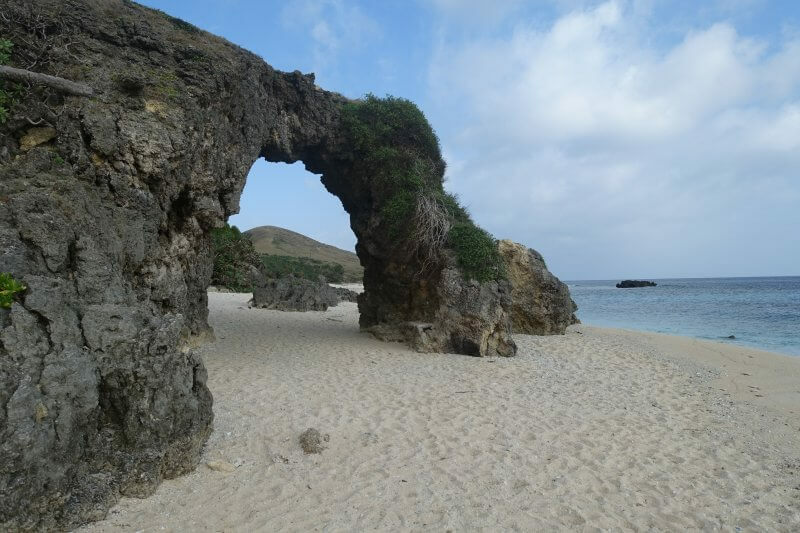 Nakabuang Arch, the main attraction on Morong Beach. A nice appetiser for the rest of the day. All pumped up and ready for more as we continued on the road around Sabtang, rising with the winding road above the seas, watching waves crash below. 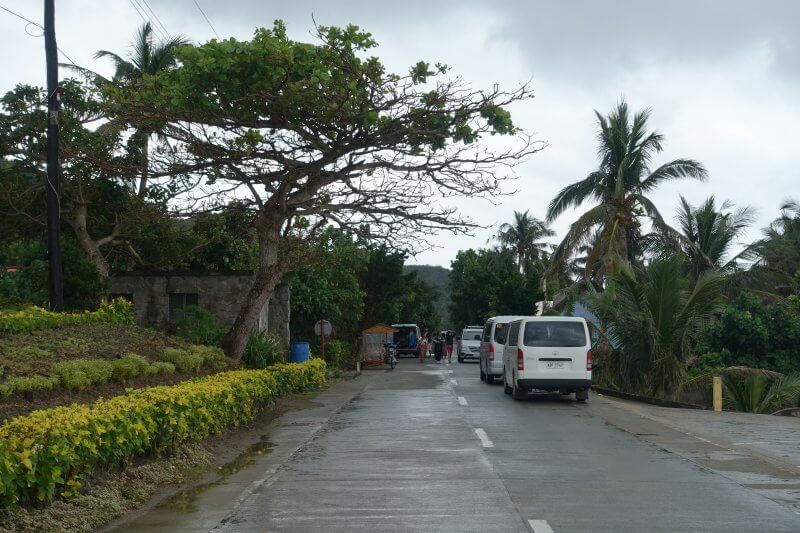 On the narrow road that hugs the coastline to Chavayan Village. 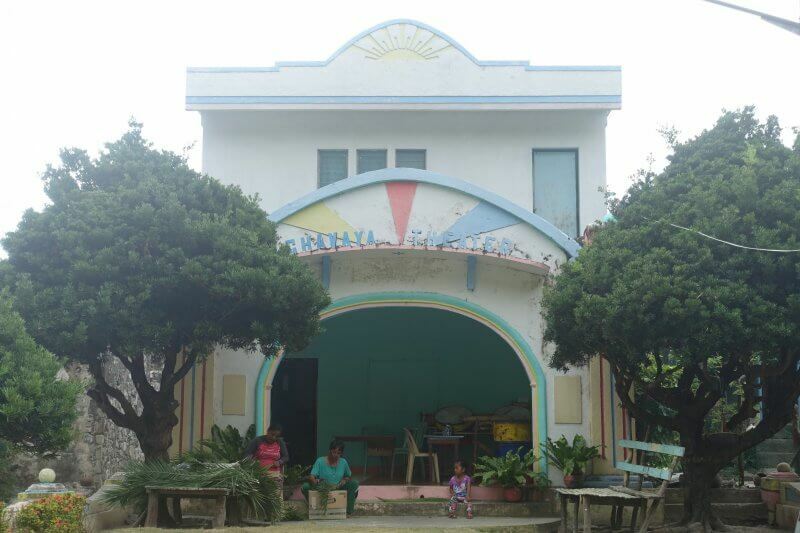 Next up, after long ride to the other side of the island, the remote ancient village of Chavayan. The road hugs the cliff face on the route there, with dramatic views all round (and perhaps a little terrifying). Where the paved road turned into a dirt trail for the rest of the way. Chavayan! 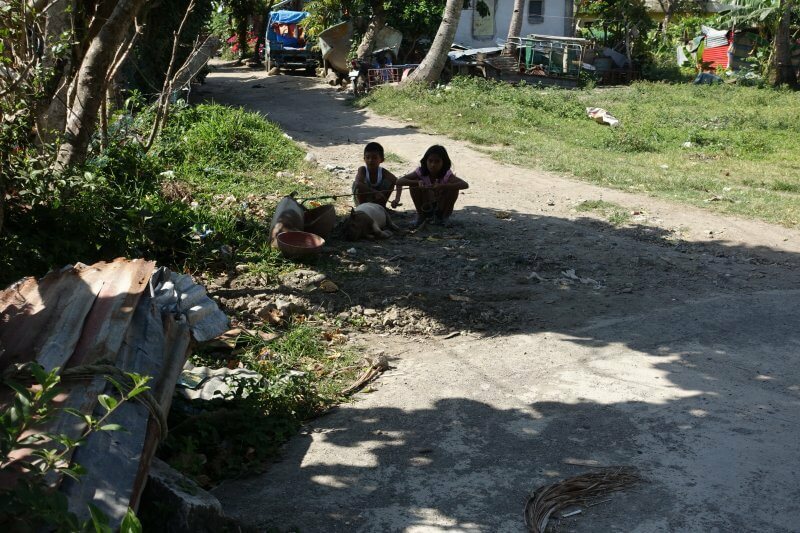 Despite being far from the port and cut off from many modern amenities, there was still plenty of life in the village. Tourism might have helped that too. Narrow one lane road through the village. When vehicles pass between houses, their side mirrors are millimetres from the walls. Traditional straw houses. Well it didn’t look very strong but I doubt the big bad wolf would have been able to blow this down. 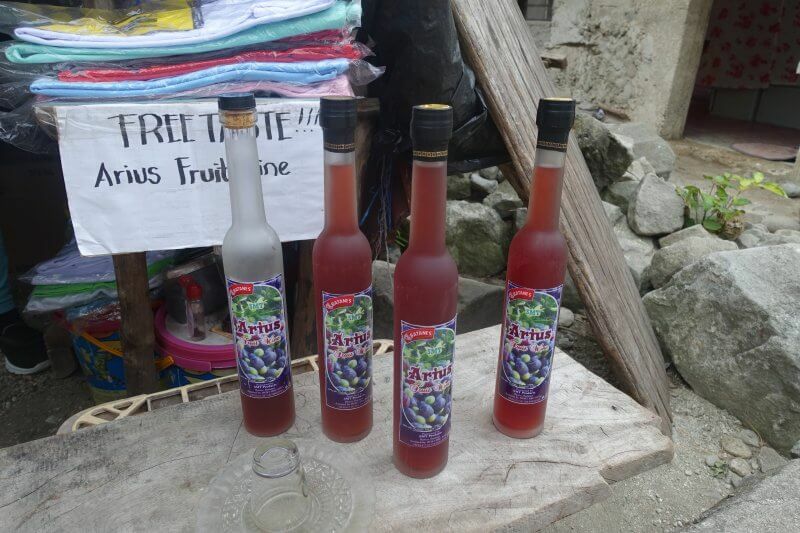 Most of tourist oriented shops throughout Sabtang offer free tasting of arius wine, made from the arius fruit, a plant native to Batanes. It was really sweet with barely a hint of alcohol. The main attraction in the village. very old stone houses. 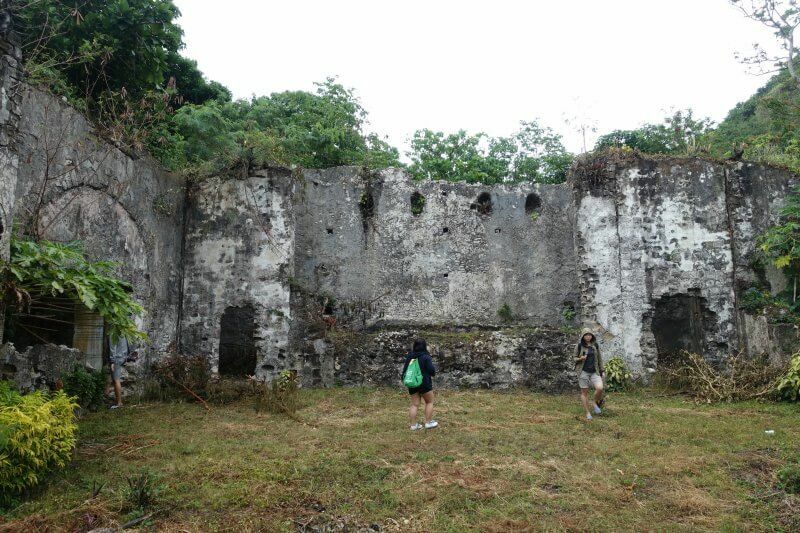 The Spanish brought knowledge of building stone houses here when the colonised the Philippines. 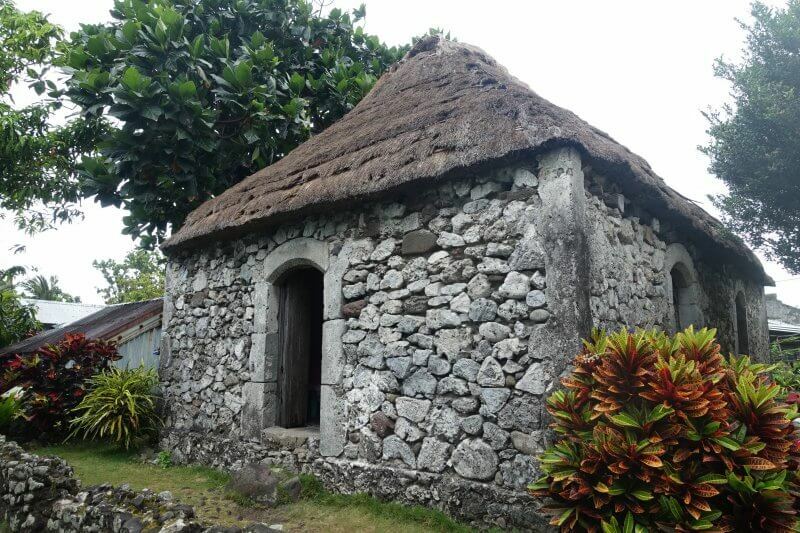 Stone houses were necessary to withstand the annual typhoons that visit Batanes. 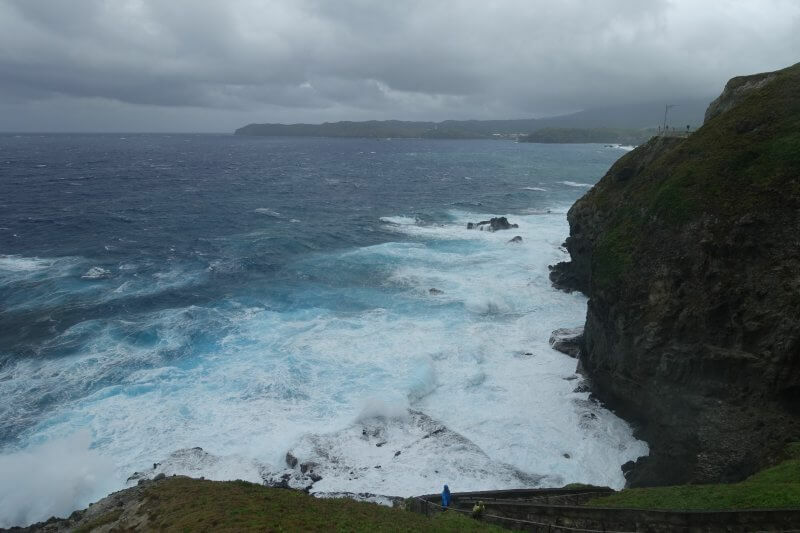 Being at the northernmost part of the Philippines and facing the open ocean, typhoons strike Batanes first, and are often at their most ferocious. There was only one thing to ask this chick. But then I wouldn’t understand Tagalog/ Ivatan so it would have been redundant. 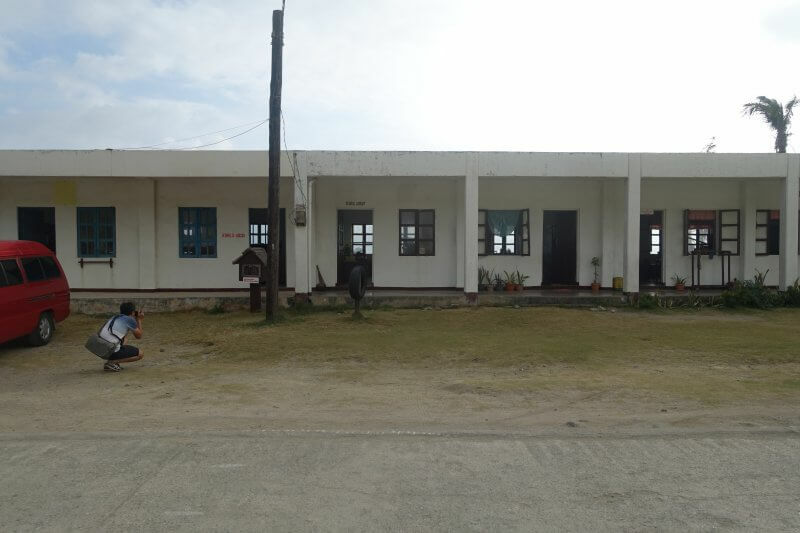 Chavayan Theatre. Not sure if still in use but for now, a kitchen/ living area. 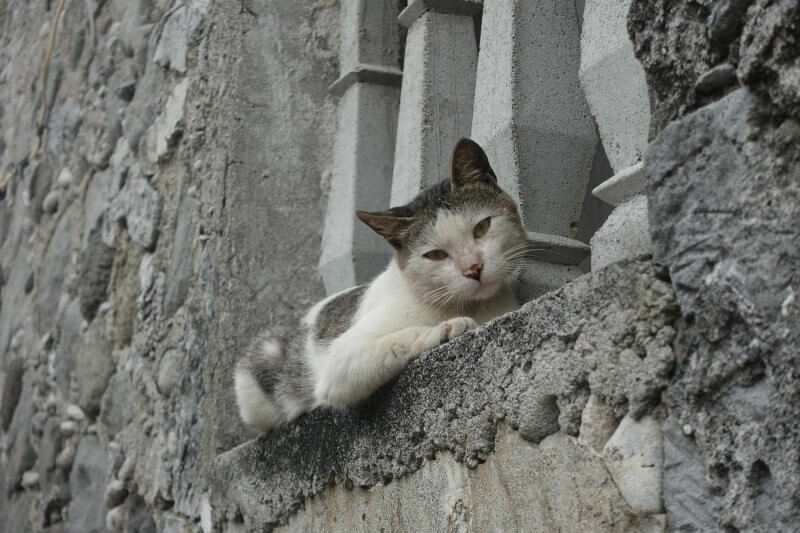 The photogenic cat. Not so many dogs around, but a number of cats. Children at the village school practising the earthquake drill. 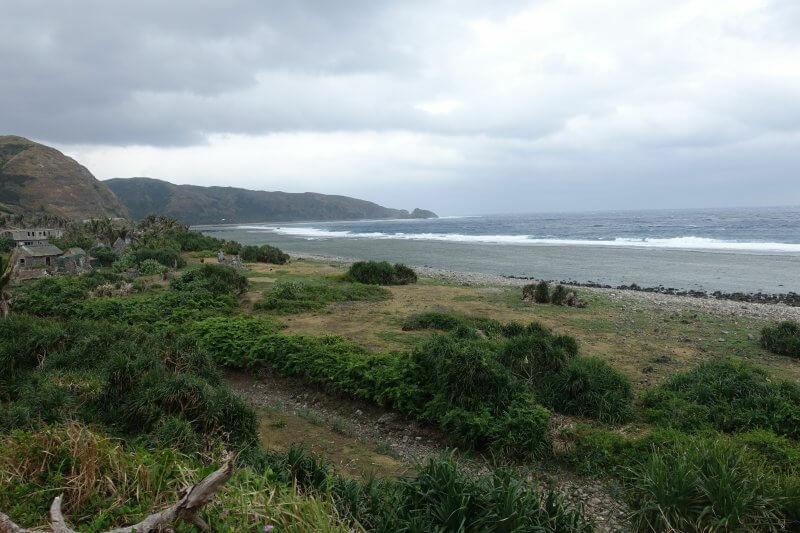 Beyond the end of the village, even more raw seascapes. It was a calm day out at sea, but I’d imagine it’ll be terrifying on those bad weather days. 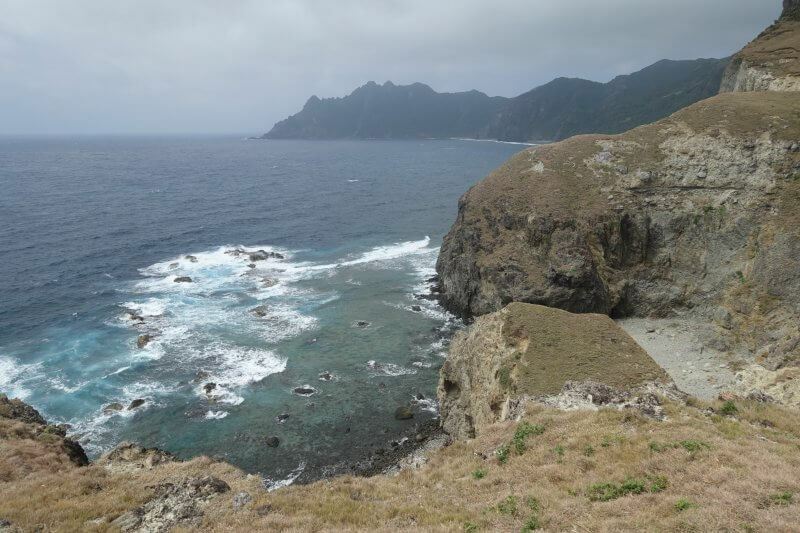 Having reached the end of the road around Sabtang, we backtracked along the same coastal road to the third stop of our Sabtang tour, Chamantad-Tinyan Viewpoint. 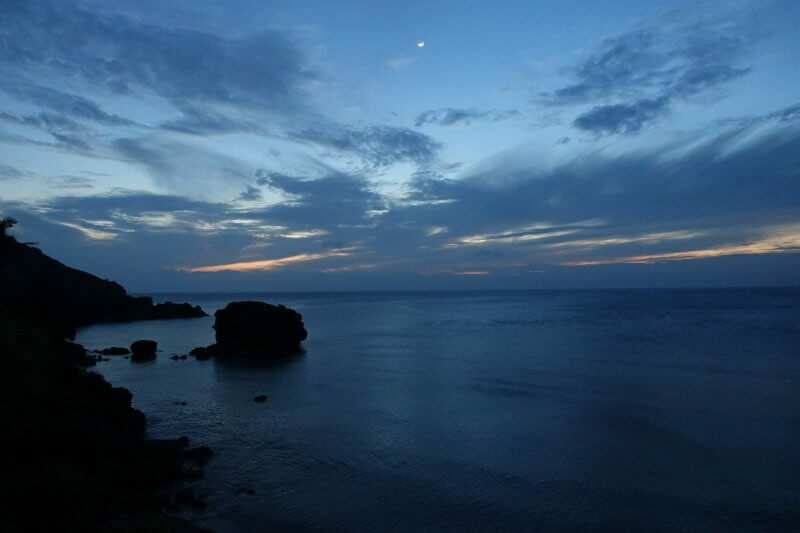 The viewpoint is situated a height above the sea level, surrounded by lagoons, plunging rocky cliffs and white sandy beaches. Looks dangerous to get down to that exclusive beach. Some people tried, but our tour guide kept us from getting any closer. Safety first. From the viewpoint, looking back inland. 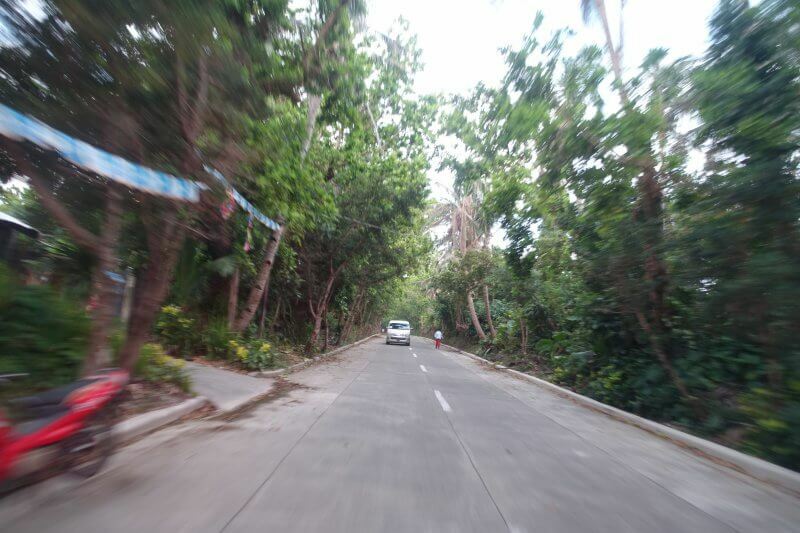 The part where vegetation breaks off along the hill is where the road runs. Dramatic look with the wide open valley devoid of trees. Down another side of the Chamantad-Tinyan Viewpoint. Even on such a calm day, the waves don’t look like stuff you’d want to play around with. After all, they had been responsible for that sharply plunging coastline. 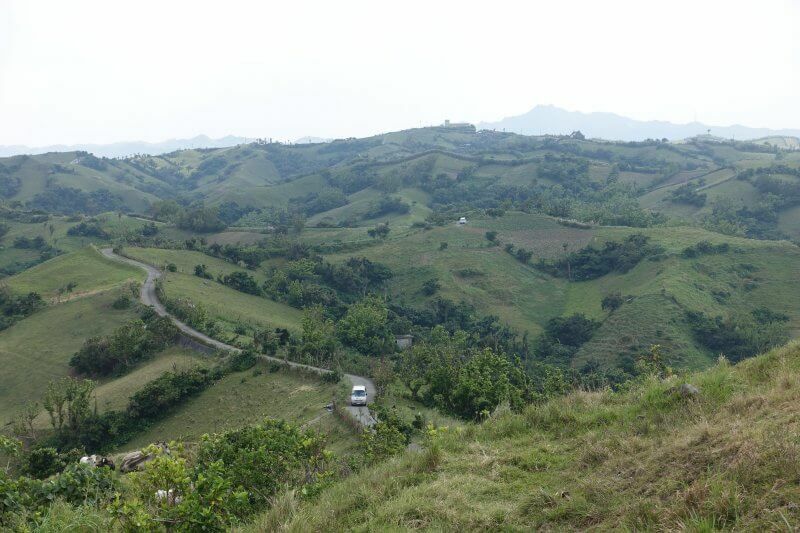 This side of the Chamantad-Tinyan Viewpoint seemed the most friendly. 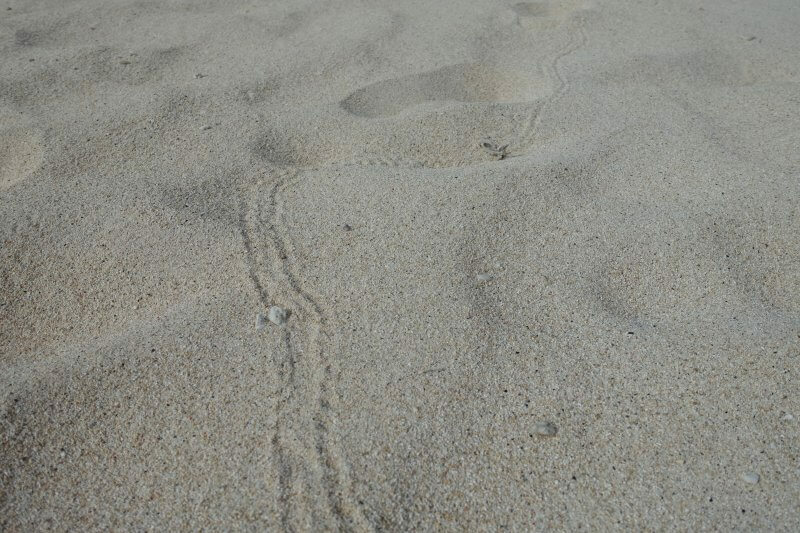 White sandy beaches and a gradual run off calming the waves. That the waters were clear and shallow enough to see the bottom helped too. Unfortunately we couldn’t spend more time here as the boat back to Batan leaves in a few hours. This might have made a good reason to stay the night in Sabtang though. 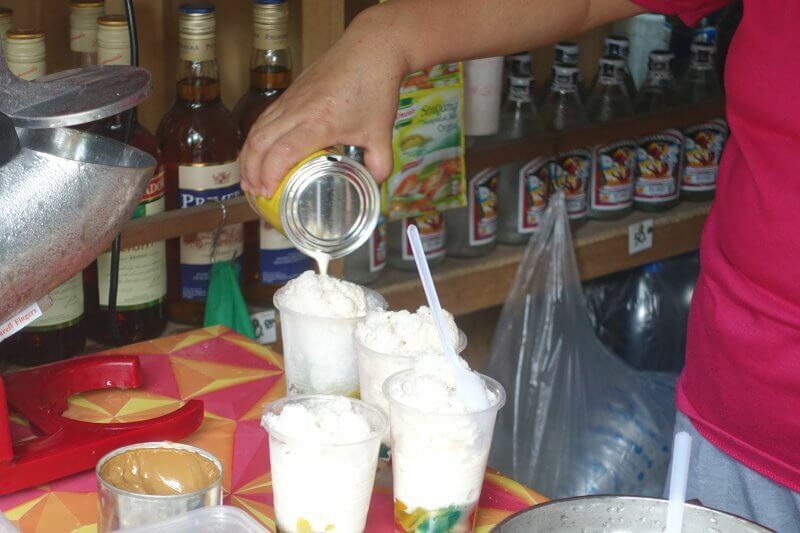 On the way back to the jeepney, we made a stop at one of the shops along the road for some refreshing coconut juice and wine tasting. 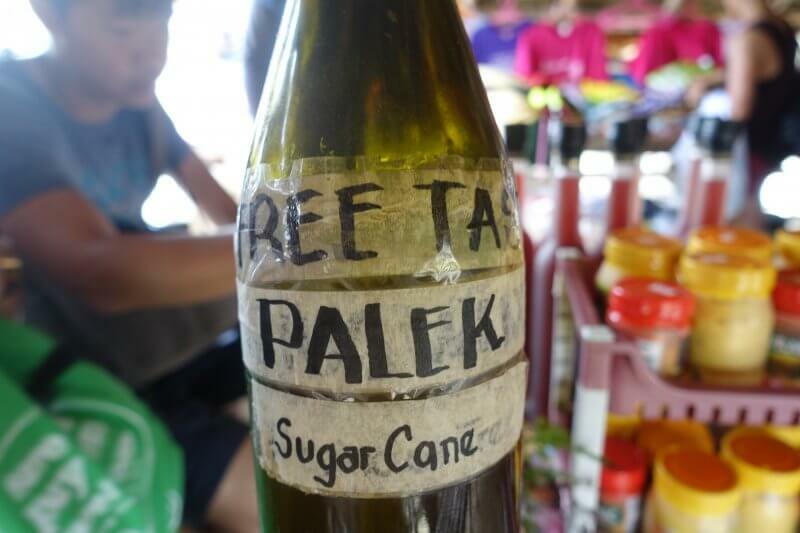 Palek, local wine made from sugar cane. We tried arius wine and palek here, both were sweet and fragrant. 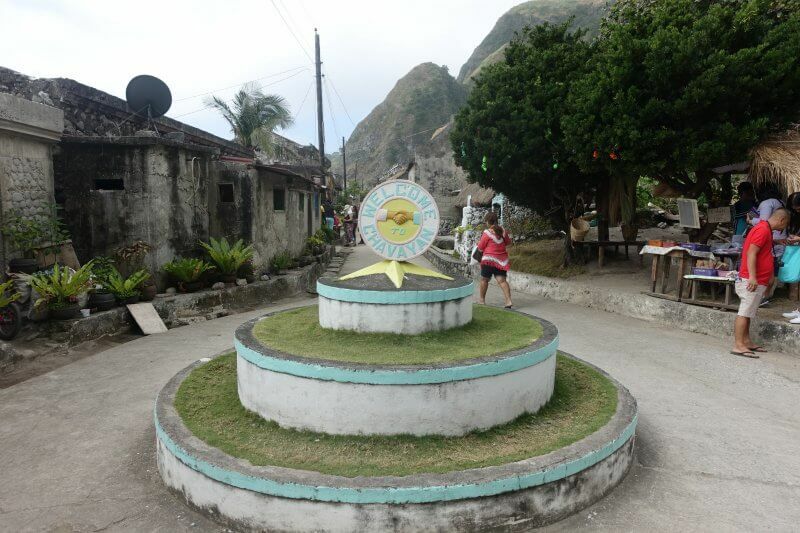 Our final stop in Sabtang was at Barangay Savidug, where lots of old stone houses still stand. 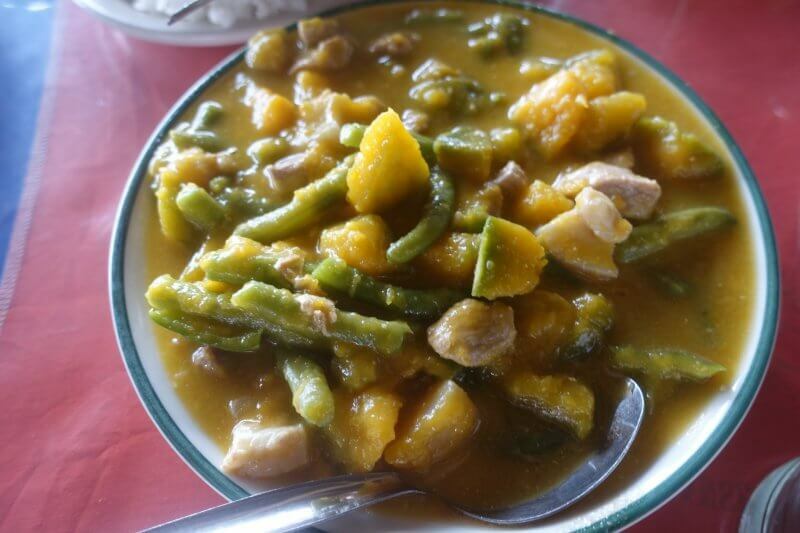 Similar to Chavayan, but with a different feel to it. 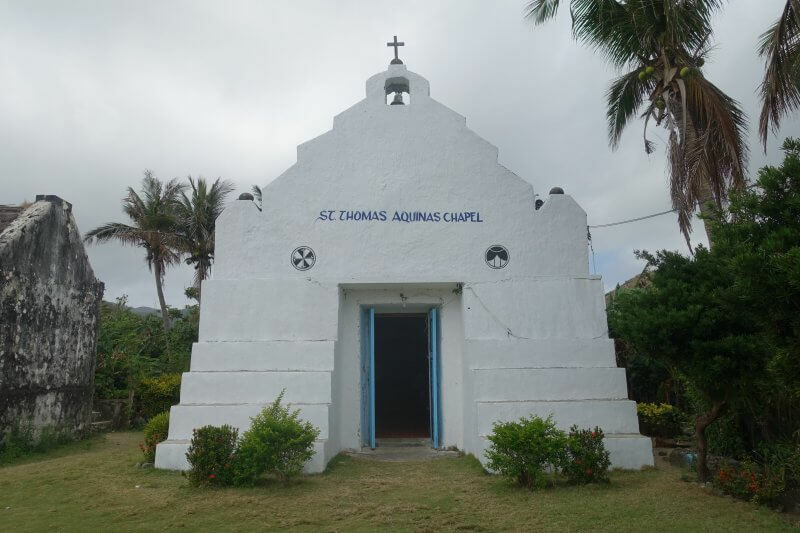 The St Thomas Aquinas Chapel. A crumbling stone house beside the chapel. Tourists (including us) were entering it for a nice group photo opportunity, but perhaps in the interest of preservation we should have kept our distance. This one’s returned to nature. Maintained and functioning stone house. 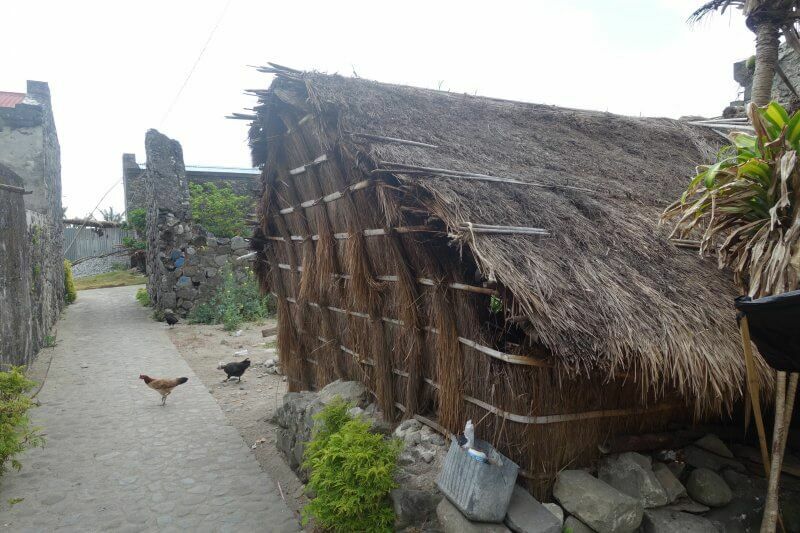 The roof is made of a thick layer dried cogon grass, and can last up to 30 years. That is if they don’t get blown away during typhoons. 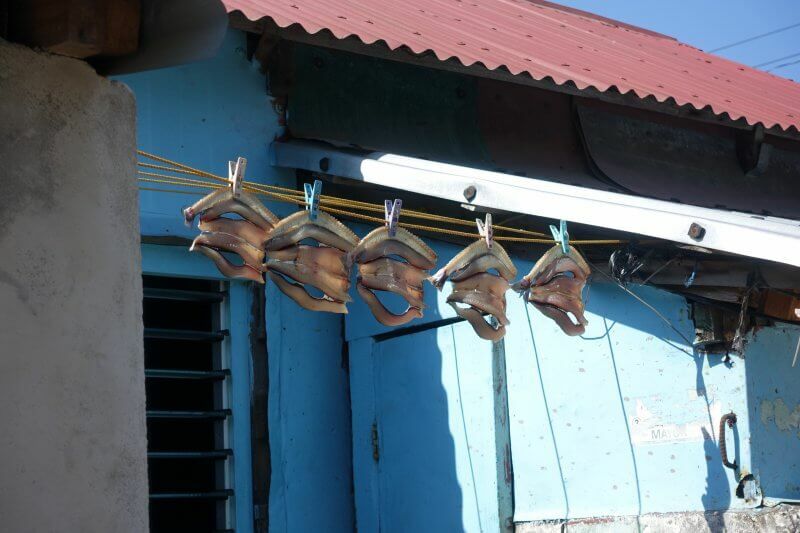 The roofs are tied down during typhoons, and often also netted to prevent birds from getting ideas of reusing some of the material for their own homes. 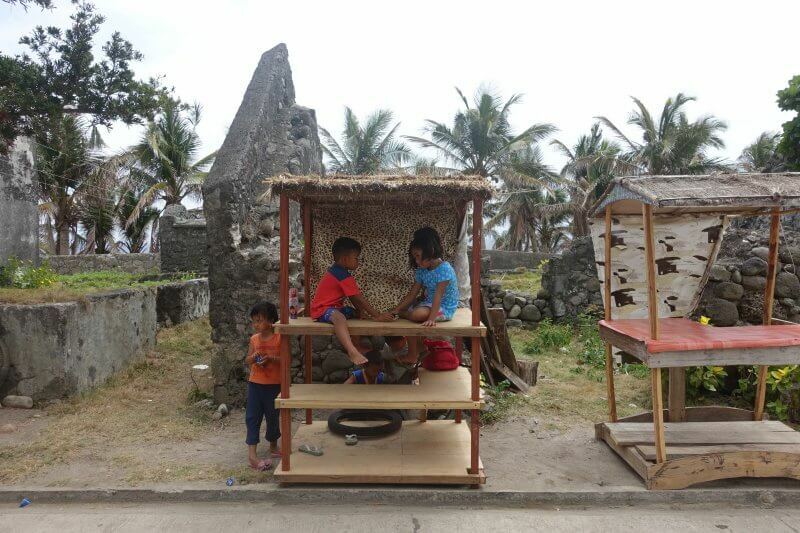 Children playing games at an empty booth in Savidug, Sabtang, in front of stone house ruins. 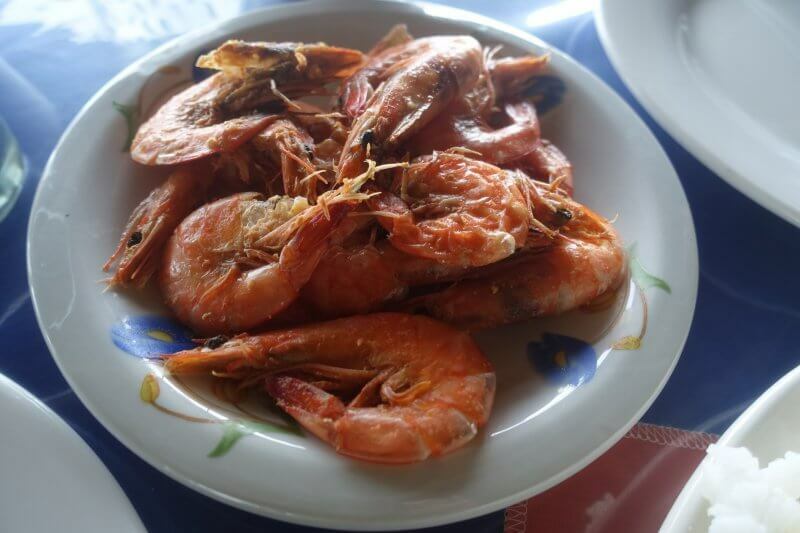 With our exploration of Barangay Savidug complete, we continued a little further down the path to a pop up restaurant beside Morong Beach, where lunch (part of the tour) awaited. They may not look the prettiest, but these dishes tasted great! 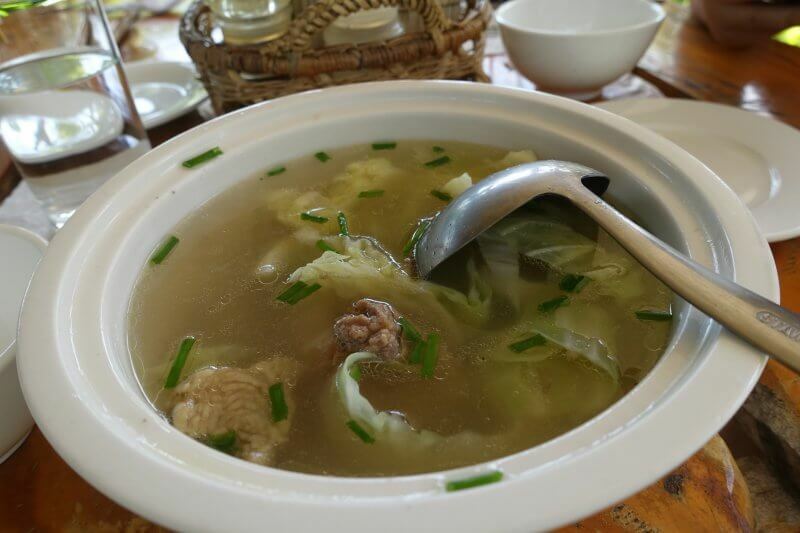 Glad to get a taste of local dishes, made from local ingredients. Getting hungry just thinking about the meal we had. 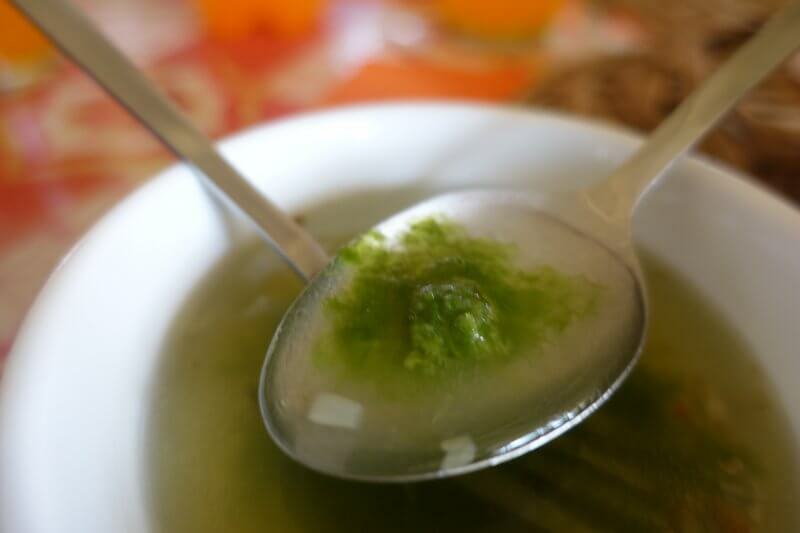 Seaweed soup, with fresh looking seaweed instead of the dried one we usually get back in Singapore. 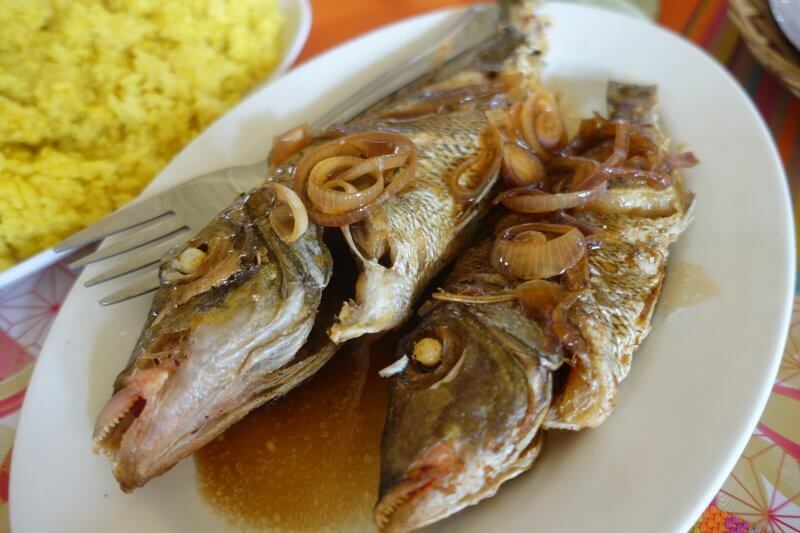 Fried fish with some delicious onion sauce. 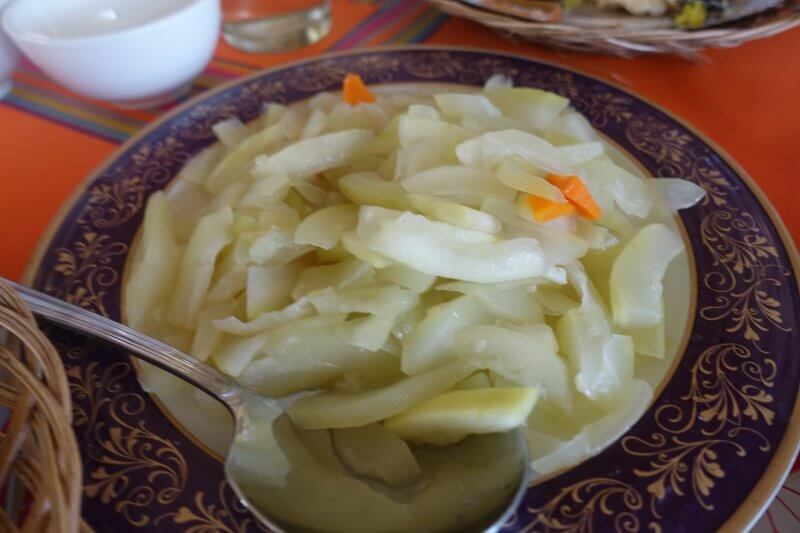 Forgot what vegetable it was but as with the rest, tasted better than it looked. 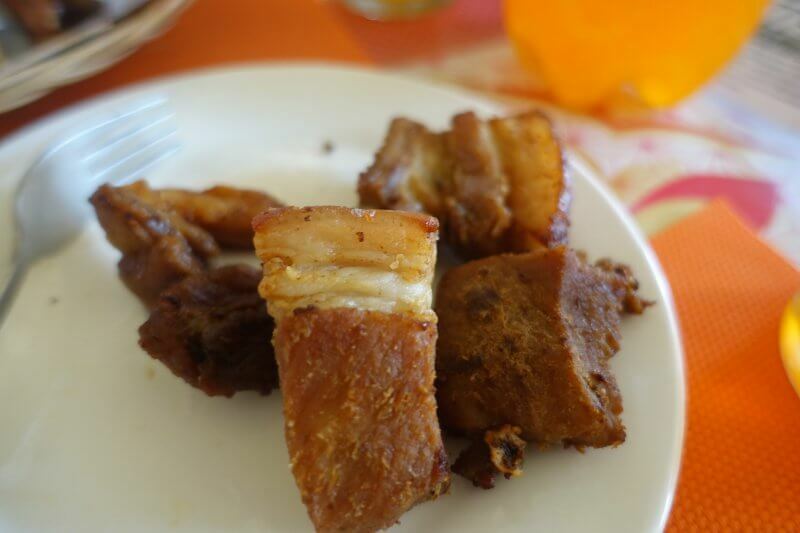 Lunez, marinated and fried pork. 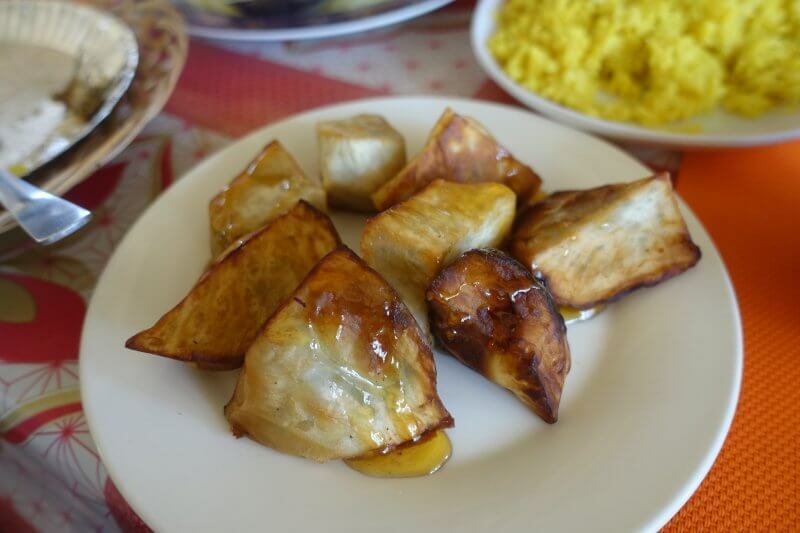 Fried camote (sweet potato) with honey for desserts. Simple and yummy! 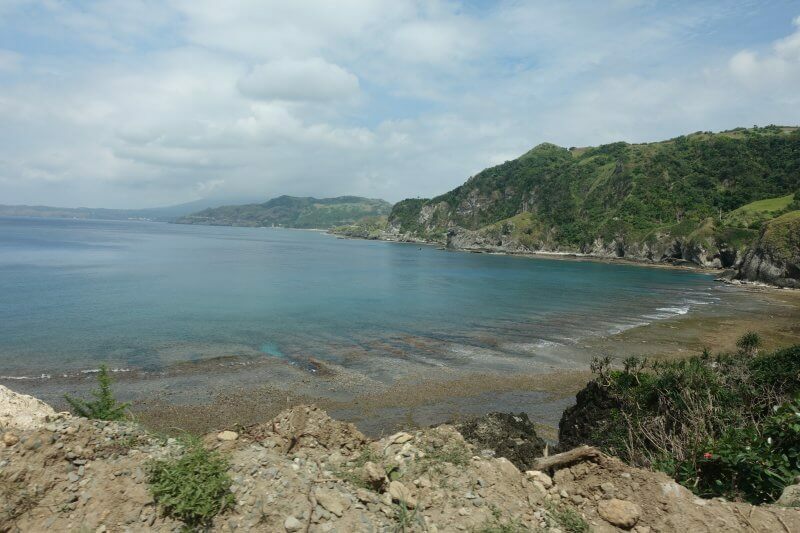 View of Morong Beach from where we had lunch. 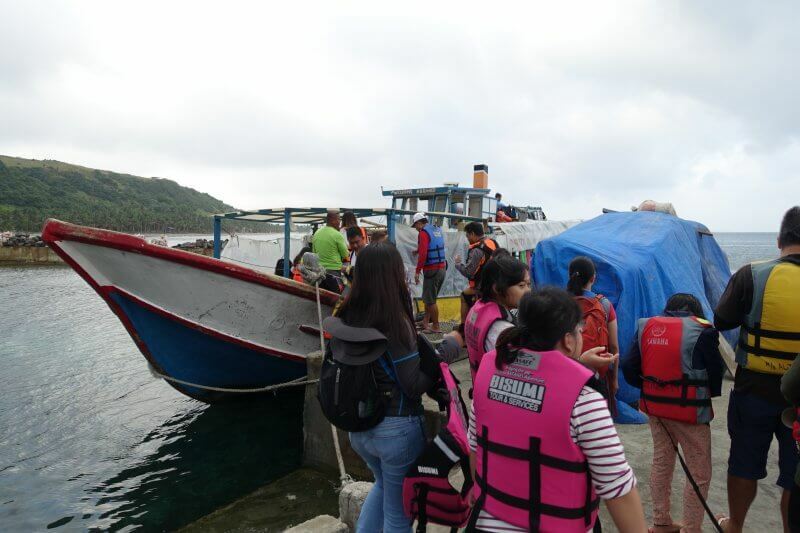 Then it was about time to get back to the port before the last boat returns to Batan for the day. 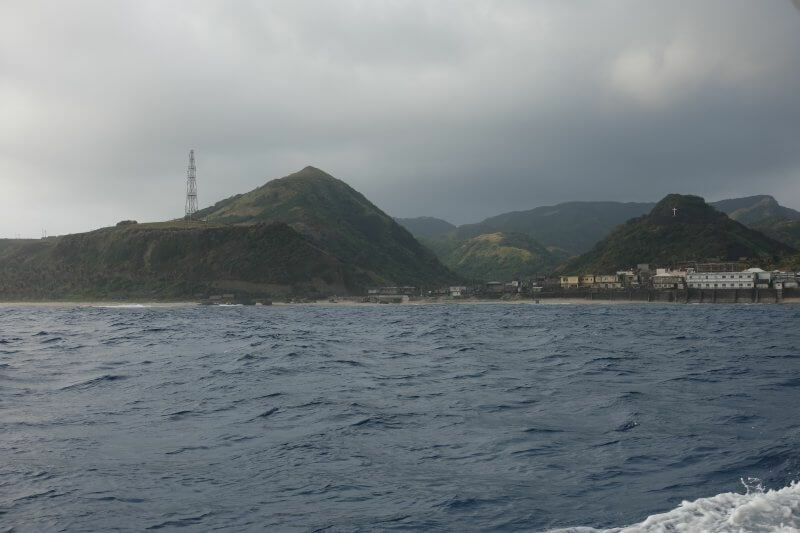 Sabtang Lighthouse, from the port of Sabtang. 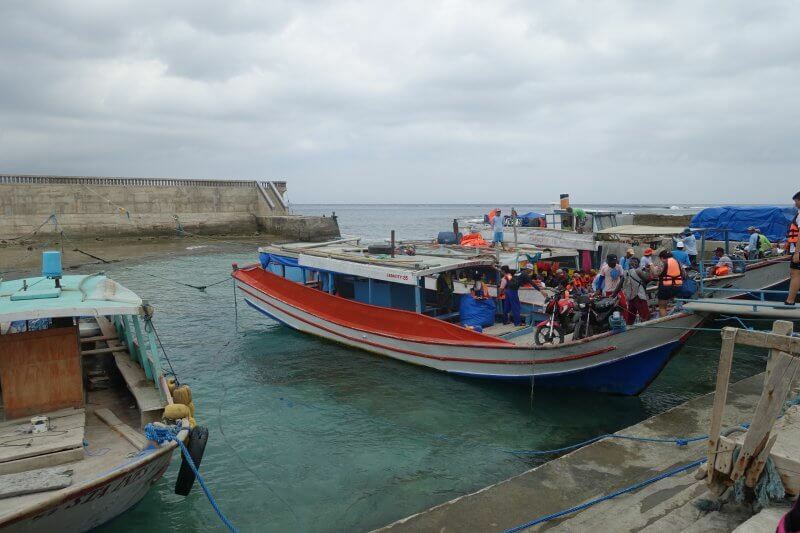 These boats were the main way of transporting stuff from Batan Island (where goods from elsewhere are dropped off) to Sabtang, including motocycles. 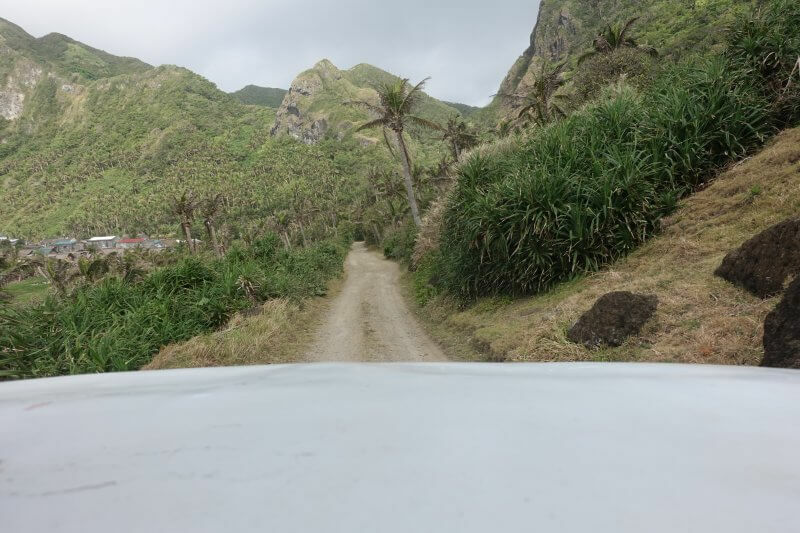 Back on Batan Island, on the National Road to get from the Port of Ivana back to Basco town. 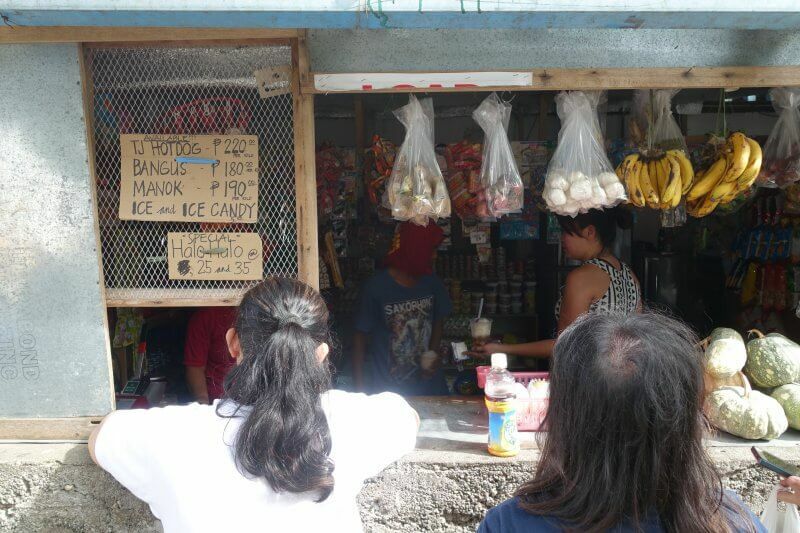 Back in Basco, we joined the locals and queued up for dessert at one of the road side stalls. On the opposite side of the road, man selling flying fish (lots around the islands, just like around Taiwan’s eastern islands), with their long fins. Had to get in line to get some Halo-Halo, a Filipino dessert. The one made here didn’t look like the one we saw in images, but was good enough to keep us happy, with too much sugar and ice. Topping it all off with some canned milk. We spent the rest of the day alternative between mindlessly flipping channels and buying/trying more random snacks and beverages from the grocery stores around, as there was no internet that we had been so accustomed to. TV was sufficient for these few days, although we didn’t understand much of what was going on in the programs. 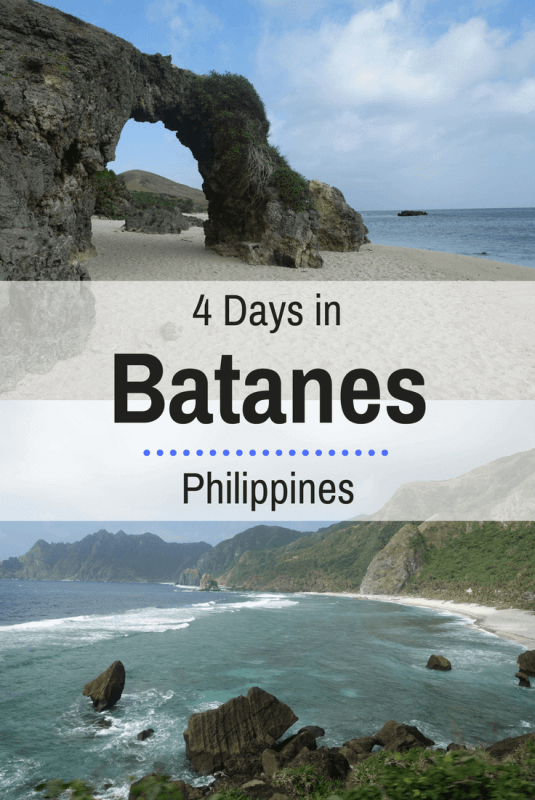 Day 2 of our Batanes tour started later in the morning, leaving more time to catch up on sleep. Skies look threatening when we woke up, and we wondered if the tour might be postponed or cancelled, since the sights are all outdoors along the coast. Our guide gave the go ahead, so we got ready, and set off! 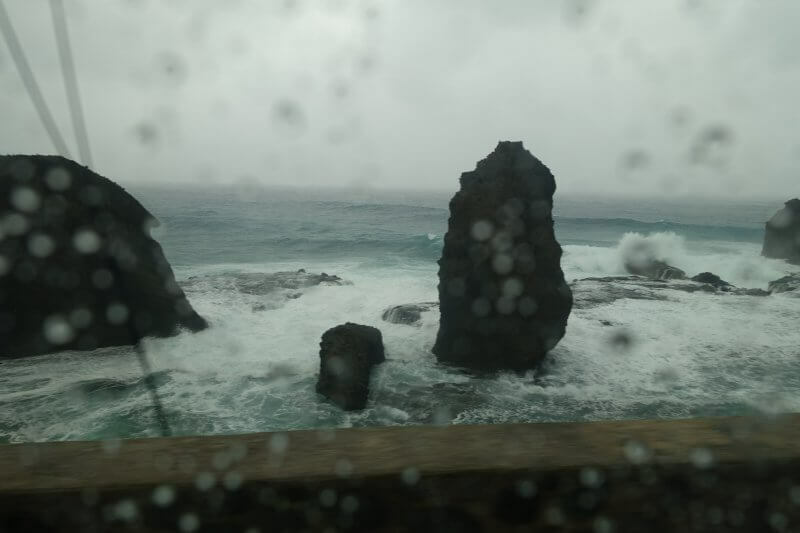 Winding around the National Road on Batan island, clinging onto the steep coastline, we first stopped at Chawa View Deck, which actually looked spectacular in the slightly adverse weather. It was drizzling, but with strong winds blowing, raindrops felt like pellets. Taking pictures were also a challenge as droplets kept getting on the lens. Waves lashed at the coast, unleashing sprays several meters high. 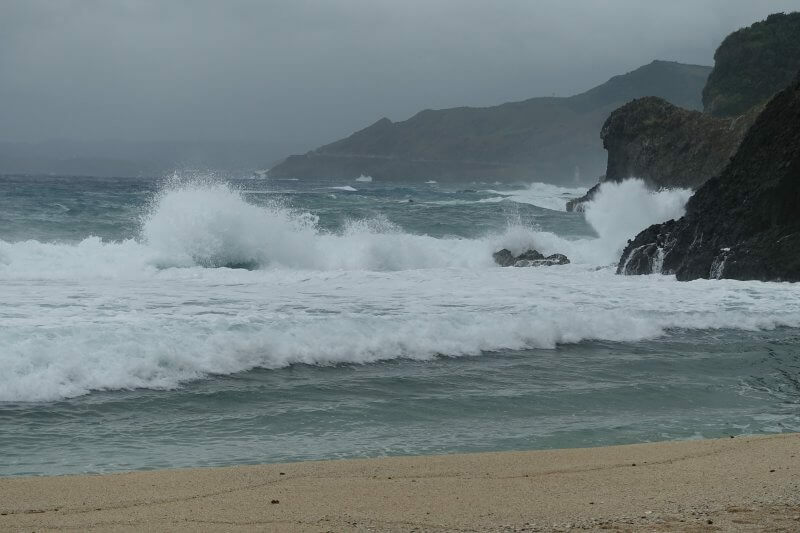 During typhoons, waves can get all the way to the road, which is quite a distance from the sea level. Fearsome waves lashing out at the coast at the Chawa View Deck. As you can see in the picture, there is a staircase to get closer to the waters, but it looked dangerous that day. 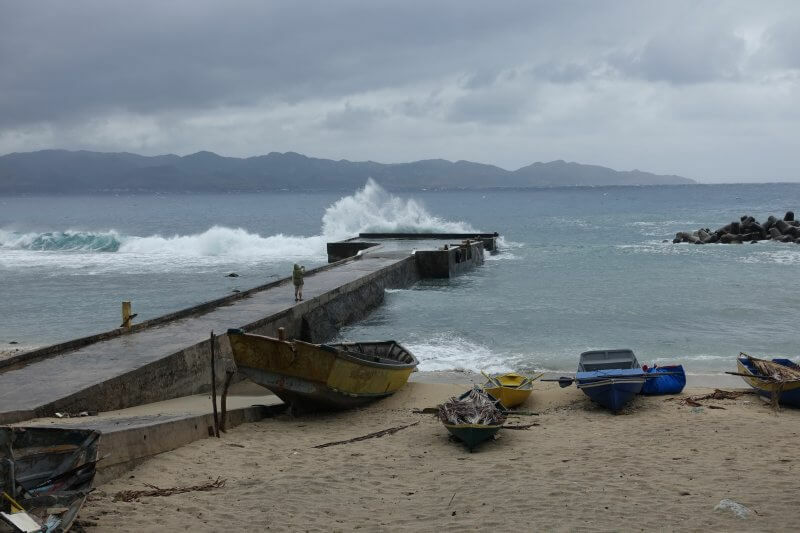 Our next stop was at the village of Mahatao, where we had seen the boat shelter while passing through the day before. 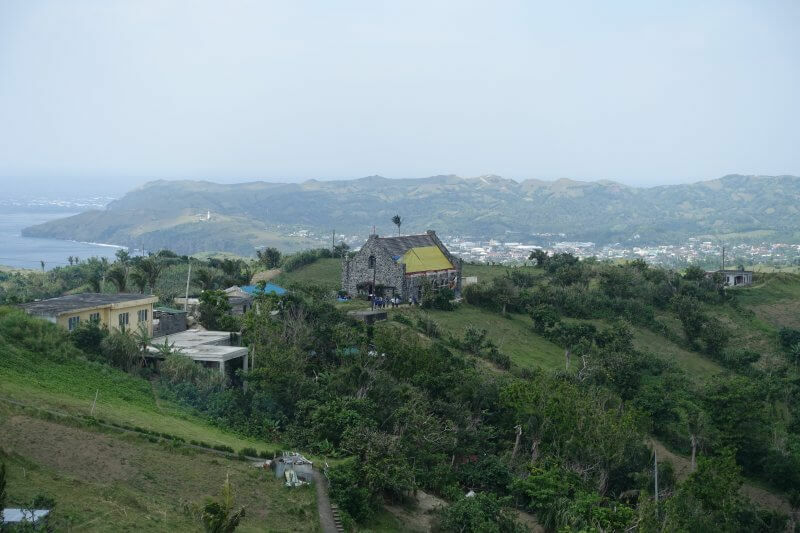 Overlooking Mahatao, the church in the middle, and the building up on the hill supposedly the house of someone rich. The structure on the left in the picture below was used in olden times, along with a similar one further down the shore, to guide fishermen, by lighting a flame in each of them. 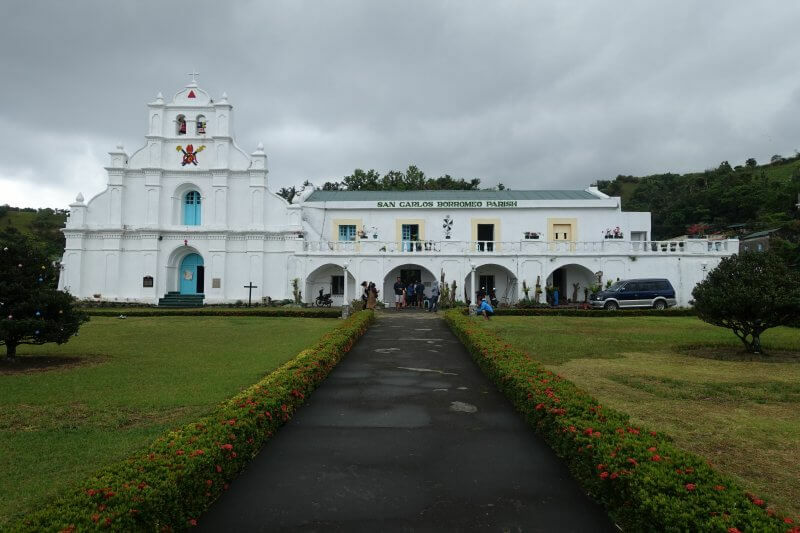 The San Carlos Borromeo Church has a history of over 200 years, and has been in its present form in over a hundred. 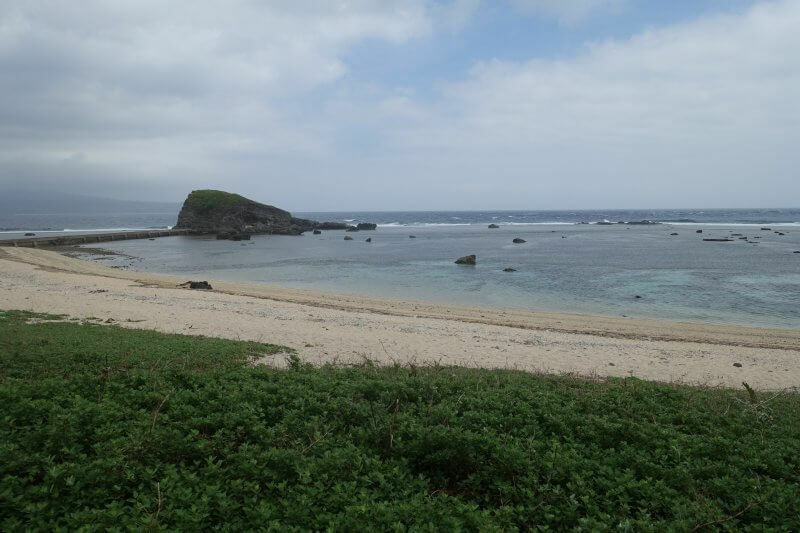 It is designated as a National Cultural Treasure. 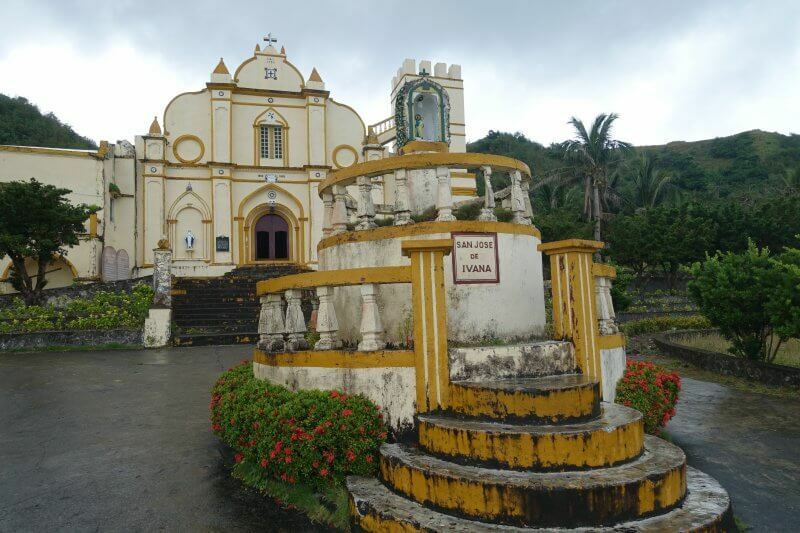 The San Carlos Borromeo Church, Mahatao. 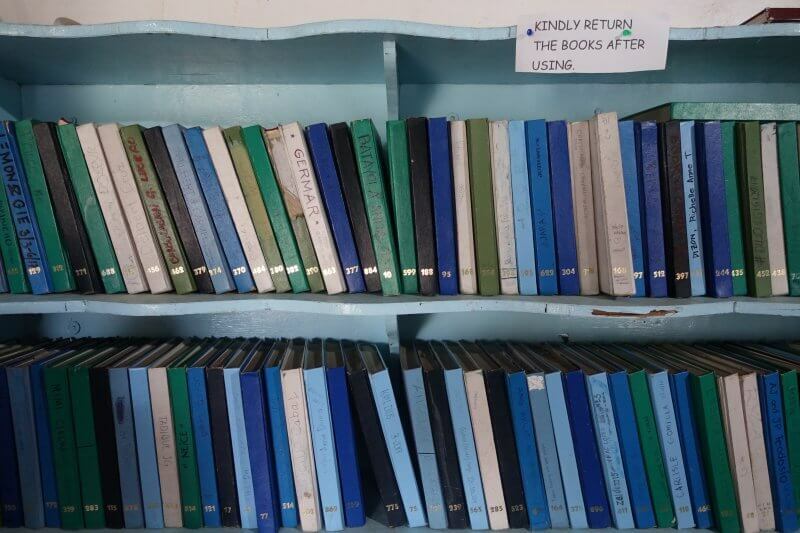 In one part of the church there were books where you can leave a message on for future visitors to read. Or your future self. 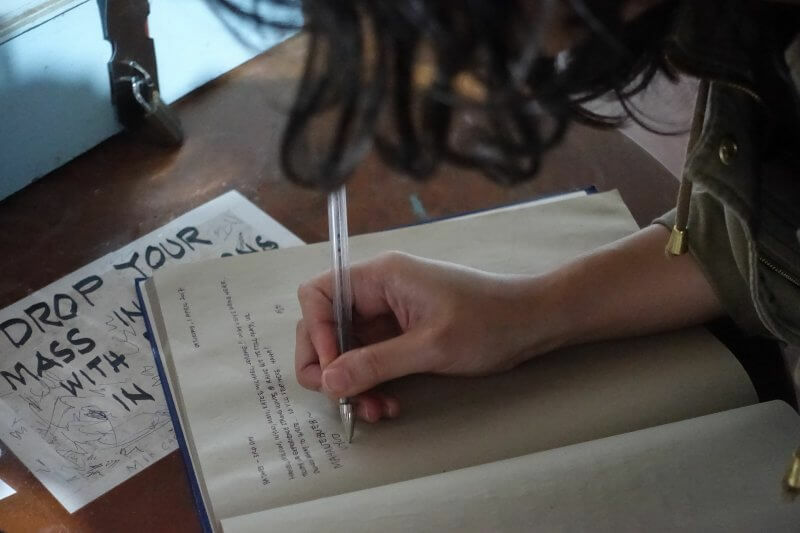 Pick a book, find an empty page, leave your message. 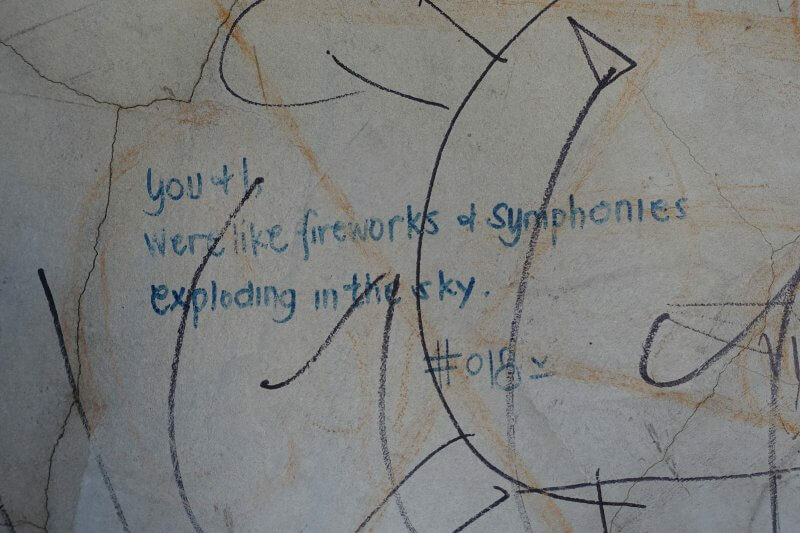 Our friend left a message. And the rest of us conveniently added our names behind hers to announce our arrival. This was supposed to be a nice place to hang out and chill on the beach. Not today. 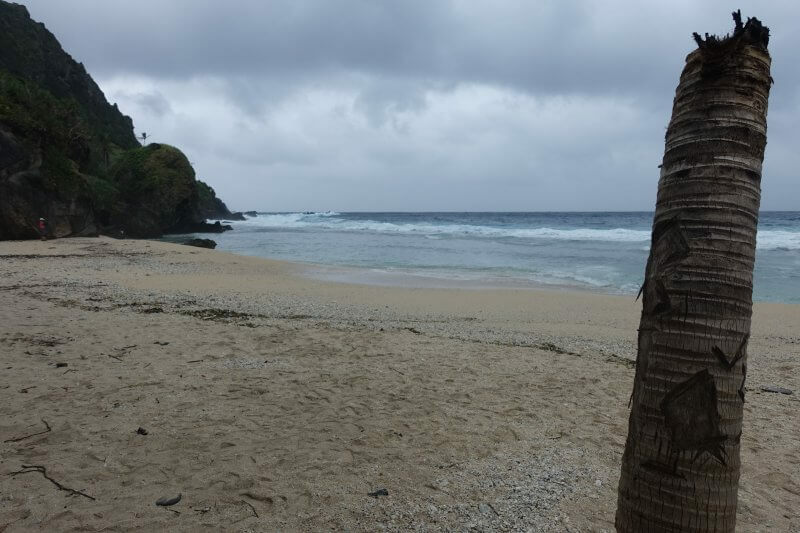 The lone broken coconut tree. Actually many more behind me. Our ride for the day. 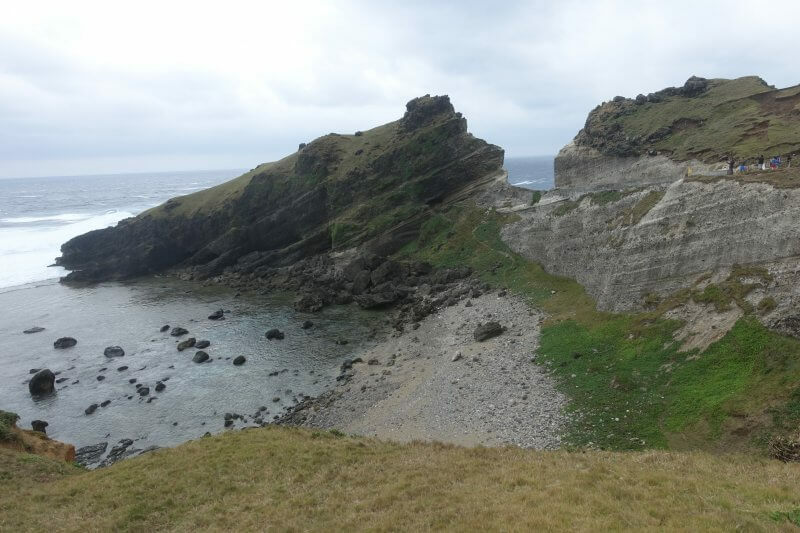 The landscape at Batanes was of sharp contrasts, with dense vegetation, raw plunging cliffs, and white sandy beaches within stone’s throw of each. Watching the splashing from safety. Rain and huge waves are best enjoyed indoors. 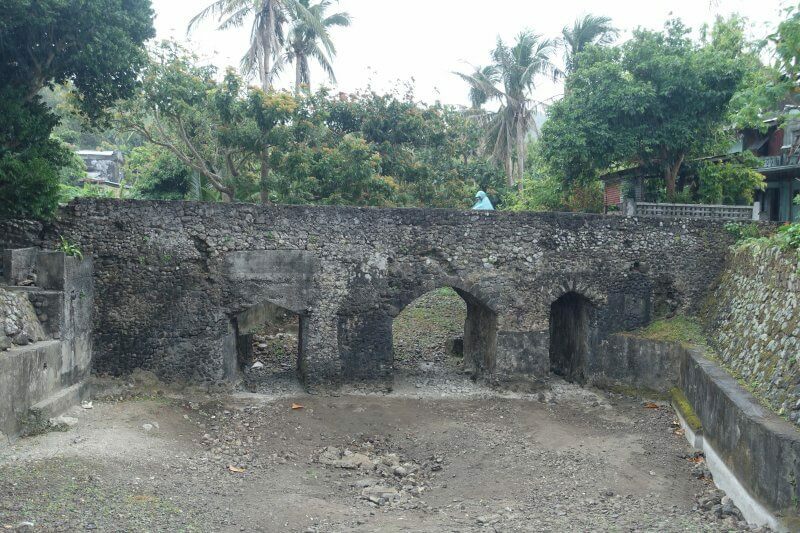 The Spanish Tuhel Bridge, built during the Spanish colonial period, is over 200 years old. Somehow still standing strong. One of last standing bridges built by the Spanish. 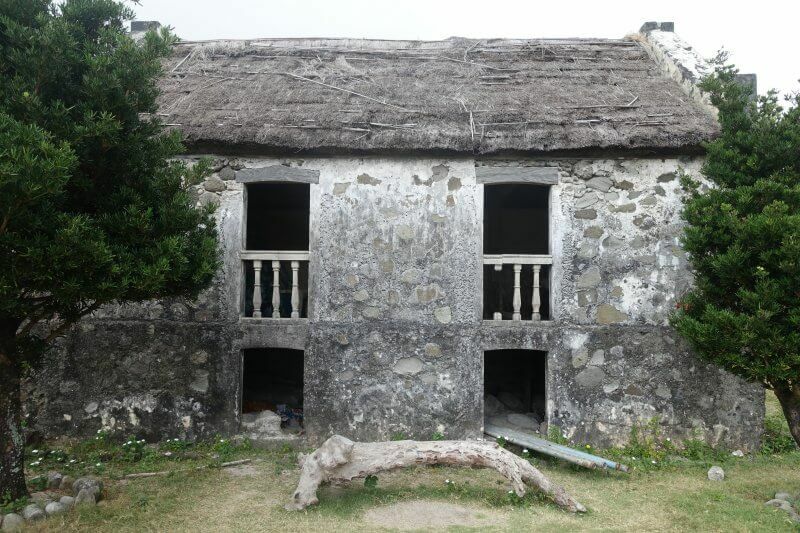 Another highlight of Batanes, the House of Dakay, the oldest stone house in Batanes, and a UNESCO World Heritage Building. 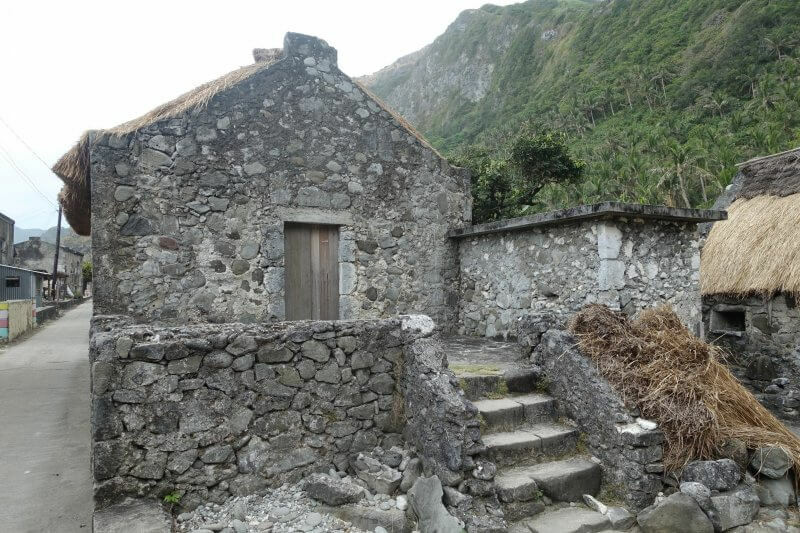 The stone house was built in 1887, and still stands after strong earthquakes and countless typhoons. The current owner is somewhere around, but the house is open for the public to take a look. 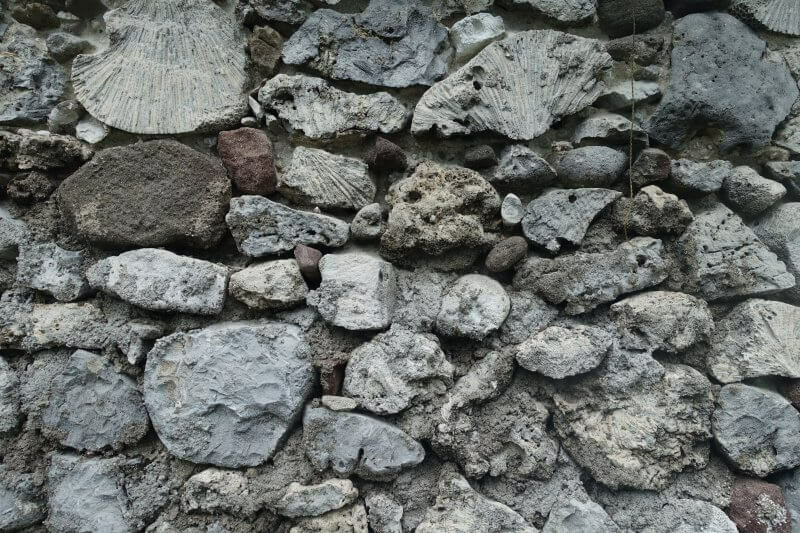 The walls, built with a method brought by the Spanish, involved rocks, dead coral, and lime. Walls of the stone houses. Preparing for the inter-village games. 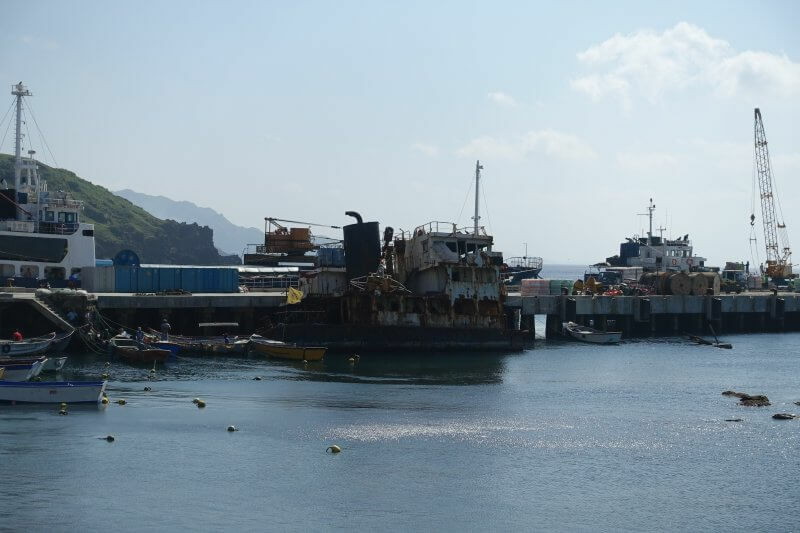 We were fortunate to have made the crossing from the Port of Ivana to the Port of Sabtang in much kinder weather the day before, as getting on to the pier seemed like a challenge this day. Anyway, we were in Ivana for other business today. Waves hitting the pier at the Port of Ivana. 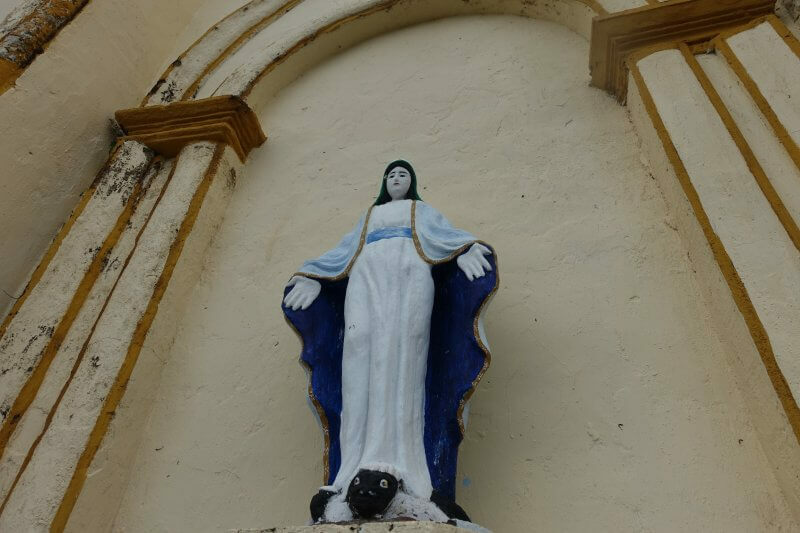 On the other side of the road from the Port of Ivana, the San Jose de Obrero/ San Jose de Ivana Church, a beautiful, well preserved church, over 200 years old, and a designated National Historical Landmark. 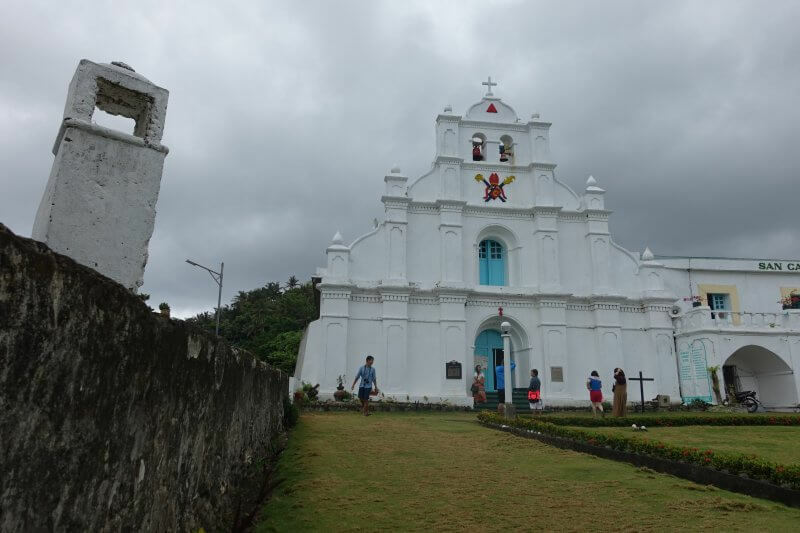 Facade of the San Jose de Ivana Church in Batanes. 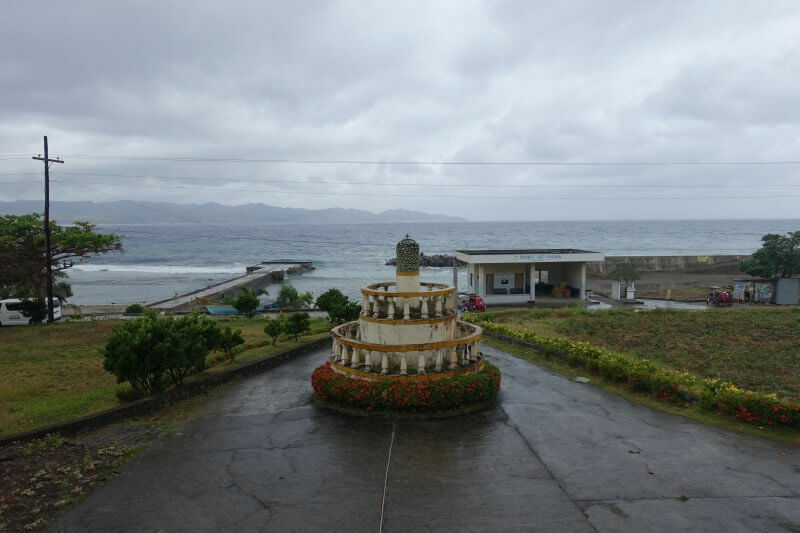 Looking out to sea from the steps of the San Jose de Ivana Church, Sabtang Island in the distance. Still looking immaculate after all the years. 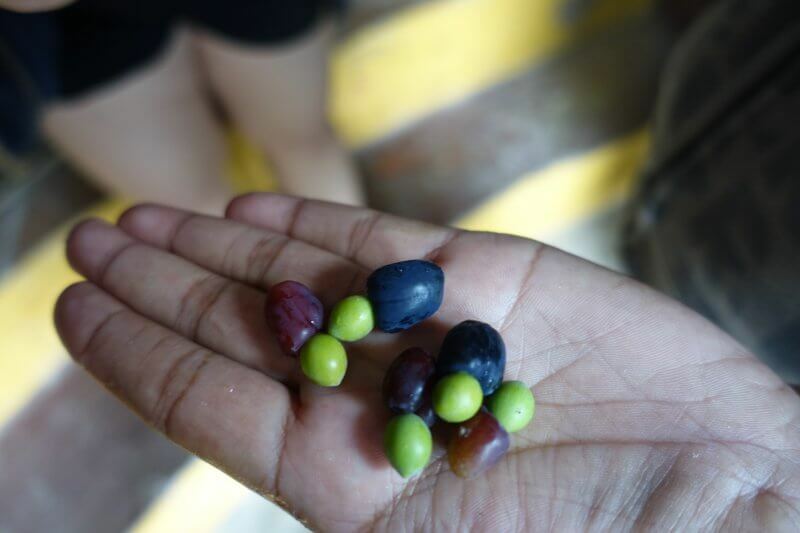 Tried some fruit from the arius tree. Slightly sweet. We explored ruins of the original church at the back of the present church, and despite their current state, looked impressive. 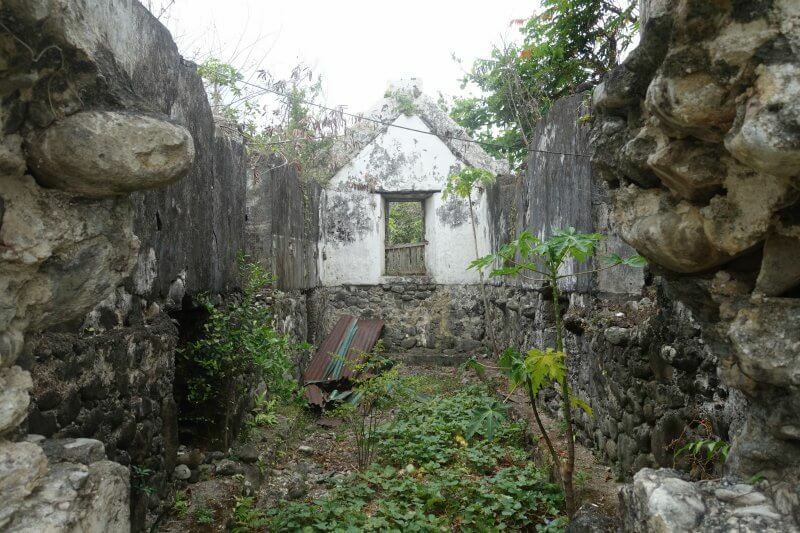 At the back of the currently standing church, the ruins of the original church, which was downsized following the shrinking congregation, or destroyed in a fire, depending on which account it is. 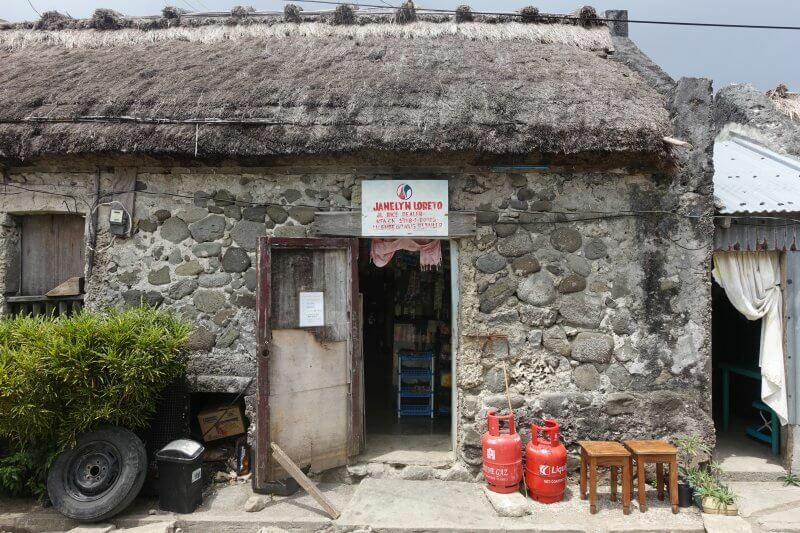 Walking a little down the road from the San Jose de Ivana Church, we arrived at the Honesty Coffee Shop, a highlight in Batanes for not having any cashiers. Just pick up your items and place the right amount in the cash box! 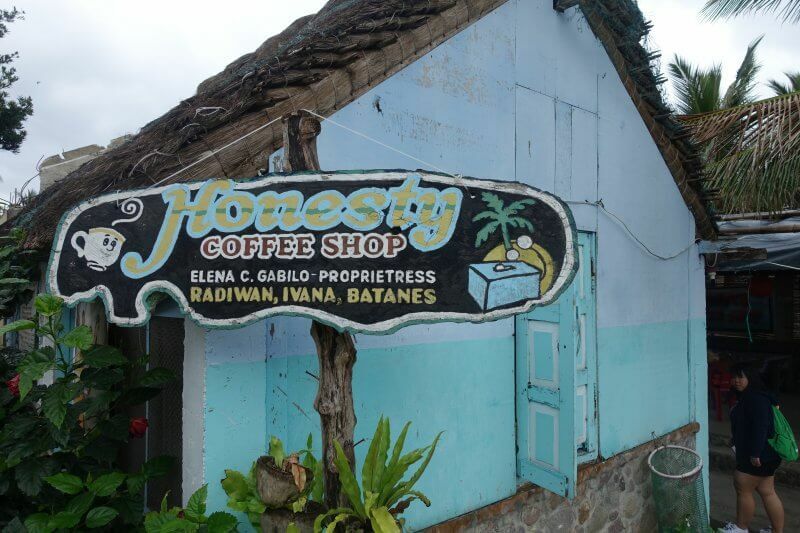 The Honesty Coffee Shop, in Ivana, Batanes. 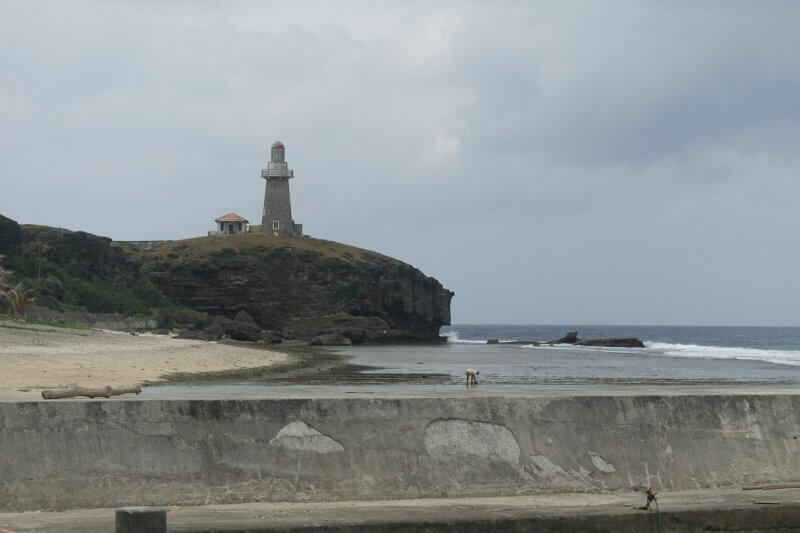 This seemed to be one of the more popular spots around, going by the crowd (certainly not big by normal standards, but big for Batanes). We got some locally made chips and cookies here. Another view point! Much less crowded here, and a nice view of the winding National Road. 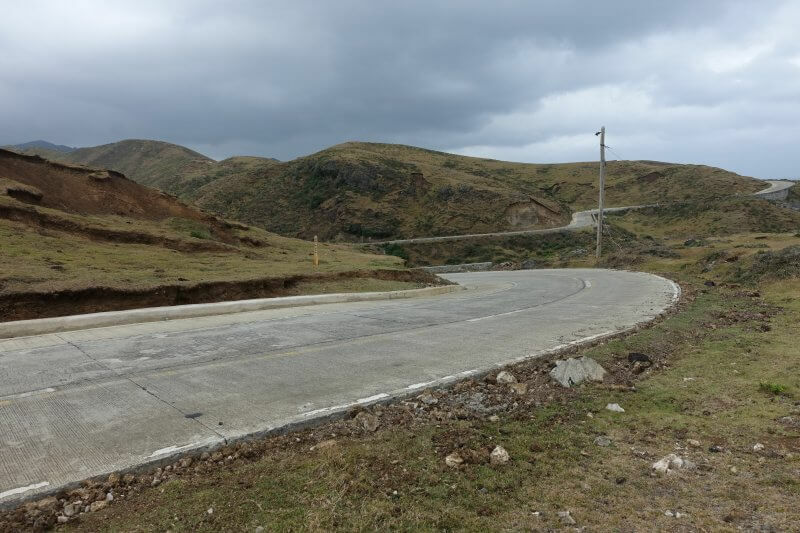 The National Road, curving around the hills and coastline, at Motchong View Point. The other side of the hills, the deep blue sea. 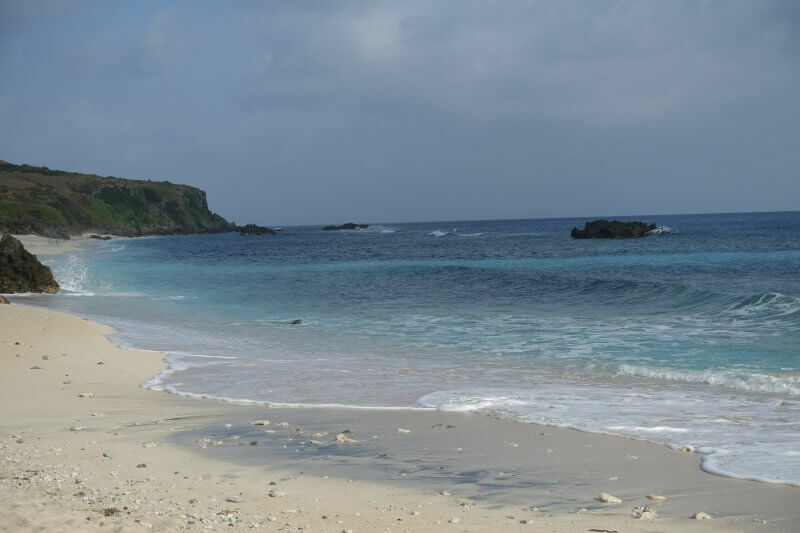 At the Song Song Ruins, an entire village abandoned after a tsunami hit in the 1950s. We didn’t get off the van for this one. It is also prohibited to get too close as the buildings are unstable. The ruins can be seen in the distance. What else, but another spectacular view point! A little to outside the left of the picture below is the abandoned US coastguard station (LORAN), in the process of being transformed into a museum. Looks shallower on this side. The narrow break in the rocks is where the road runs through, the ultimate blind spot. Signs before the bend remind, blow your horn when coming through! Dessert! Fruits and jelly. Not sure if this was local food though. We had visitors outside the open air, thatched roof restaurant. After a satisfying lunch, we stepped out at the other end of the restaurant and was greeted by this spectacular view. 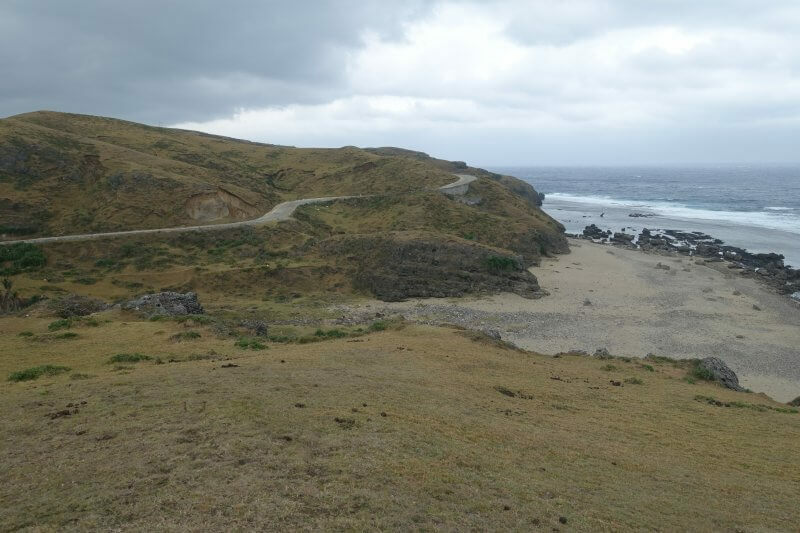 Marlboro Country/ Racuh a Payaman, Batanes. 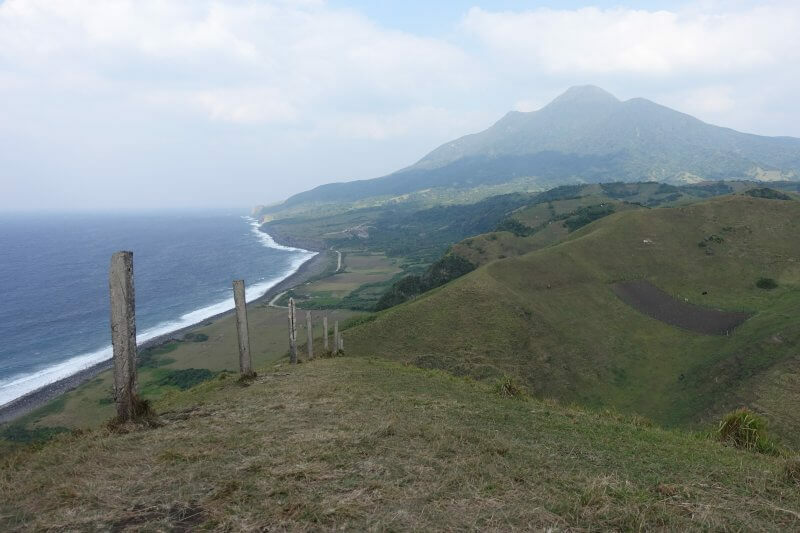 From here, we can see all across Batanes, to the thinly concealed Mount Iraya at the end of Batan Island, an active volcano. In the other direction, facing the sea, and the mighty Mount Iraya in the distance, its summit concealed by the dark, hanging clouds. From the top of the hills all the way to the bottom, we had a drive through the village. 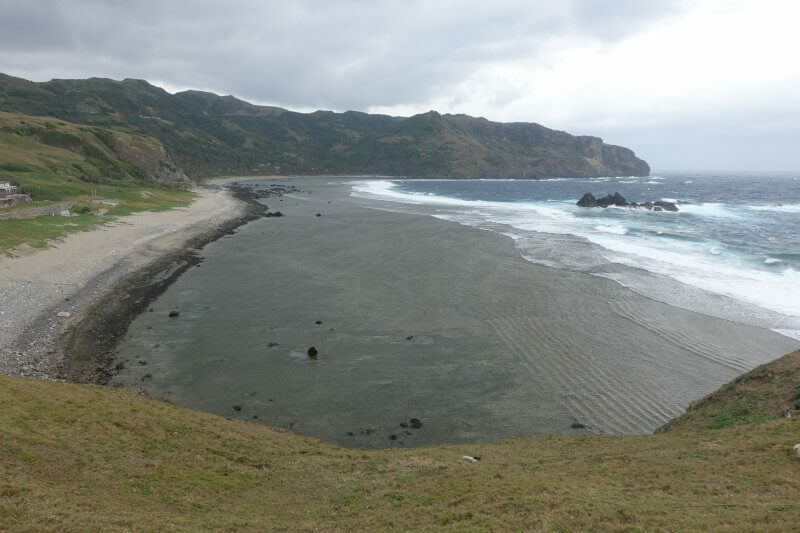 Another interesting side of Batanes. Driving through Diura Fishing Village. From the fishing village at the sea, we drove all the way uphill again, to the Tayid Lighthouse, sitting pretty at the top of a hill. Tayid Lighthouse, perched high on the hills. Not an old or historic one, but no less a beautiful one. 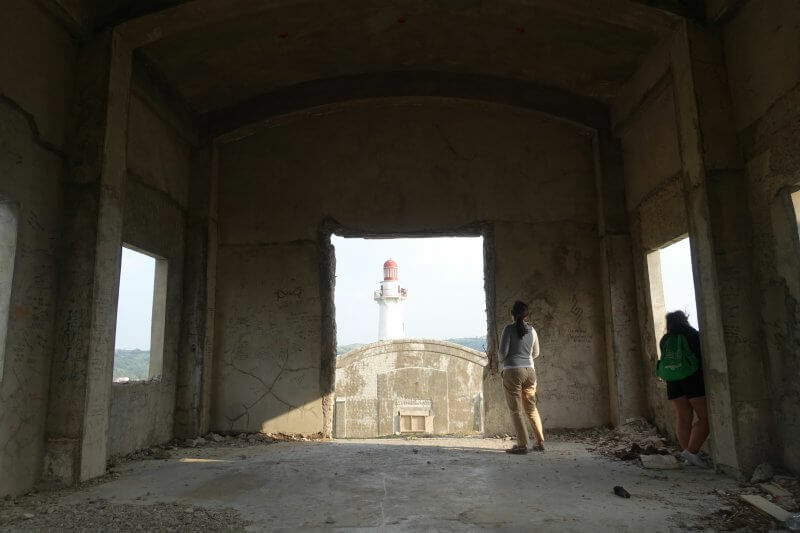 This is a private lighthouse, but the areas around it are open for exploring. From the lighthouse we can see Diura Fishing Village, which we just came from. Looked so far away. 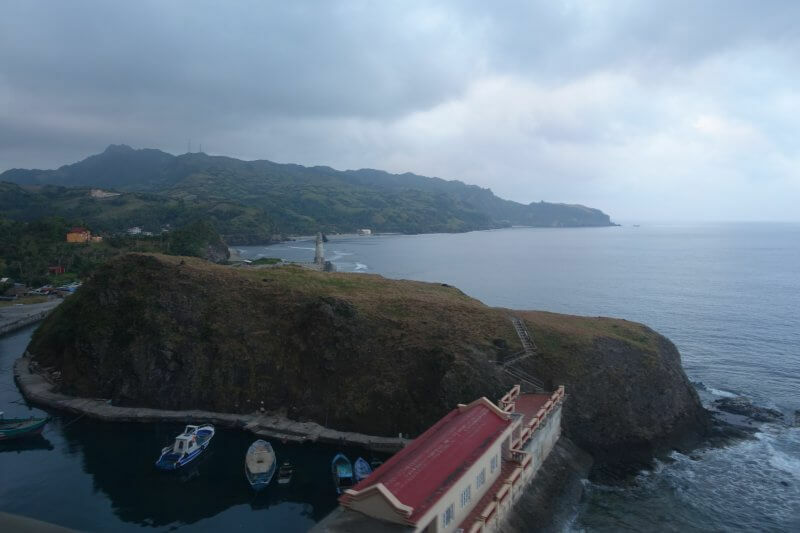 Sneaked a peek at Diura Fishing Village from Tayid Lighthouse. 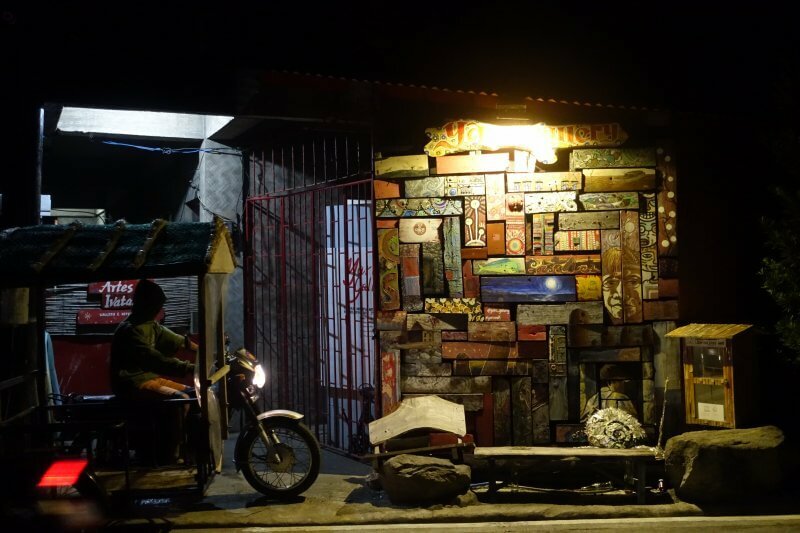 We checked out another restaurant in Basco, D’Islands, for dinner, and had a walk around town after that. 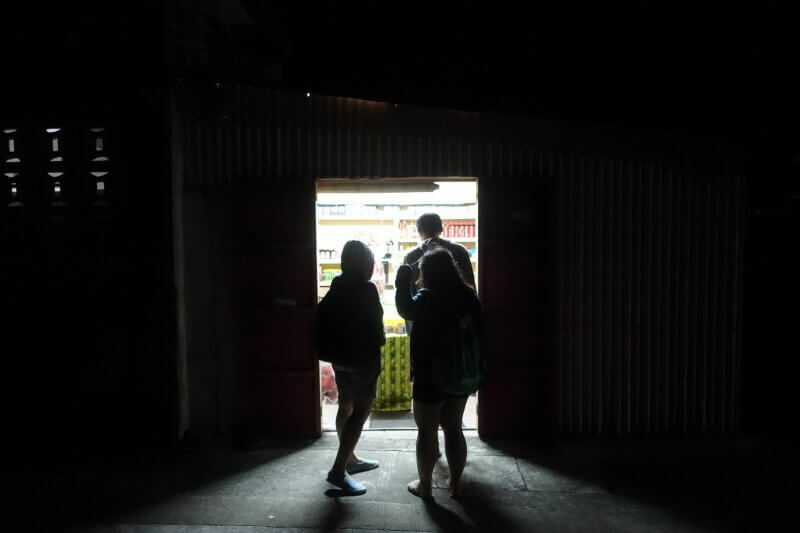 Last customers at a grocery store. getting our night snacks. Weather on the last day of our tour was definitely much better than the day before. We had a good sleep as the North Batan tour starts the latest of the 3 days, around lunch time. Always nice to start with some good food, and the first stop on our third day was at Vunong Dinette, for an authentic Ivantan lunch (by reservation only). 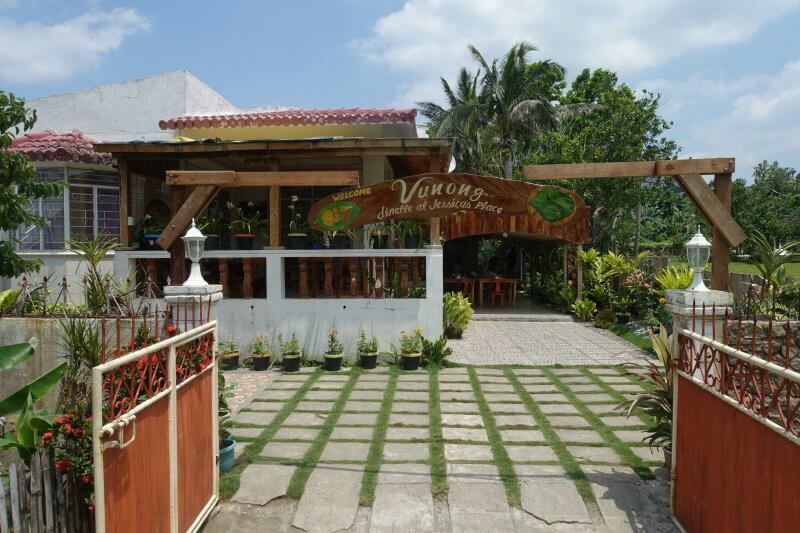 The homely and welcoming Vunong Dinette. 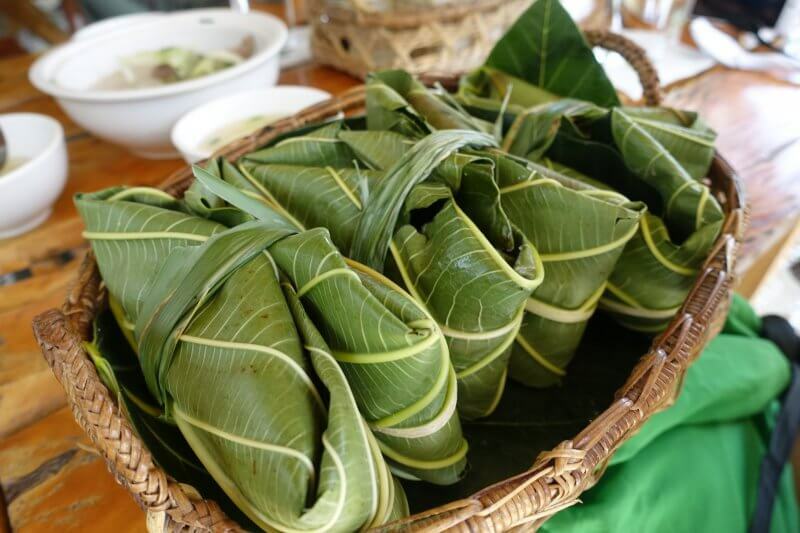 Food comes prepared in the breadfruit leaf, one portion for rice, and another for the meat. 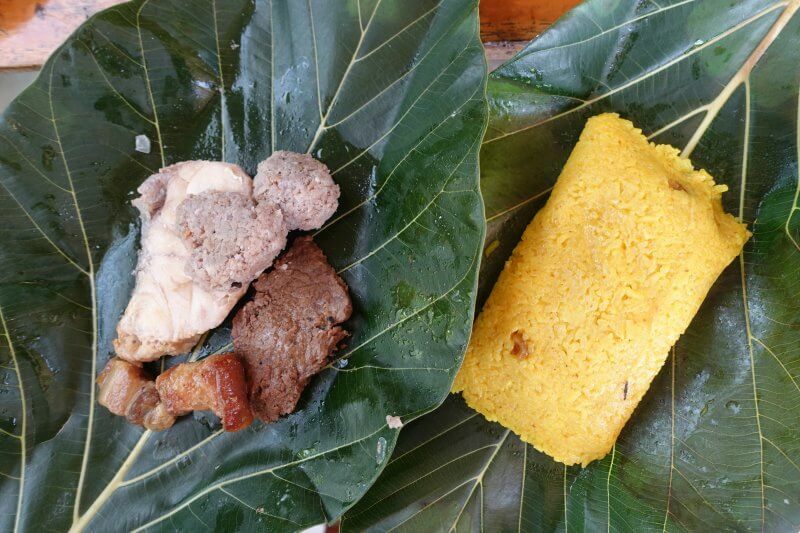 Tumeric rice, lunez (fried pork), uvud (some ball made from fish, meat and some part of the banana plant), and a slice of fish. 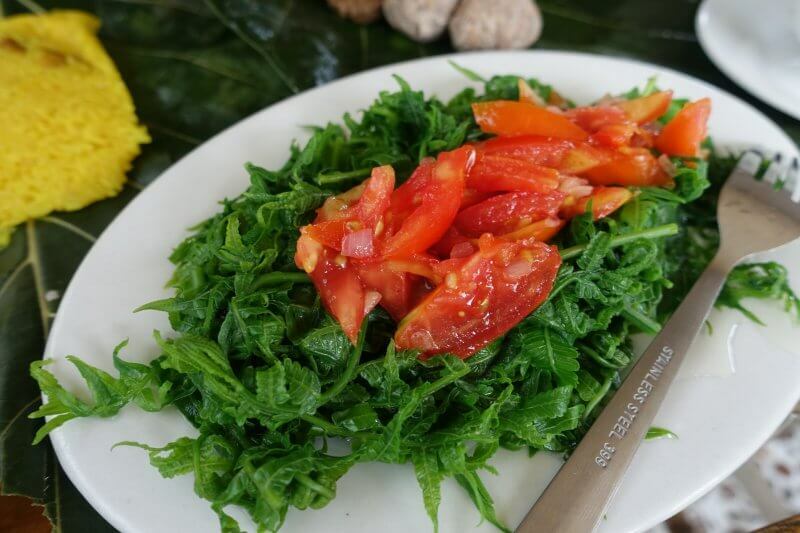 Pako (fern) salad, incredibly fresh. 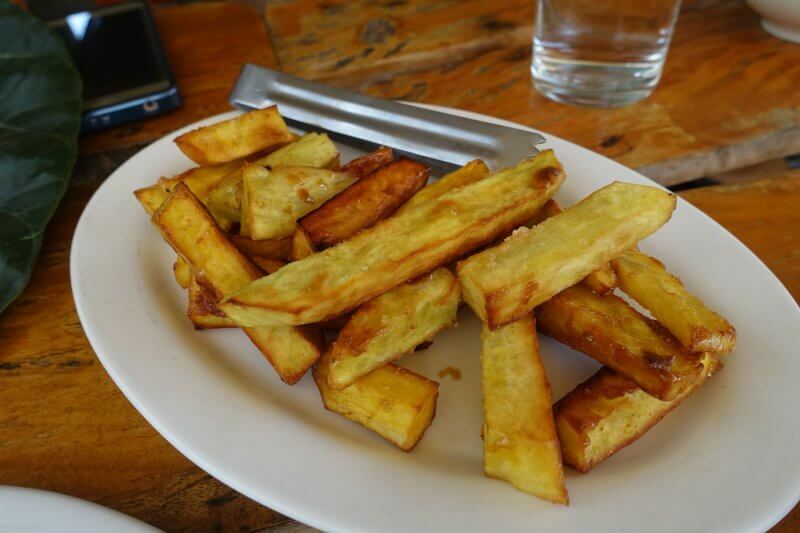 And yummy fried camote for desserts! 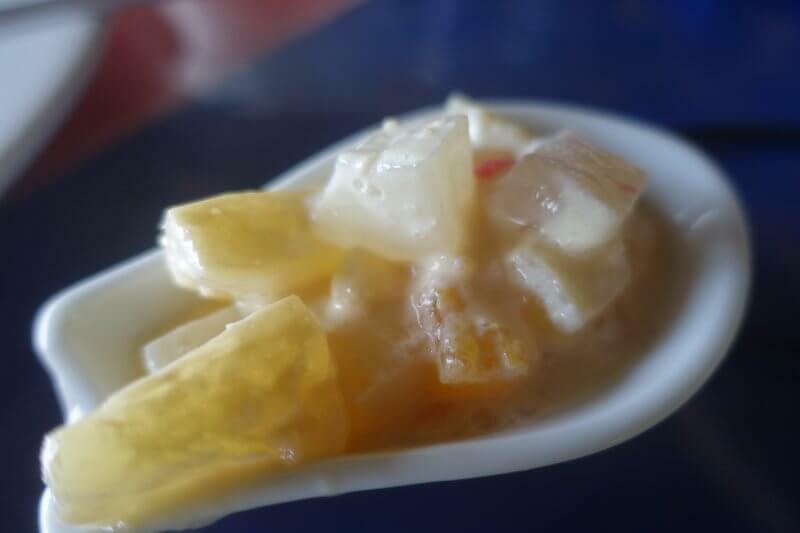 Definitely a must visit for Ivatan food, loved the experience. And for a change, not a view point. A little stone chapel stands high up on the hills, defiant of the elements. Mt Carmel Chapel was a little crowded when we got there as there was a delegation visiting at the same time. We took a look around before we quickly left to go further uphill, as it was getting too crowded. Usually tours follow similar route, so we tried to escape the crowd by going a little quicker. Mt Carmel Chapel from further up the hill, along the way to our next stop. 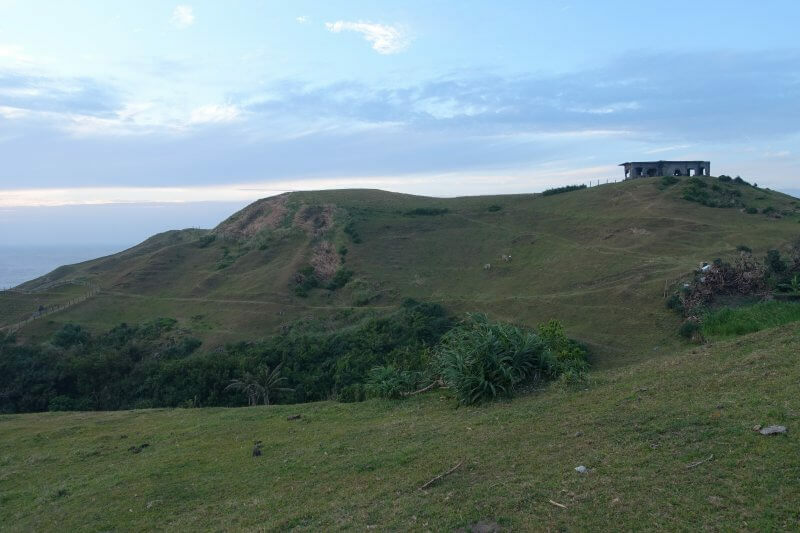 The PAGASA “Tukun” Weather Station stands at the top of one of the taller hills in the middle of Batan island of the Batanes. We were fortunate for the superb weather that day and the views were breathtaking. Apparently the summit of Mount Iraya is seldom seen as it is often shrouded beneath clouds, so we were really lucky to catch a glimpse of it! Mount Iraya, as seen from the weather station. 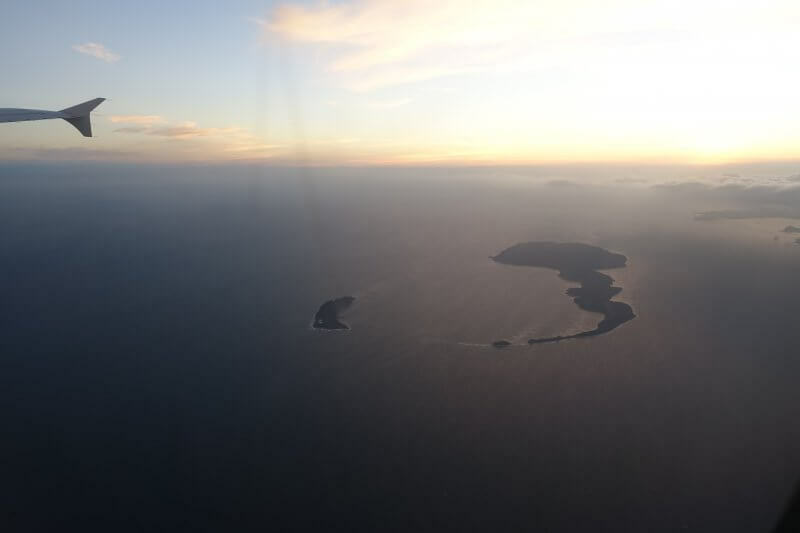 To the left, at the foot of the volcano, the airport runway, and to the right of Mount Iraya, the Pacific Ocean. 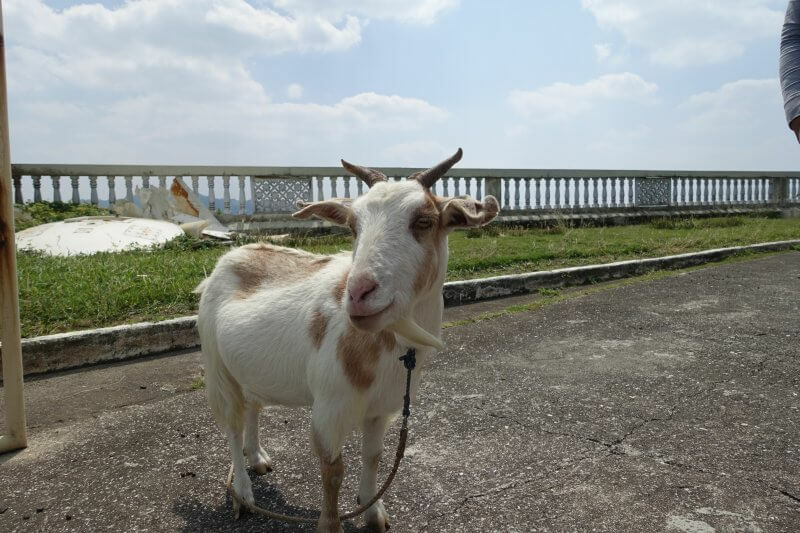 Looks like guard dogs aren’t cool here, guard goats preferred instead. 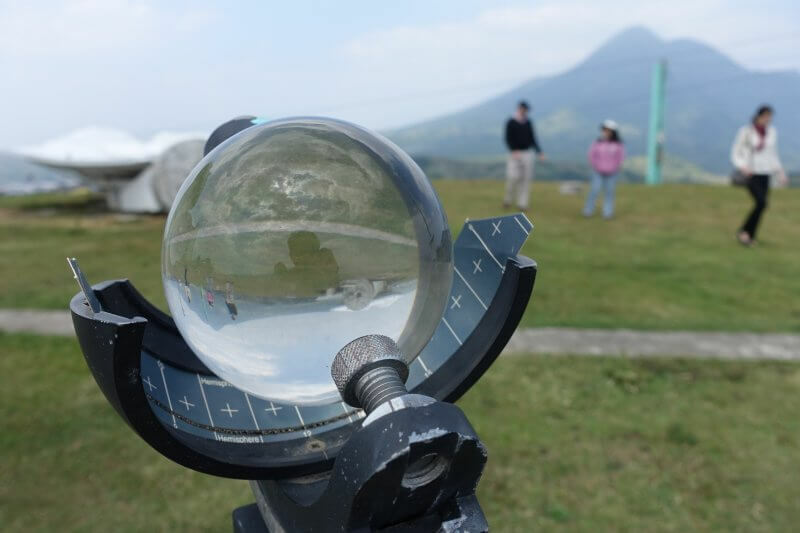 Lots of damage from Typhoon Ferdie in September 2016 can be seen at the weather station (April 2017). 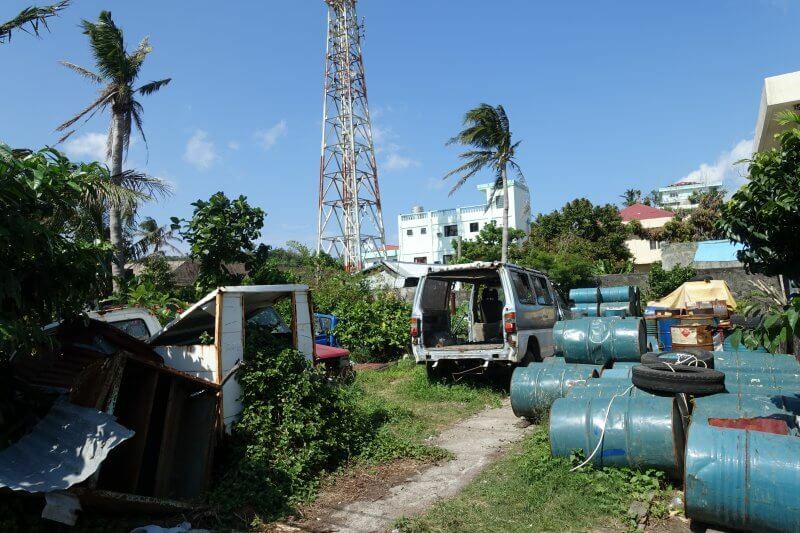 Collapsed satellite dishes, blown off weather balls, and more. Typhoon Ferdie firmly left its mark here, there was supposed to be a globe like structure where now only fragments remain. There were still some interesting instruments standing, like this sunshine recorder I haven’t seen before. Really cool how the glass sphere focuses sunlight on to the card to burn a mark on it. 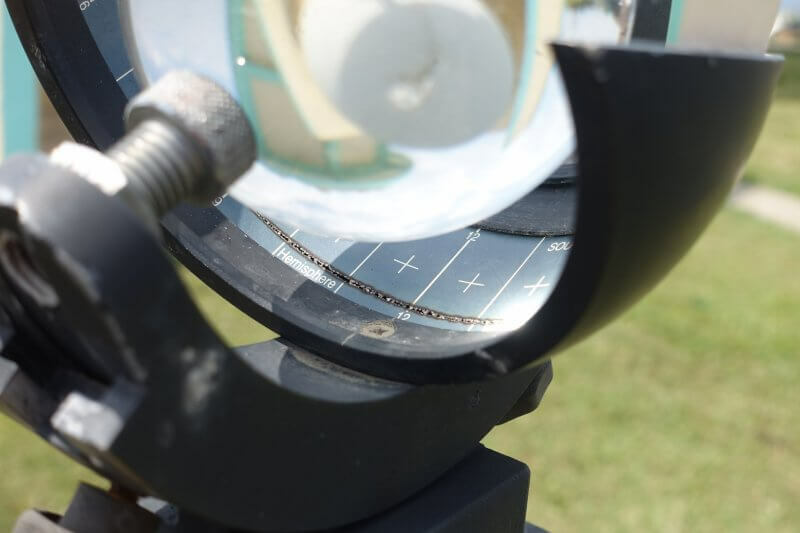 A Campbell-Stokes recorder, which records the amount of sunshine received in a day by burning a mark through the card as the sun moves across the sky. The glass sphere also makes for pretty photography opportunities. The Dipnaysupuan Japanese Tunnel was built by the Japanese (duh) during World War 2 as a lookout and gun placement. Kinda dark and tight inside, would be good with a torch light. 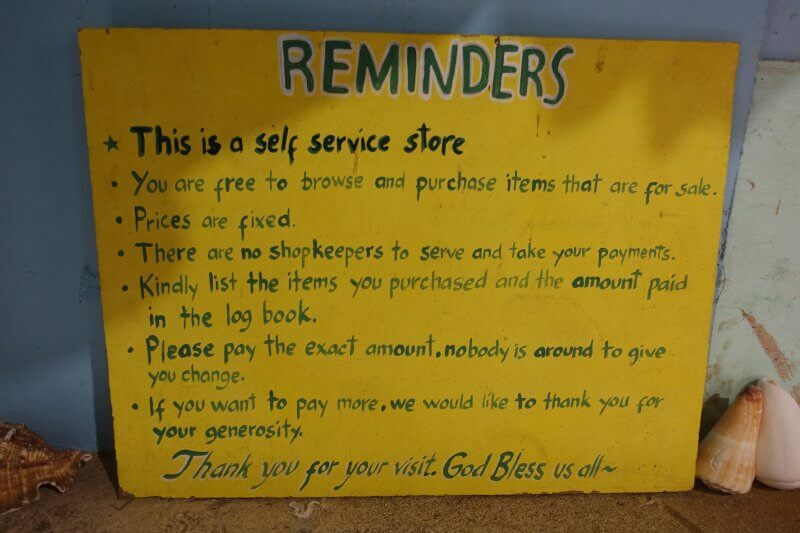 I think the entrance fee is covered if you present the tourist ticket obtained at the airport upon arrival. The open areas are quite small and won’t take long to explore, nonetheless something interesting, and the view from the above the tunnels are great too. 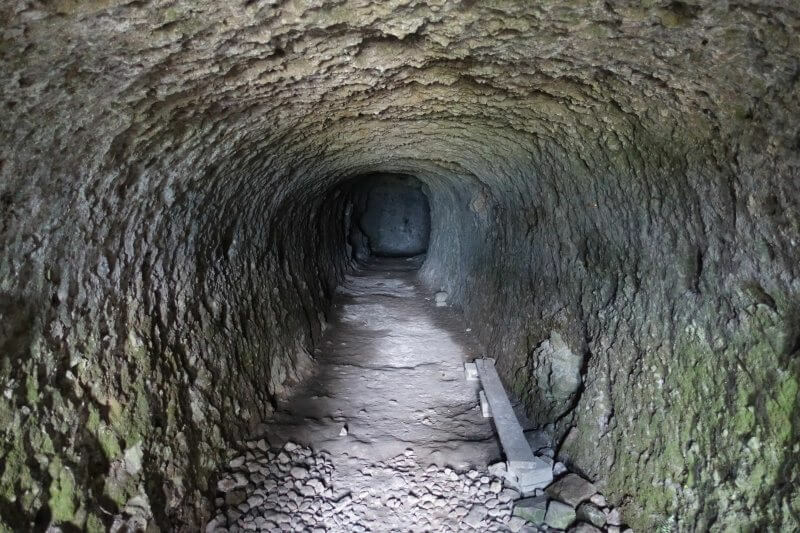 Dark and narrow tunnels. Would be good to bring a torchlight! 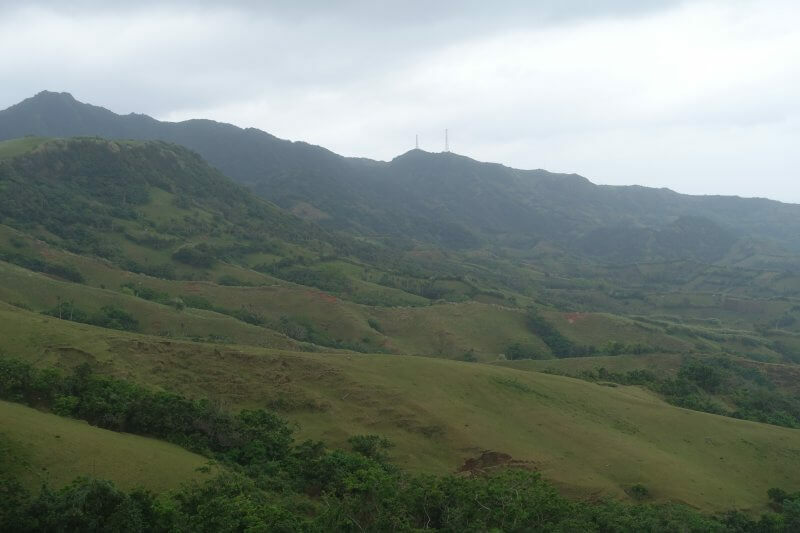 View over the hills from the Dipnaysupuan Japanese Tunnels. In ancient times, before the arrival of the Spanish, Ivatans used Idjangs (fortresses) in times of war. 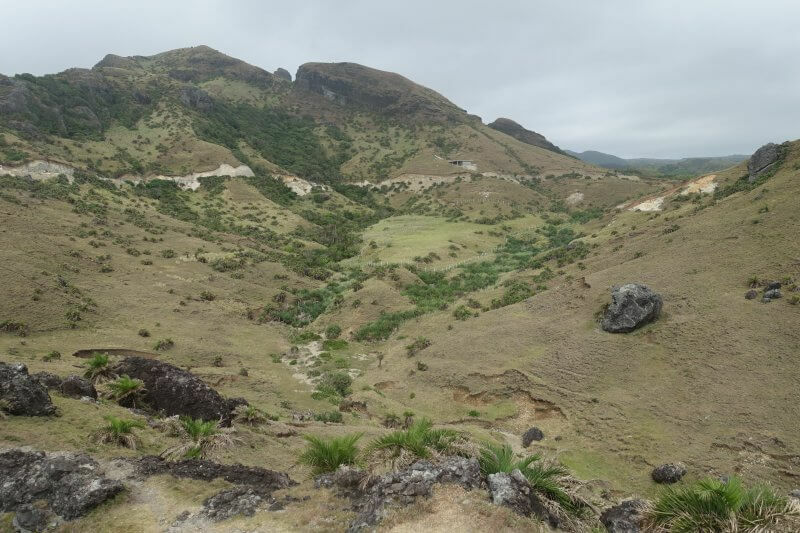 These structures, built on hills, lost their purpose during the Spanish colonisation and were long lost, until archeology experts from the National Museum of the Philippines rediscovered them in 1994. 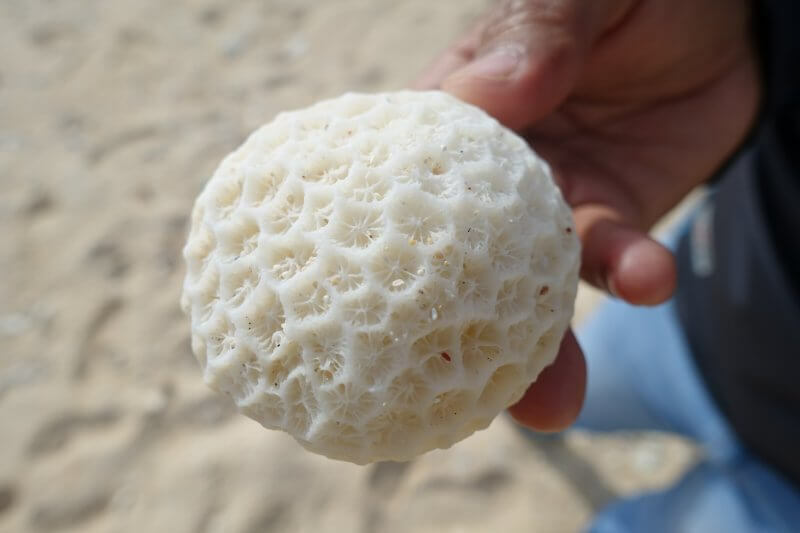 A few of them have been found all over Batanes, and more may remain undiscovered. 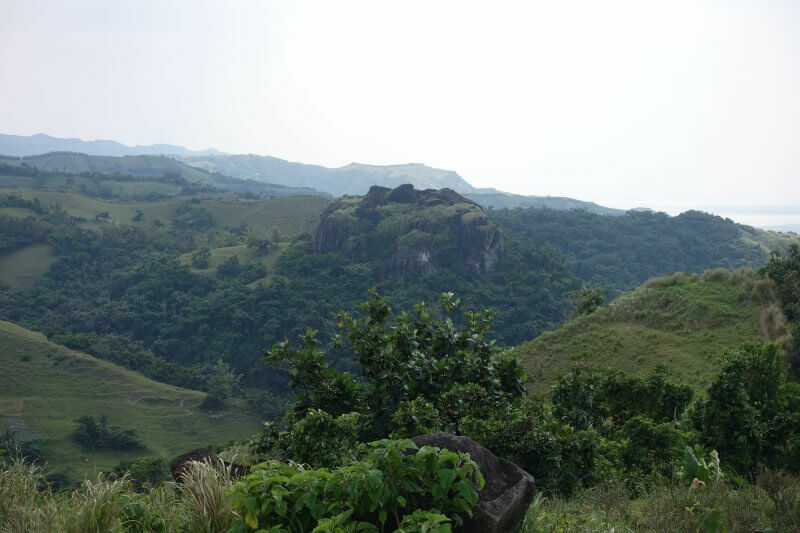 Basco Idjang, fortresses of the Ivatan. 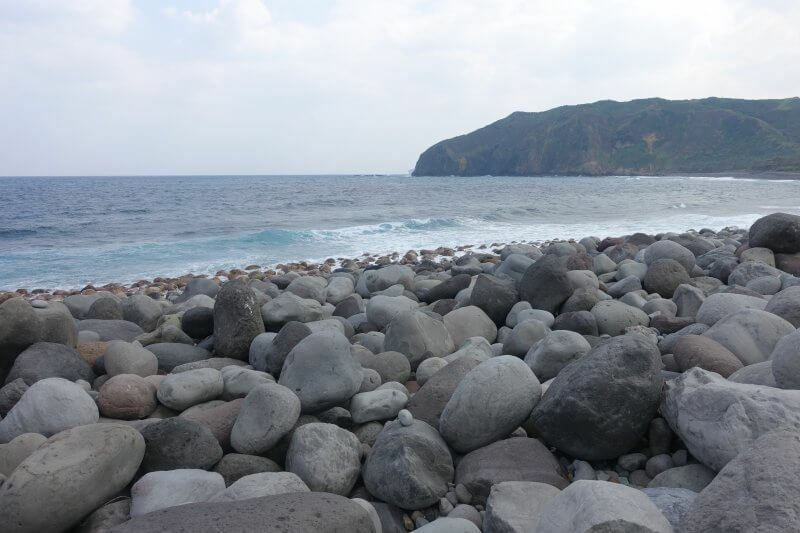 From high up in the hills down to the coast, this is one special beach as instead of sand, the beach is covered in small boulders. Boulder littered Valugan Boulder Beach. Racing down the road, back down below the hills. 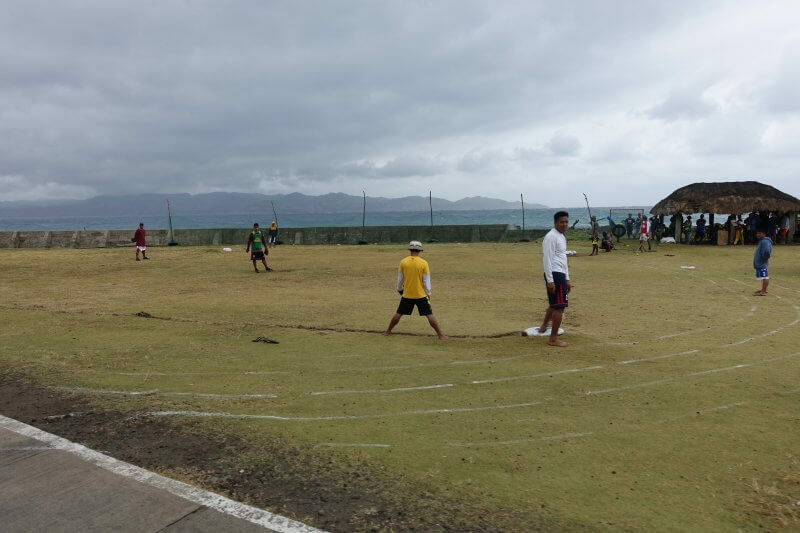 Running along the Basco Airport runway. 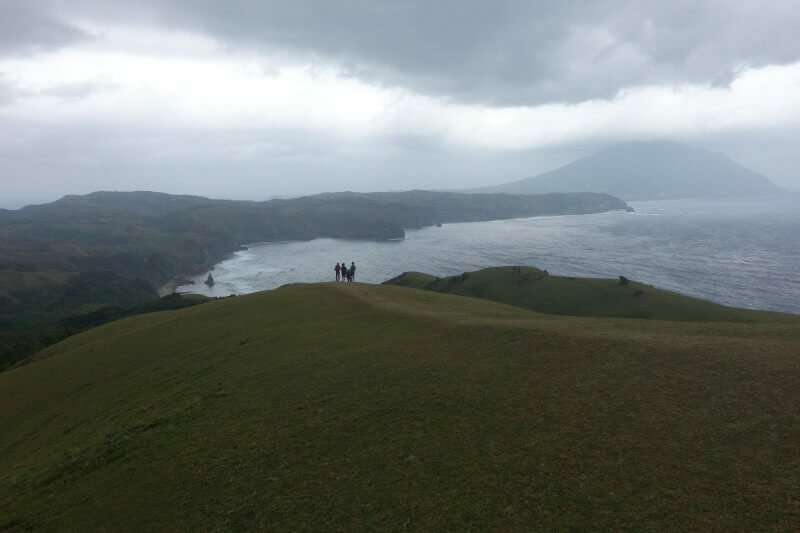 Our final highlight of our 3 days Batanes adventure, the Vayang Rolling hills! 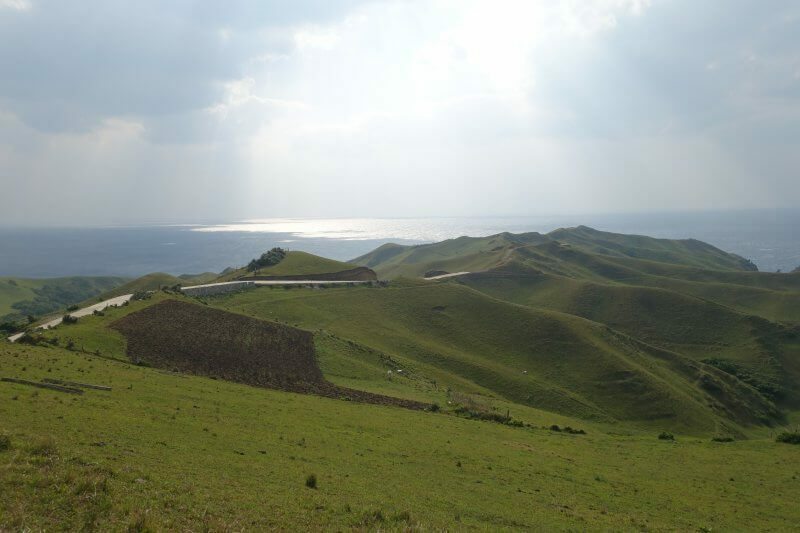 This is actually a ranch where you can spot grazing animals. I could roll all day in this bliss. Roll over and you’re off to the West Philippines Sea (or South China Sea). 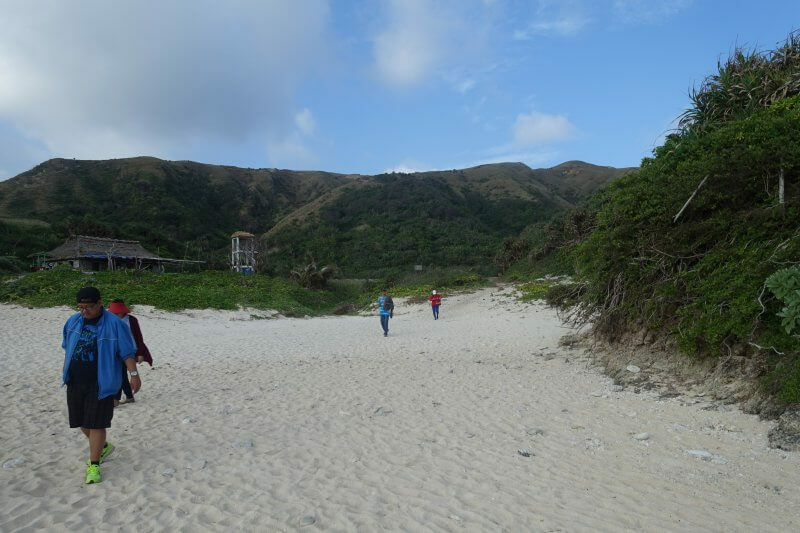 We left the Vayang Rolling Hills just before large crowds rolled in, and off to our last stop, which coincidentally was also our first stop of the trip, the Basco Lighthouse and Bunker Complex at Naidi Hills. We were supposed to be here to catch sunset but we were a little too early for that. Spent a long time chilling on the grassy hills here where it isn’t too crowded or windy, and left way before sunset still. 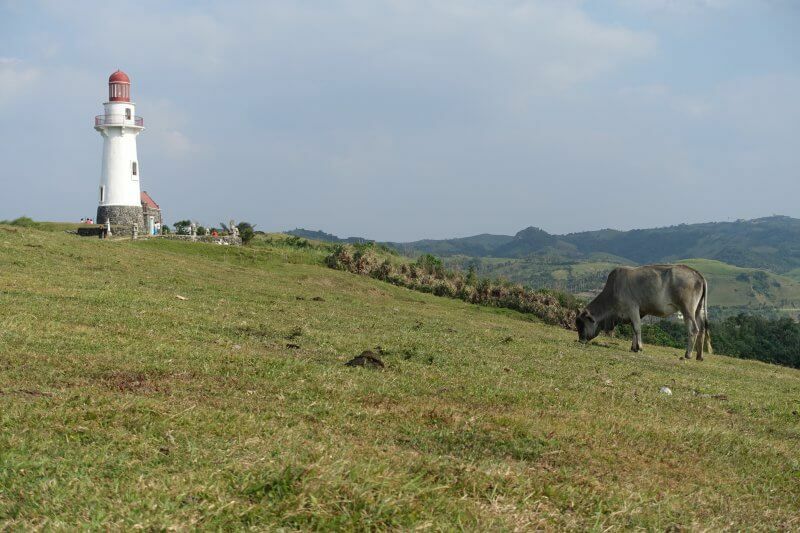 The cow and the lighthouse. 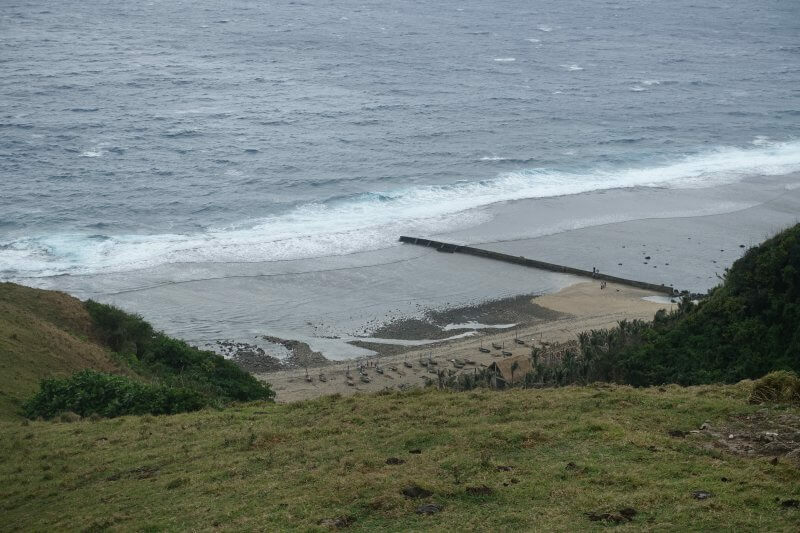 The bunkers were built as signal stations by the Americans before World War 2, but got quickly taken out by Japanese bombers before the Japanese troops took over. One has been converted into a cafe while the others remain slowly crumbling. 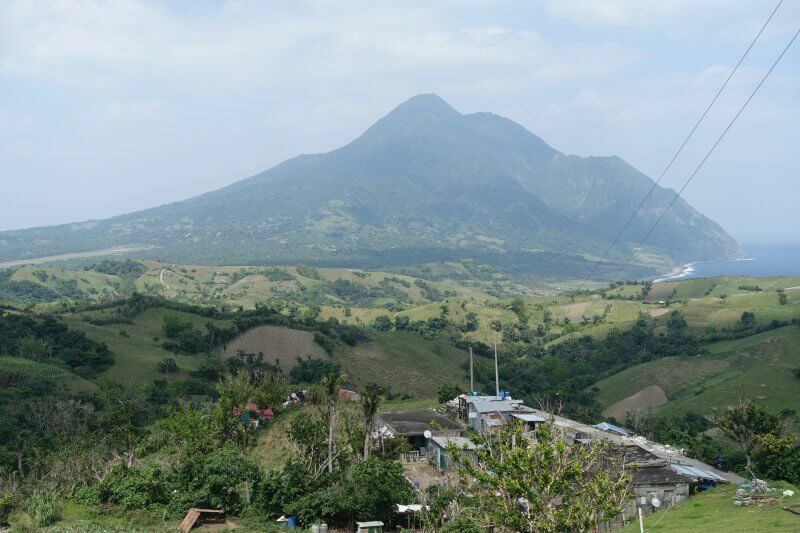 Nowadays a favourite haunt of tourists, cows, and carabaos. Inside one of the bunkers. 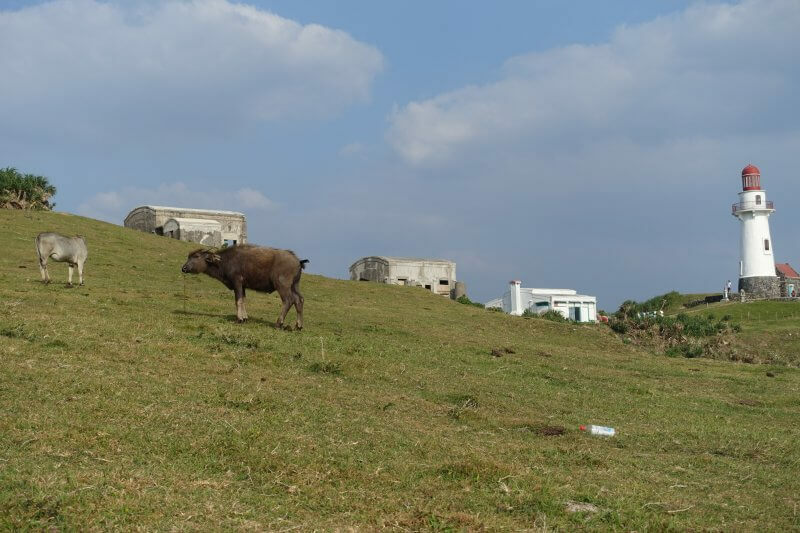 Bunkers, lighthouse, cow and carabao lined up on the hill. 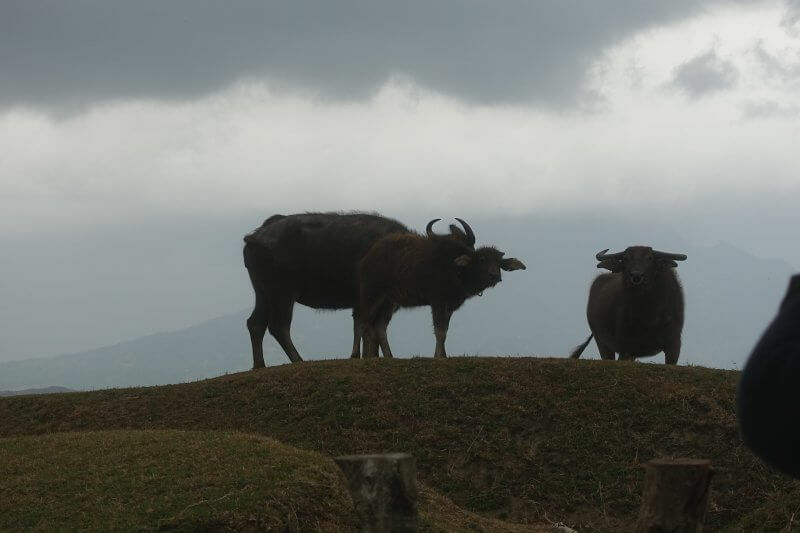 The carabao,the darker coloured one in the picture, is a water buffalo native to the Philippines. We saw some the day before while at lunch at Marlboro Country. 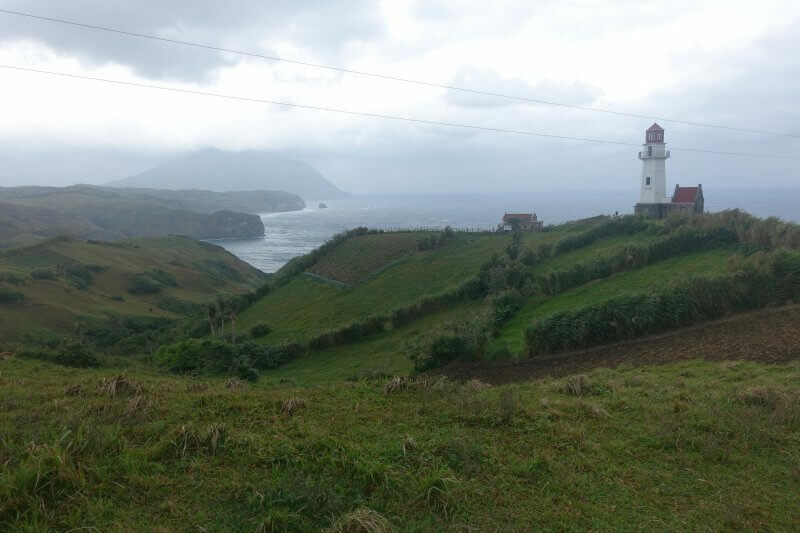 Last few looks across the beautiful island paradise of Batanes. Or rather Batan, as we are on now. 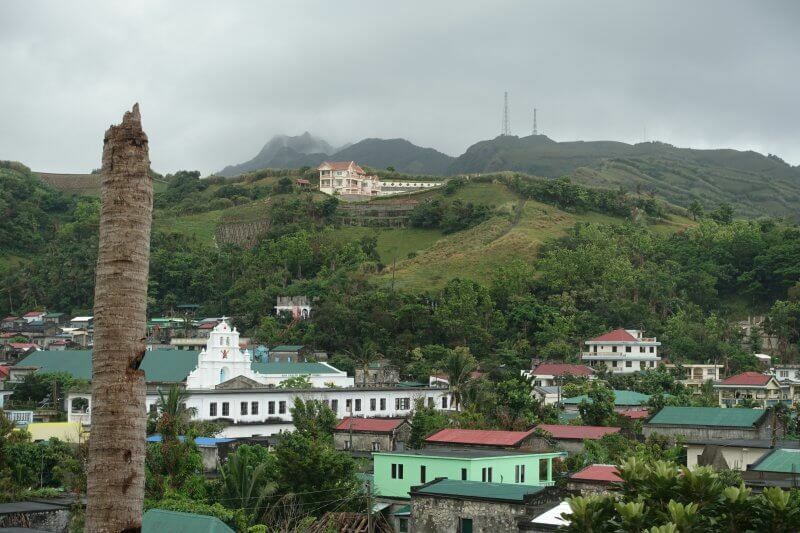 On the other side of the lighthouse, the active volcano Mount Iraya looming over the town of Basco. 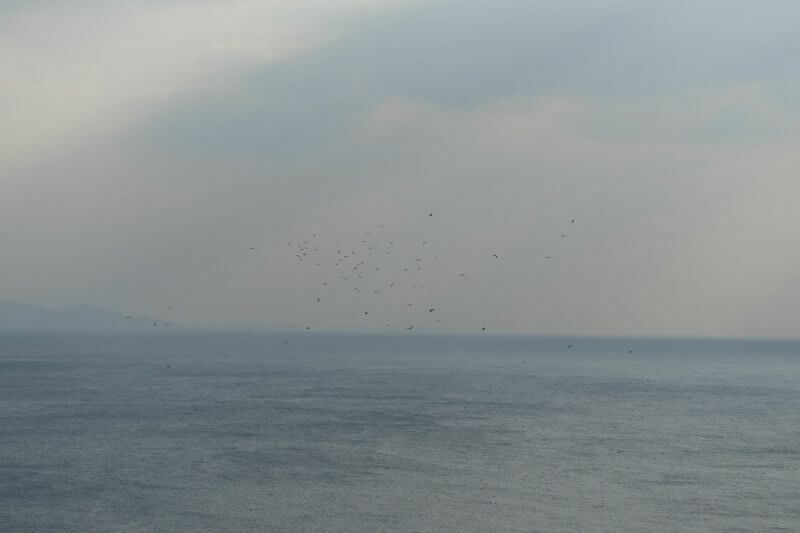 Just before we left, we caught sight of a large flock of birds flying over the ocean. Can’t see clearly in this shot, but quite a majestic sight. 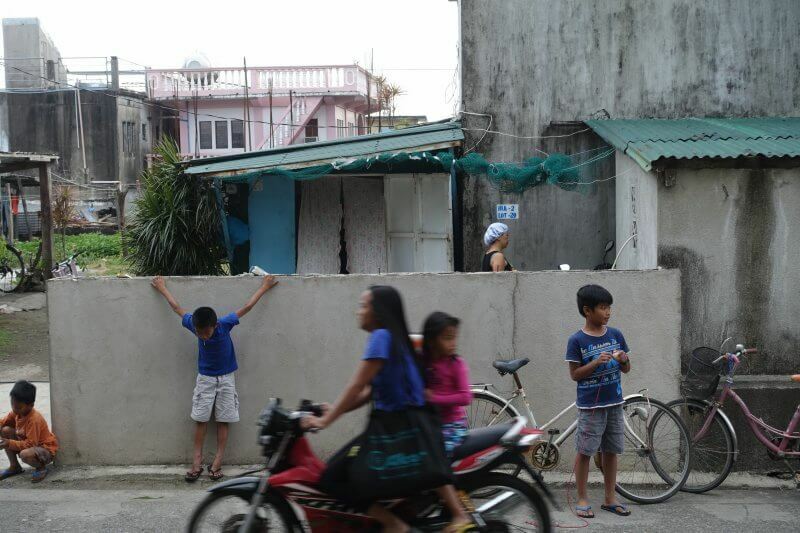 Back at our guesthouse, kids and adults getting about their stuff. We tried star gazing that night, but as with the previous nights, skies were unfortunately cloudy. Good reason to get more sleep. We were after all, on holiday, and needed to catch up rest before heading back to work in a days. 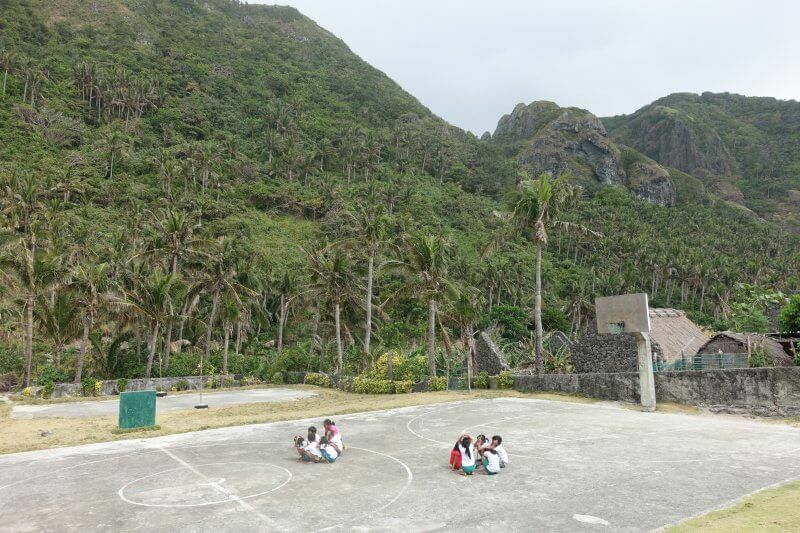 Day 4: Dios Mamajes, Batanes! We got up early, way before sunrise, all ready to head back to civilisation (with WiFi). Had to arrive early as there were no X-ray machines and luggages were manually checked. First sign of things not going right, there being no planes on the tarmac shortly before the scheduled flight. We were informed of a 2 hour delay. Not too bad, considering we had a half a day gap between our flights from Basco and to Singapore. Then another additional delay announcement, before it was confirmed to be cancelled. We started to get anxious. 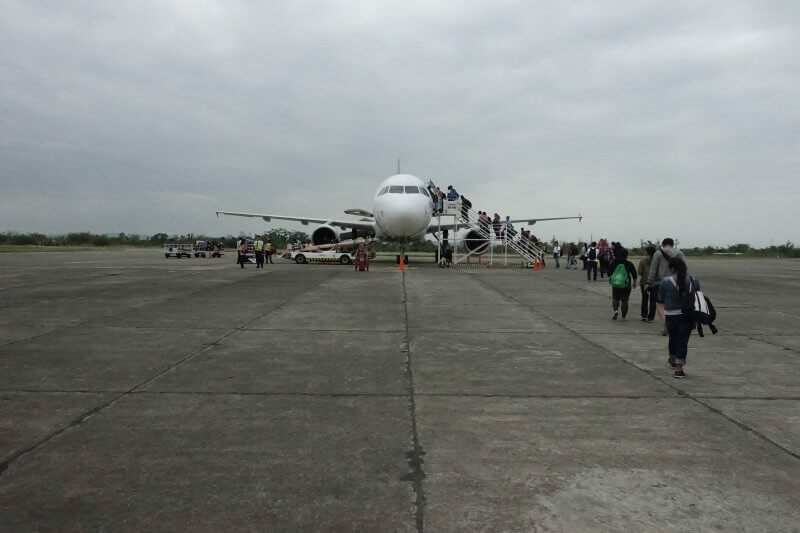 We couldn’t rebook our Manila-Singapore flight without internet, and the replacement plane, being smaller than the scheduled plane, would take a few flights to get everyone off the next day. 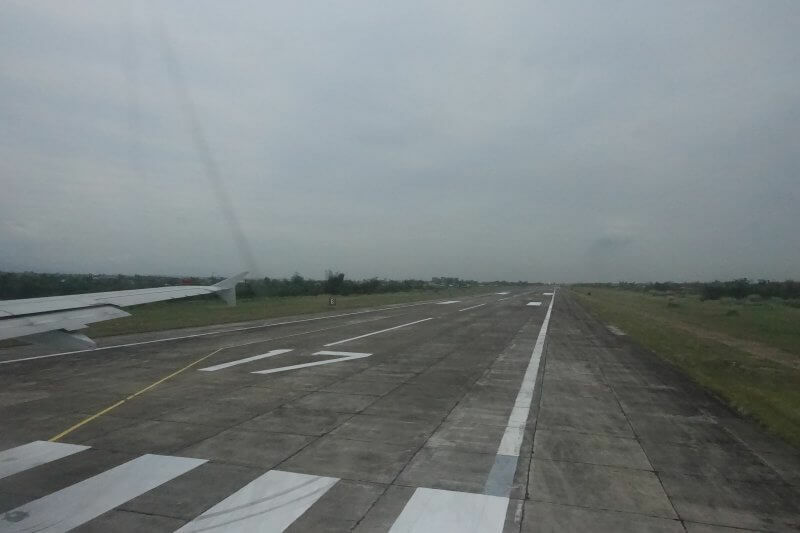 Given the shorter runway at Basco, few plane can land there. Finally, some hope came in the form of a small, 15 seater that would be arriving later that afternoon. The other passengers were probably the chillest people I’ve seen. After the cancellation, they calmly sat back into their seats while waiting for anxious passengers like us to clear. 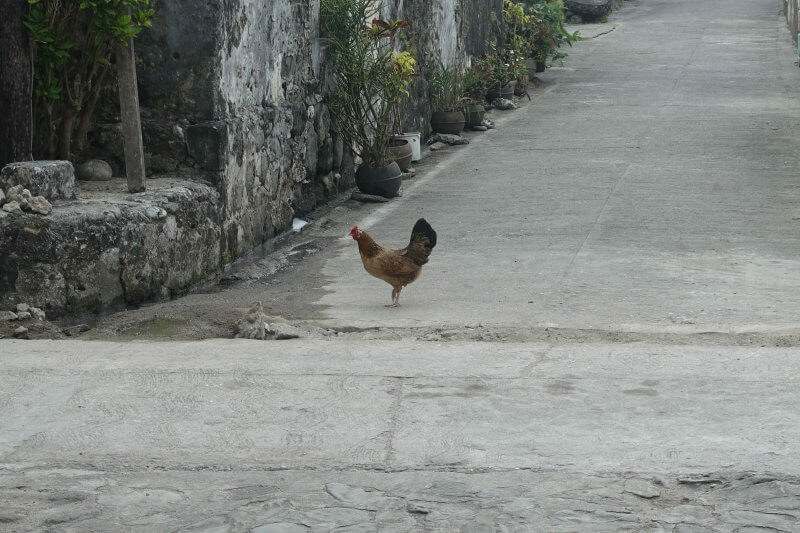 Turns out some are experienced with travel to Batanes and were mentally prepared for such circumstances. 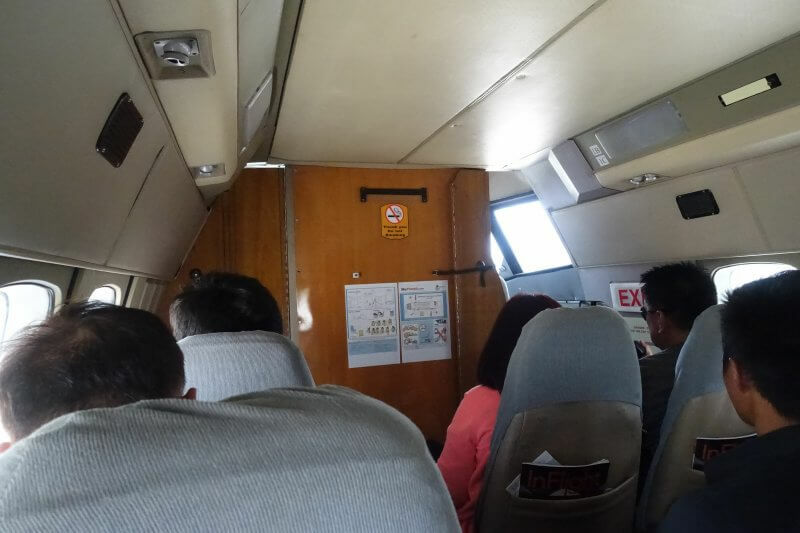 Fortunately, we we allocated seats on the scheduled flight to Tuguegaro, as we explained our circumstances, and the staff were really nice about it. Not exactly the flight to Manila we needed, but there was better hope getting from Tuguegaro back to Manila in time. Boarding the plane was another experience in itself, as everyone had to be weighed (as in everyone, not just the bags), and handwritten boarding passes were used. The plane also ran a little late, and with each hour passed we got another hour closer to missing our flight home. Boarding the small plane to Tuguegaro. There were no safety briefs, everyone just buckled in and off we went. 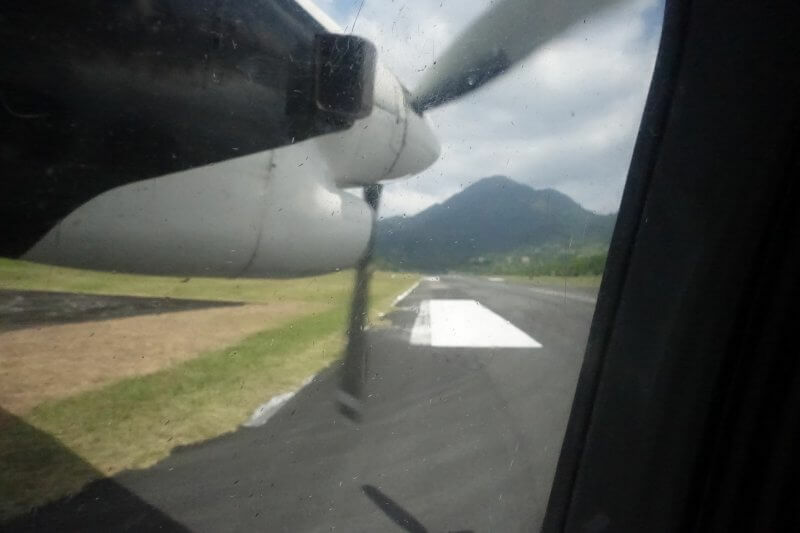 Last look at Mount Iraya, down the short runway. 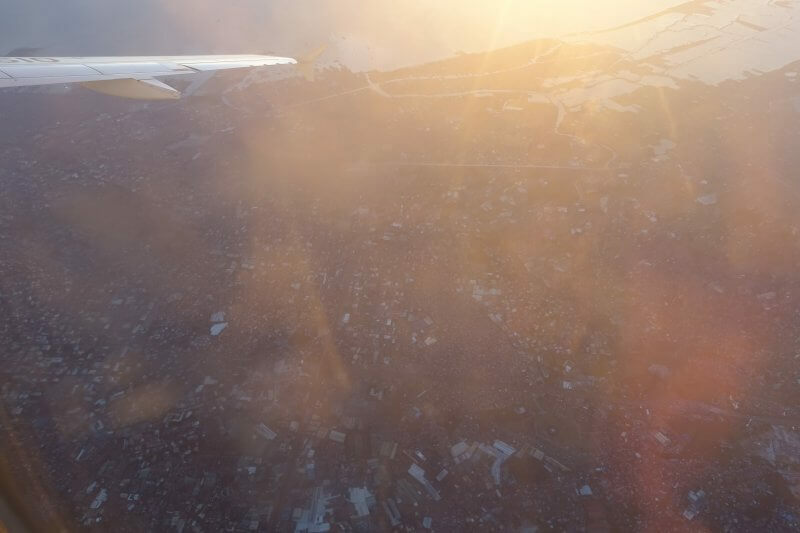 Given the small size of the plane, the plane lurched at every gust, and we couldn’t be more thankful for the really calm weather that day. 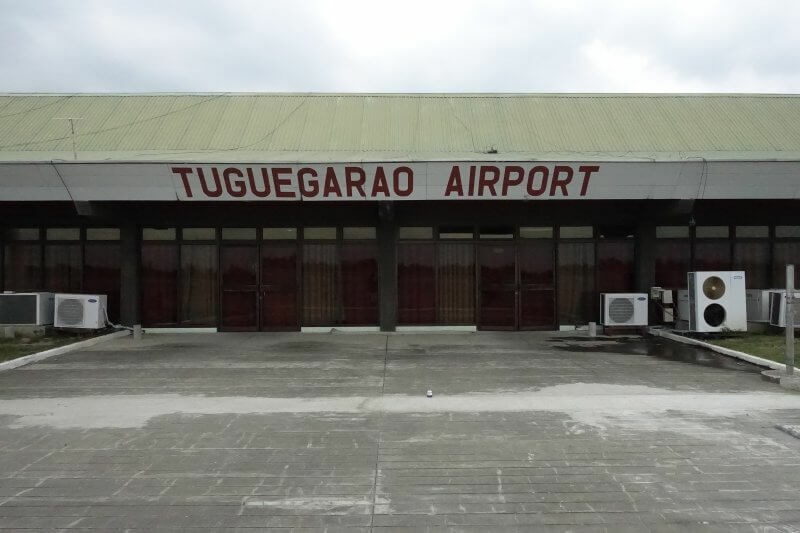 An hour later, we arrived at Tuguegaro Airport, and were surprised to find airport staff waiting for us, whisking us quickly to the departure counter to settle paperwork as the flight to Manila was due to leave soon. It was heartwarming knowing that the Philippines Airlines staff had made all these arrangements. To top it off, they got us each a McDonalds meal while we cleared baggage and paperwork. Despite us buying the Basco-Manila and Manila-Singapore legs separately, they helped us arrange for our baggages to go straight through. This, too, was a little late, and counting back the hours, we were now really having back to back flights. Couldn’t do much at this point except to get ready for the dash through Ninoy Aquino Airport. 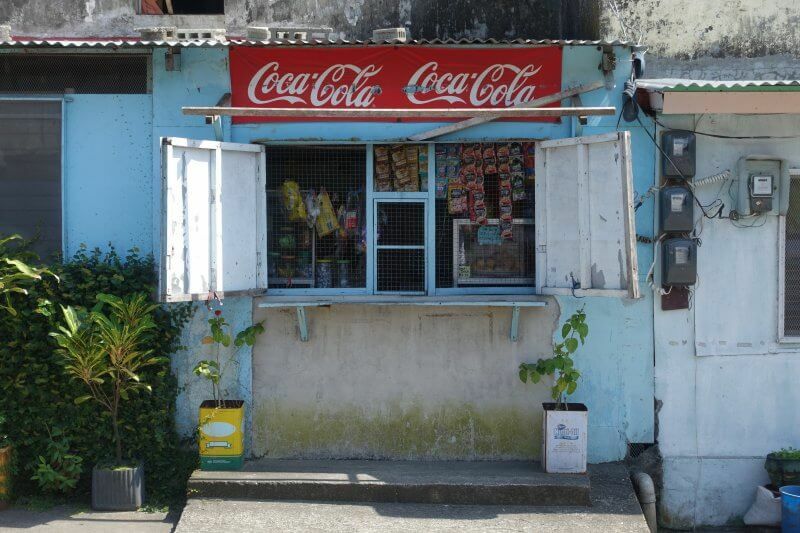 Meanwhile, we enjoyed the extra stop, a very different side of the Philippines I did not expect to see on this trip. Inch by inch, we’re getting home! 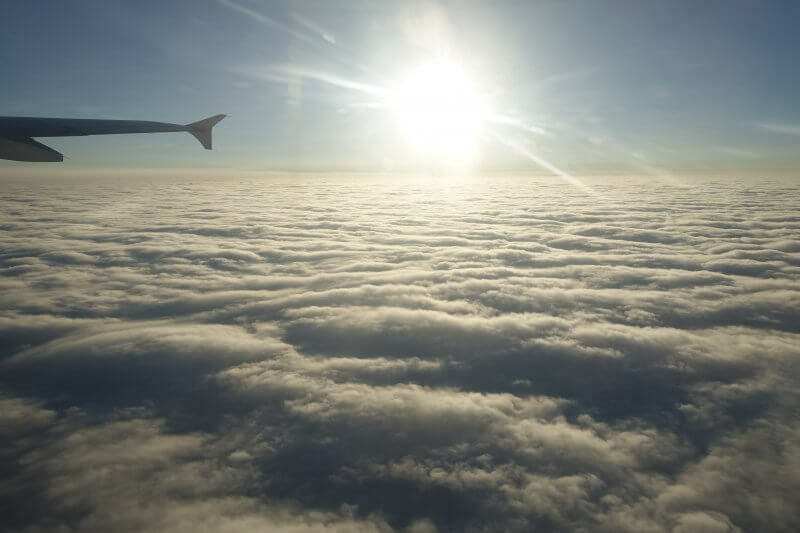 Up in the air, enjoying the view while we can. And over busy Manila, counting down to our flight back to Singapore. By the time we got off the plane, we had barely half an hour to spare. We made a dash for it, fortunately in the right direction, and found the check in counter. Staff were discussing if they should allow us on, as it was late by then. They got us to agree to run the rest of the way, and prepared our tickets. One of them accompanied us and made sure we really ran. What a workout. First time hearing my name called out over the announcement system, as it was last call by then. Philippines Airlines staff kindly arranged for us to skip to the front of the immigration queue, before we had to run again. Finally, almost at the end of the terminal, our flight was there waiting. We were coming home. Alas, our baggage didn’t make it and arrived the next day. Not that much of an issue, we’re just glad to have gotten our workout. And to be back home. 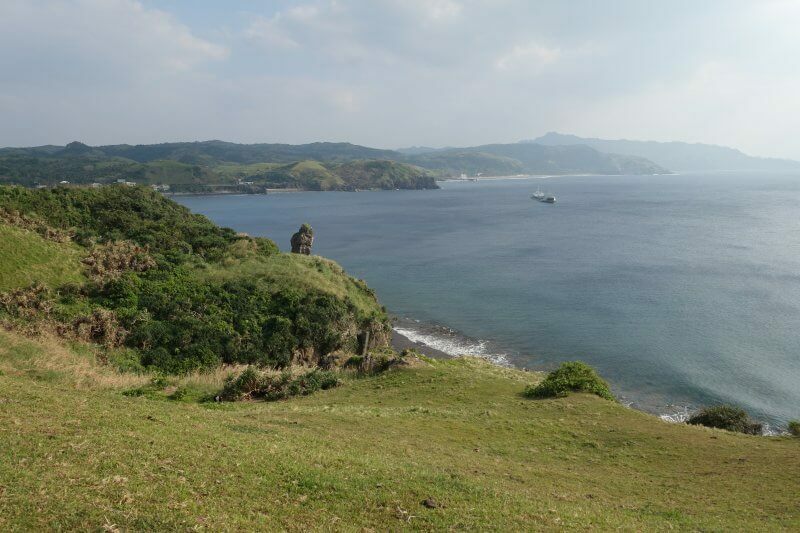 The best time to visit Batanes is from March to June, way outside typhoon season, and when there is more sun. A little on the pricier side this time, the tickets were on the higher side. Here’s a breakdown of what we spent on, per person. More than our ticket from Singapore to Manila! Probably on the higher side than normal. Ryan (owner of BISUMI) and Jane (our guide) ensured that we were well taken care of throughout our trip and made it a memorable one, would recommend BISUMI if you’re looking for an agency to cover your itinerary (this post is not sponsored by BISUMI). Total on dinners and lots of snacks over the 4 days. This is probably on the lower side, as we got a room with 2 queen sized beds for the 4 of us in a guesthouse that was under construction. 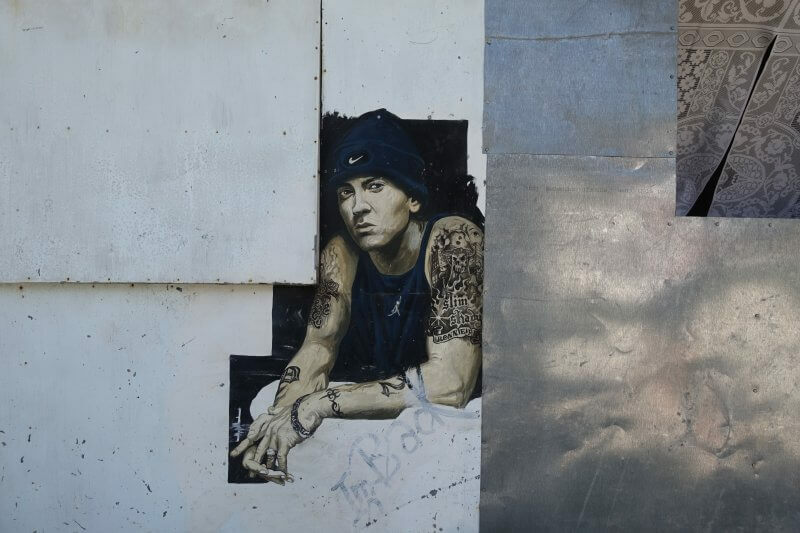 Thats all from me for now, till next time. 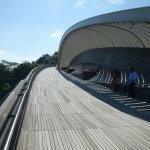 Looking for something more chill in Southeast Asia? Check out my guide to a chill weekend in Bali, away from the crowds, in Canggu! Or perhaps something more adventurous? How about 3 weeks solo traveling across Thailand? Read more here!